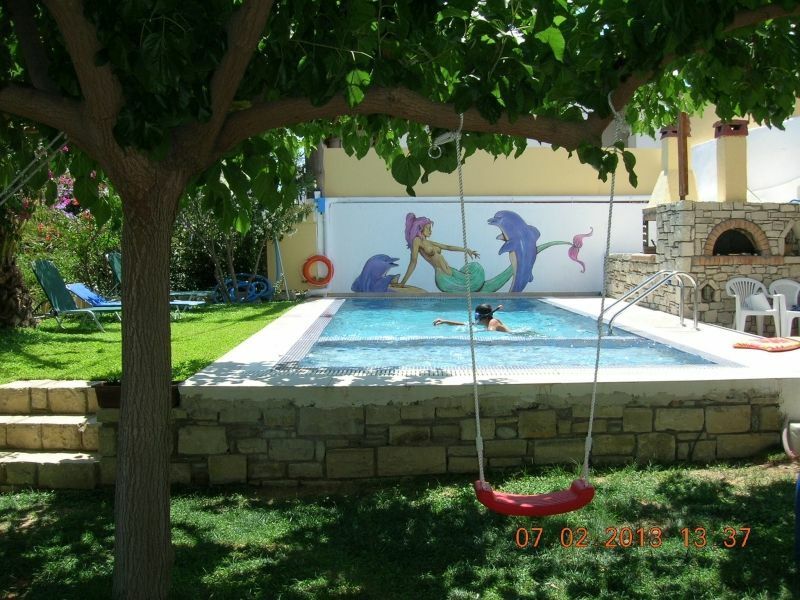 All cancellations 15 days before arrival date are free. 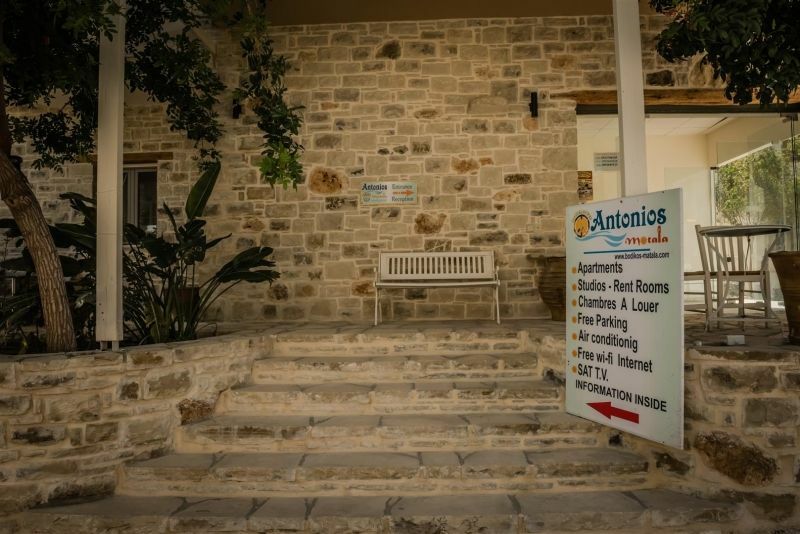 For late cancellations or in case of no-show, you will be charged the total amount of the booking. 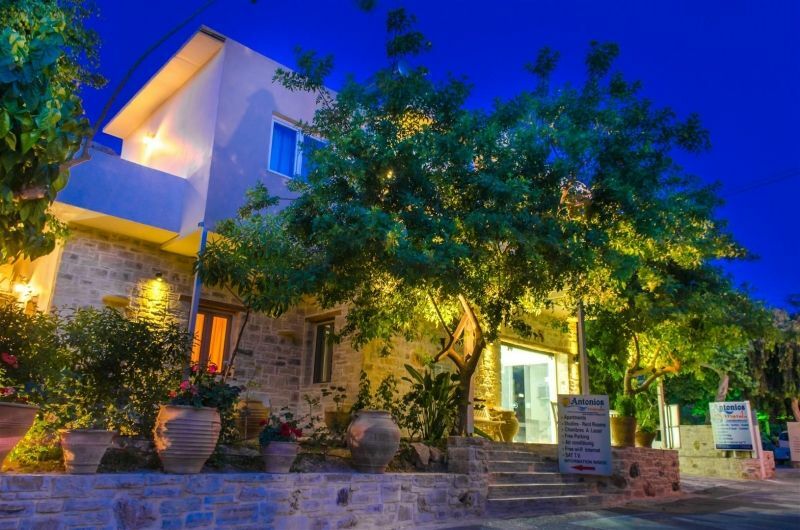 In the outskirts of the idyllic and typical Cretan village of Pitsidia, not even a mile from Komo Beach, which is one of the most beautiful and largest sandy beaches of Crete, Villa Bodikos is situated. 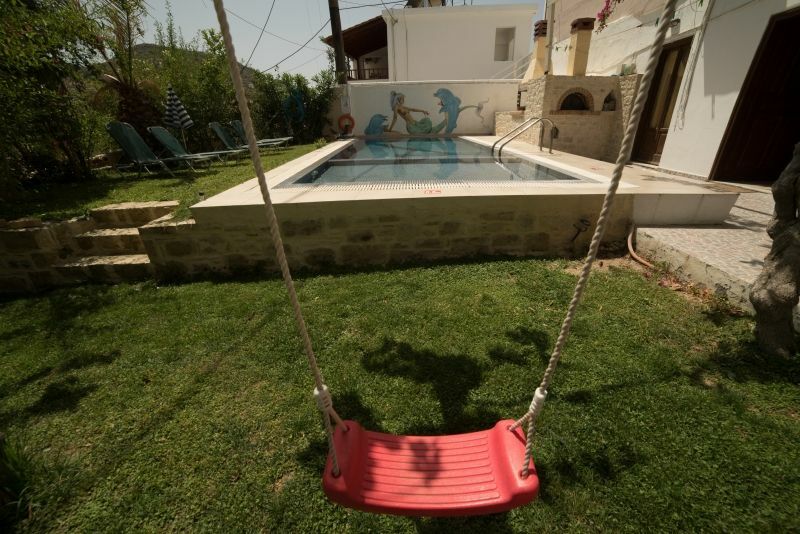 Its spacious ground floor holiday home of 130 sqm size accommodates up to six adults plus two children (camp bed/cot). 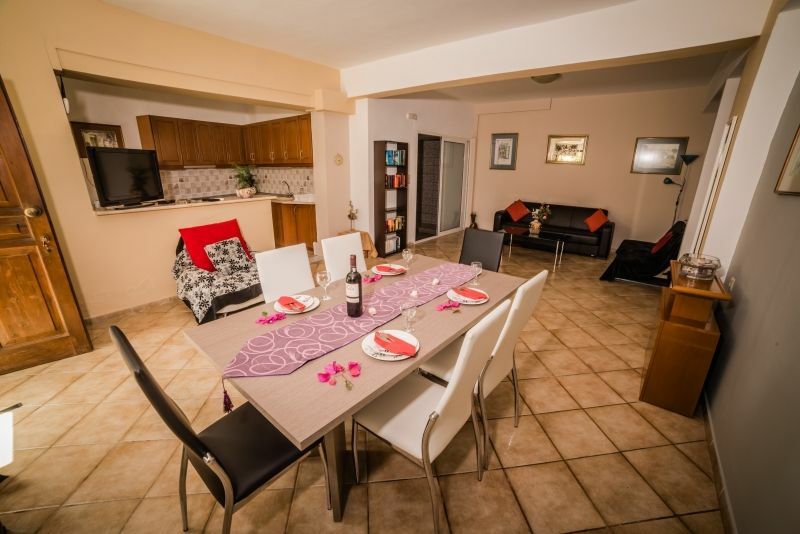 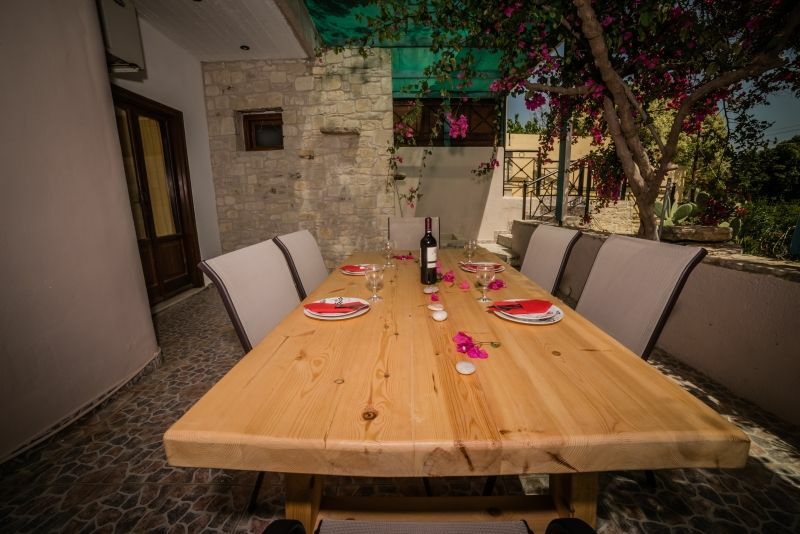 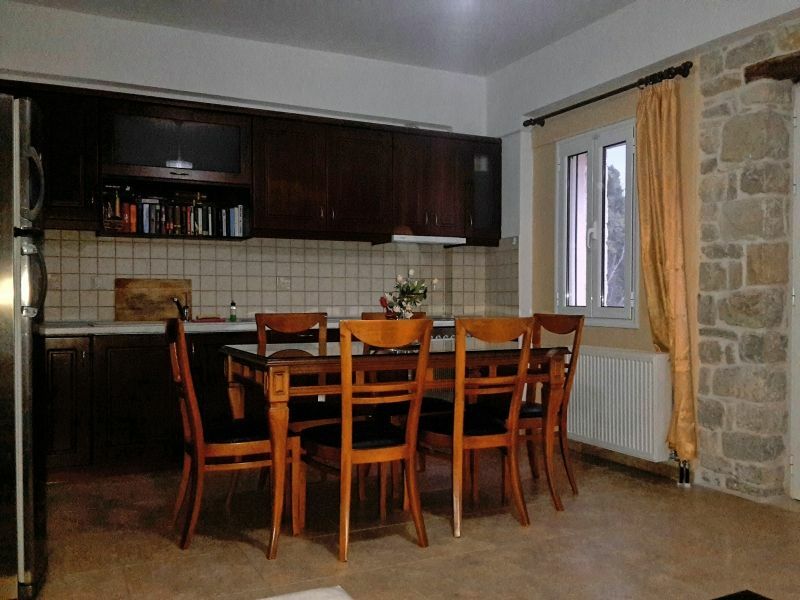 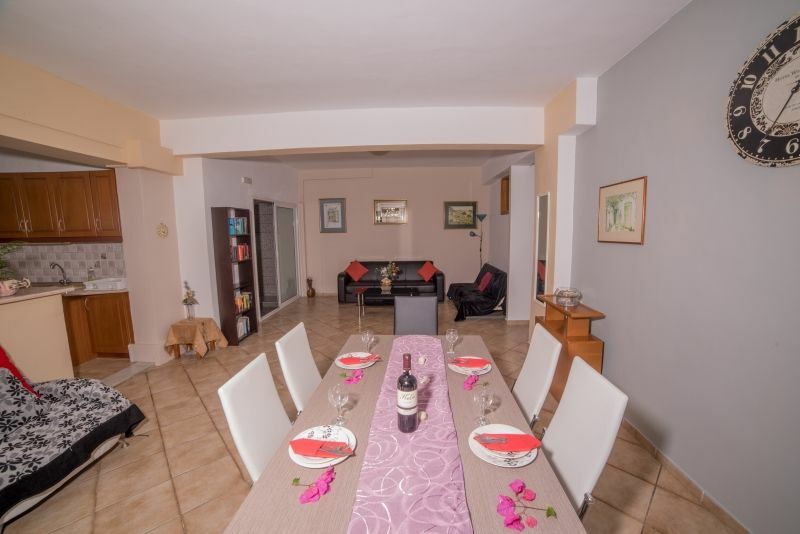 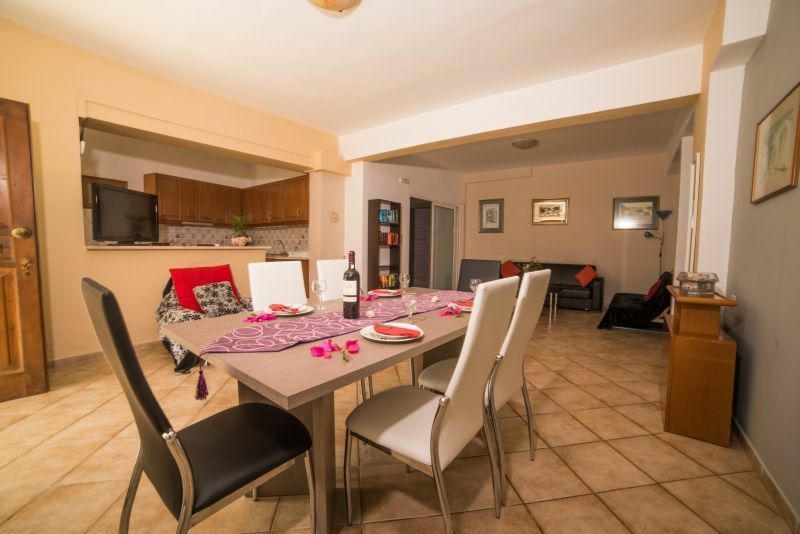 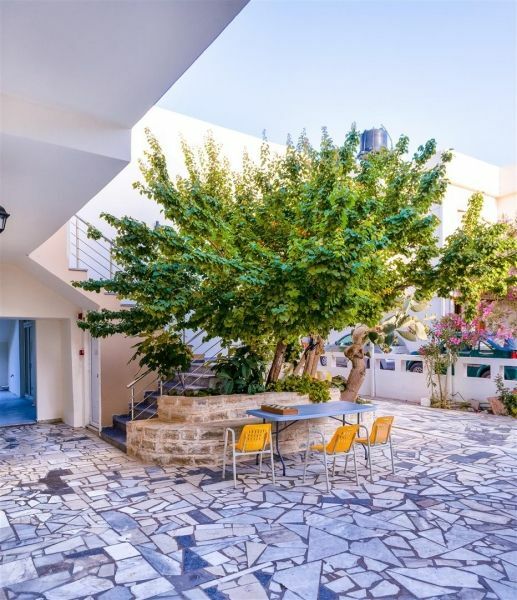 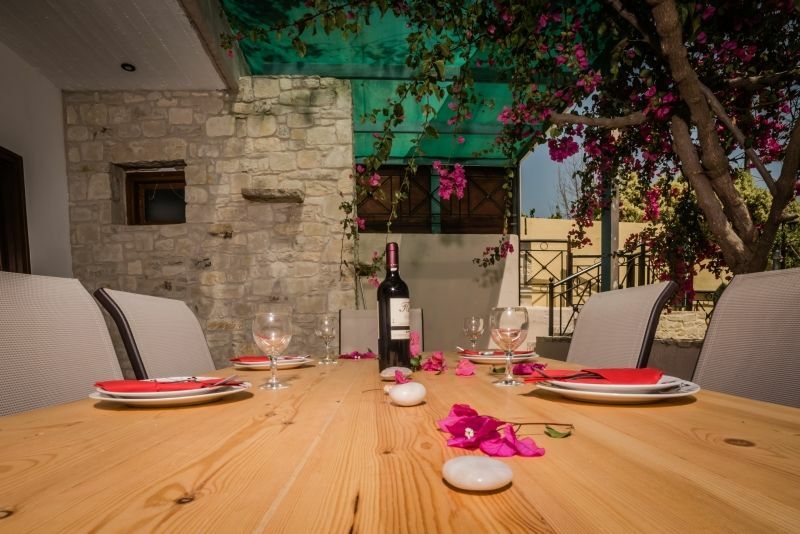 Inside the tasteful and in typical Cretan style decorated living room there's a large dining table with six chairs, above all two sofas and another two extra armchairs. 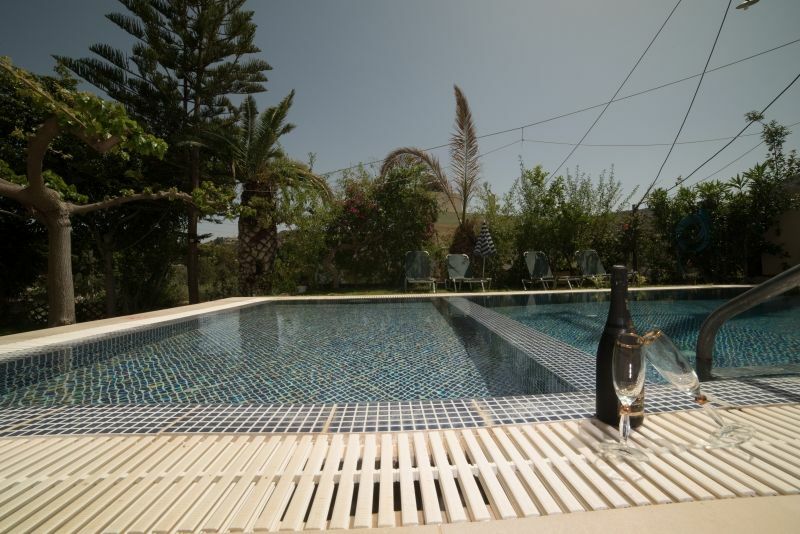 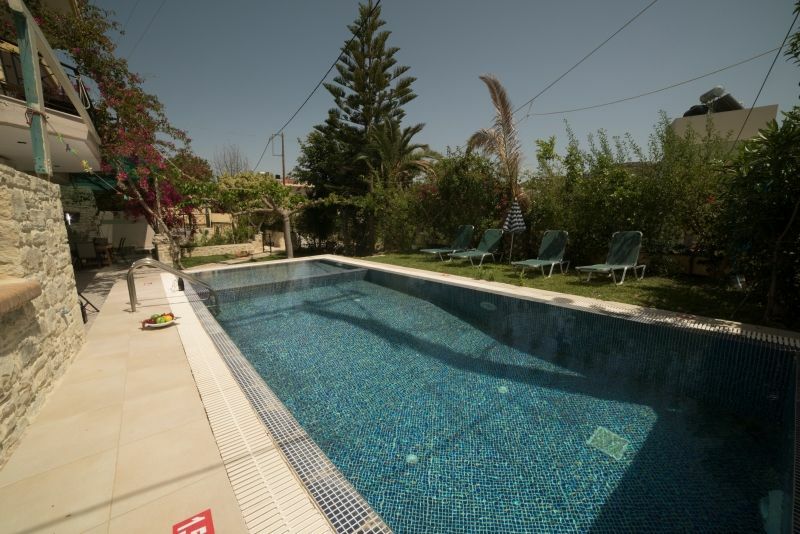 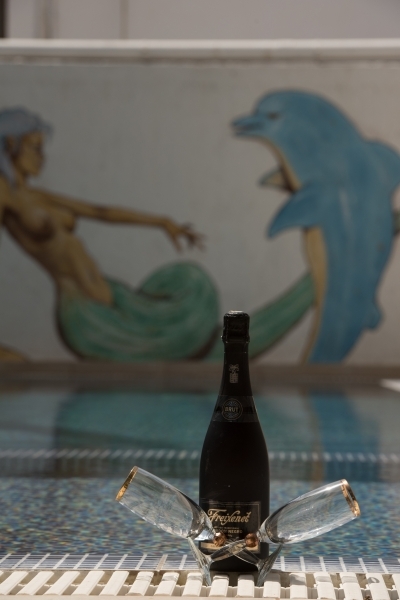 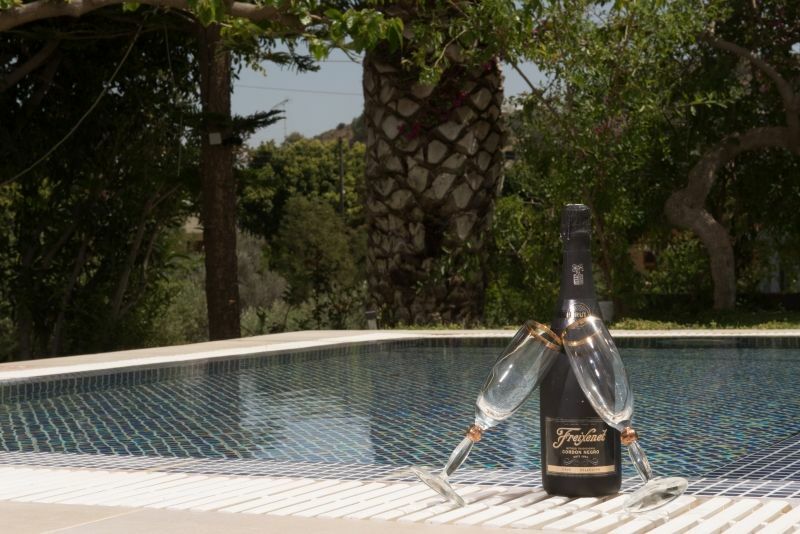 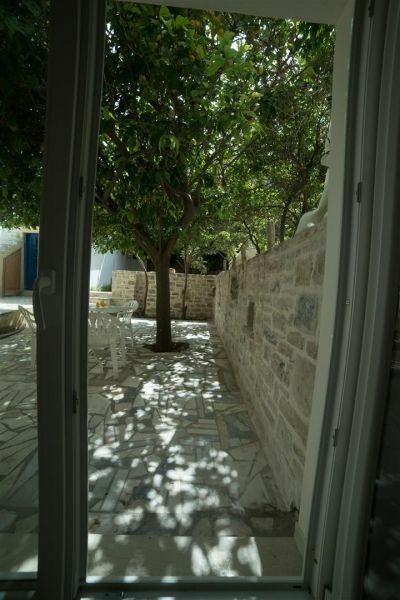 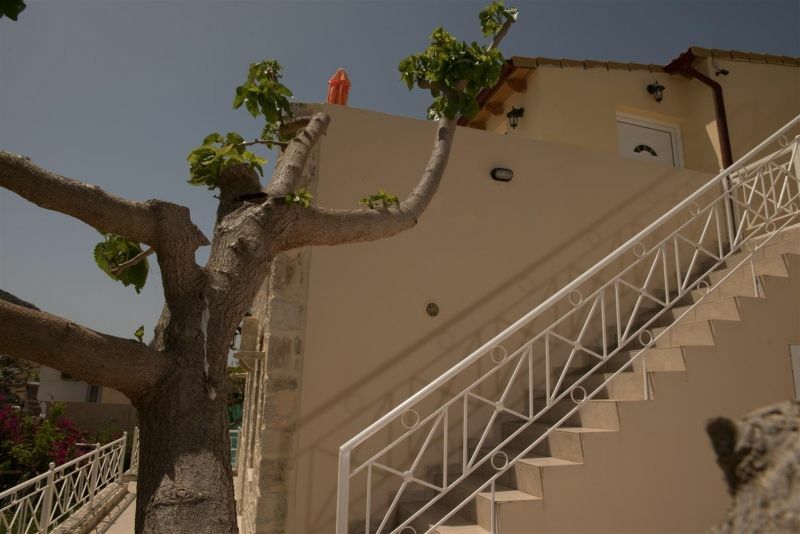 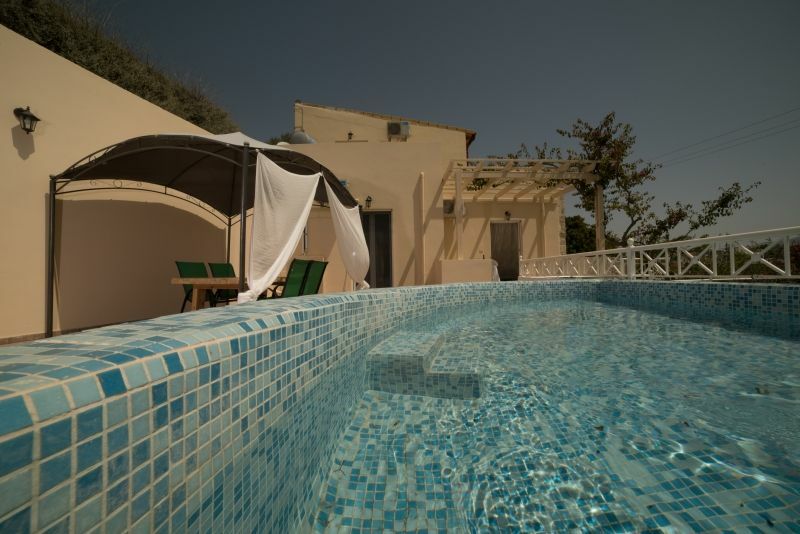 Off course Villa Bodikos is equipped with air condition and SAT-TV, furthermore a washing machine is provided. 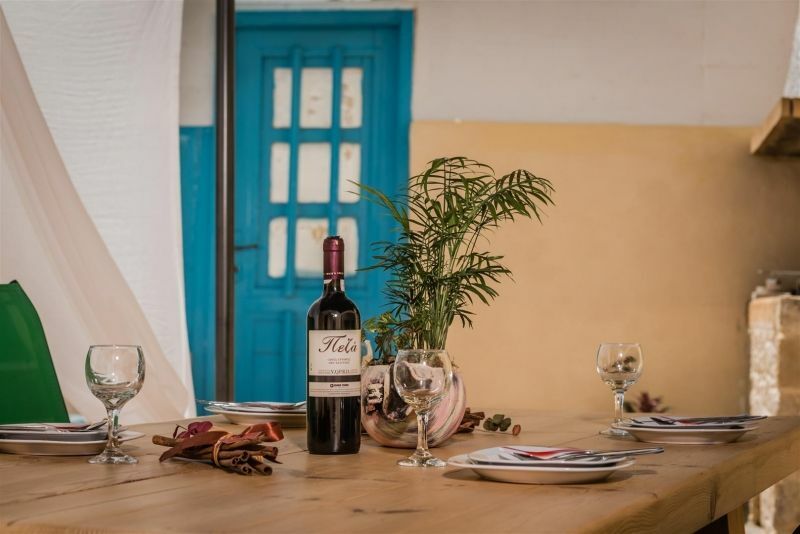 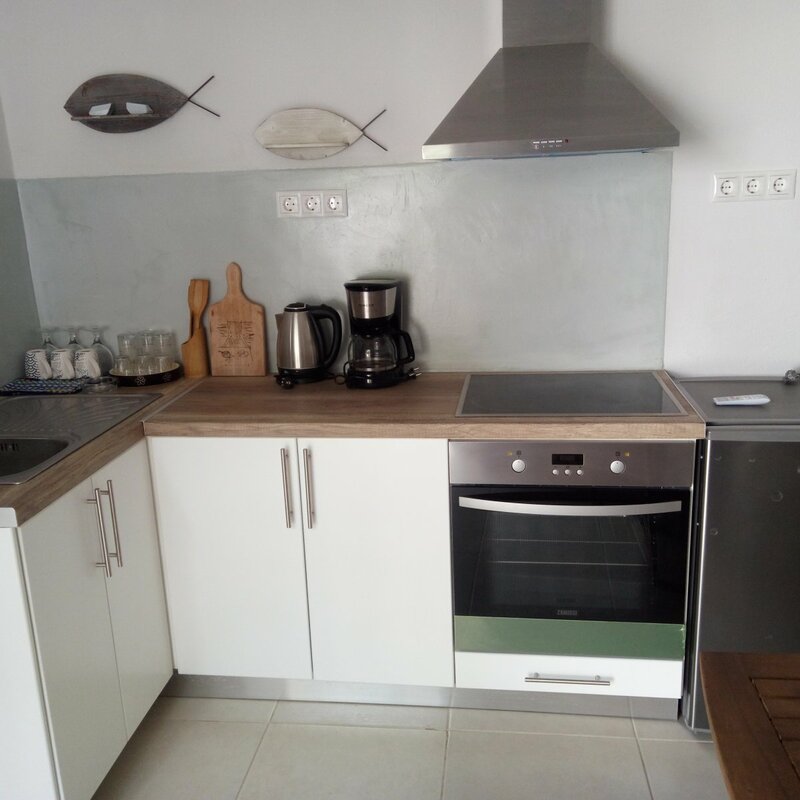 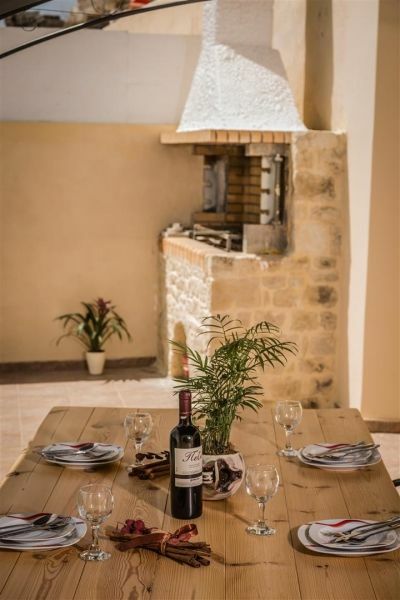 The kitchen is separated by a stonewalled bar and fully equipped with electric range and oven, fridge/freezer, coffee maker, electric kettle, juice squeezer and toaster. 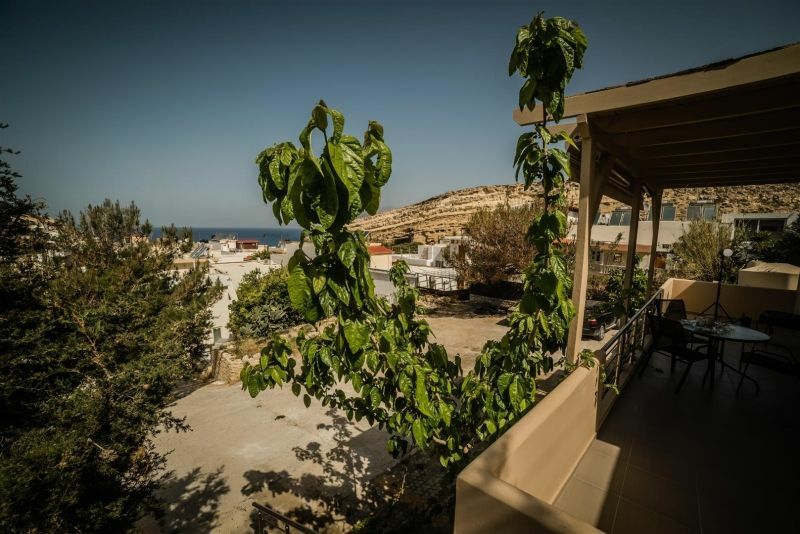 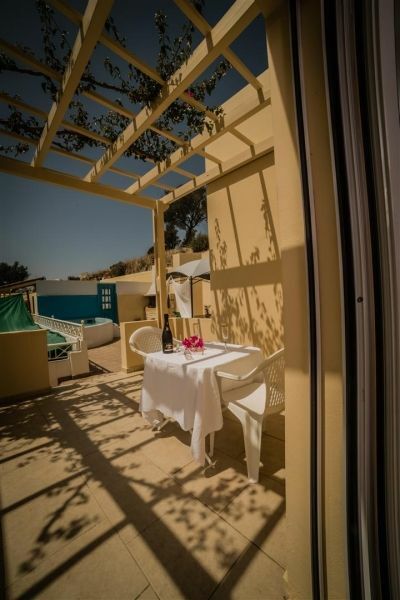 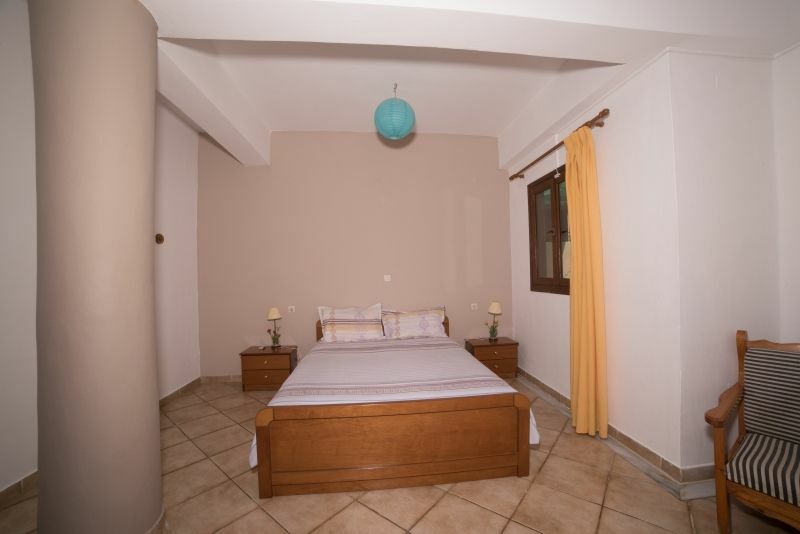 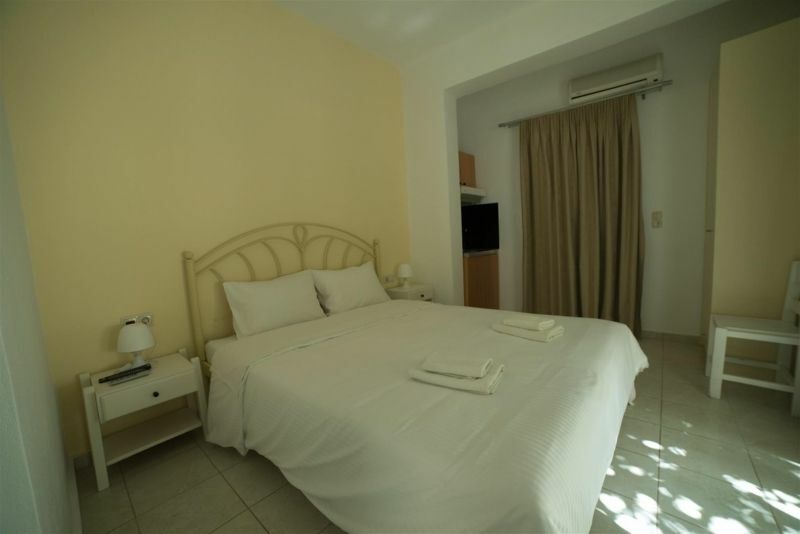 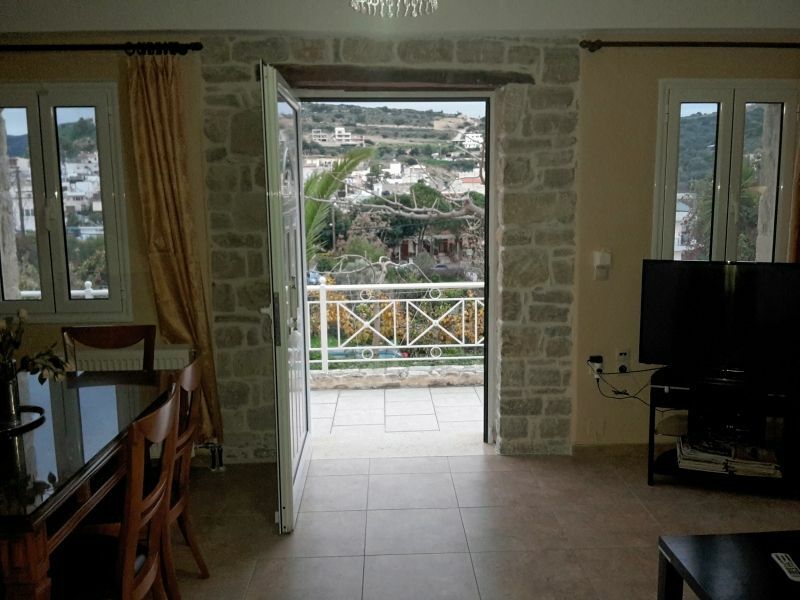 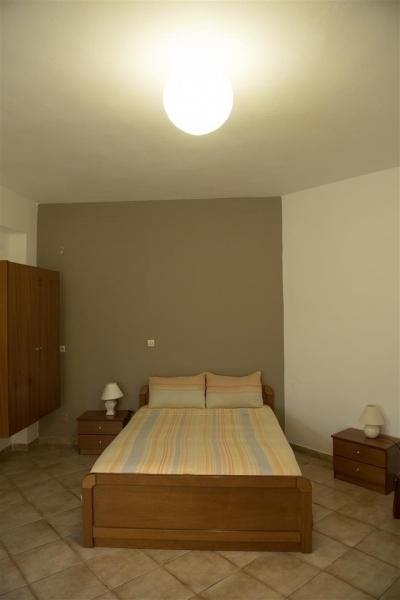 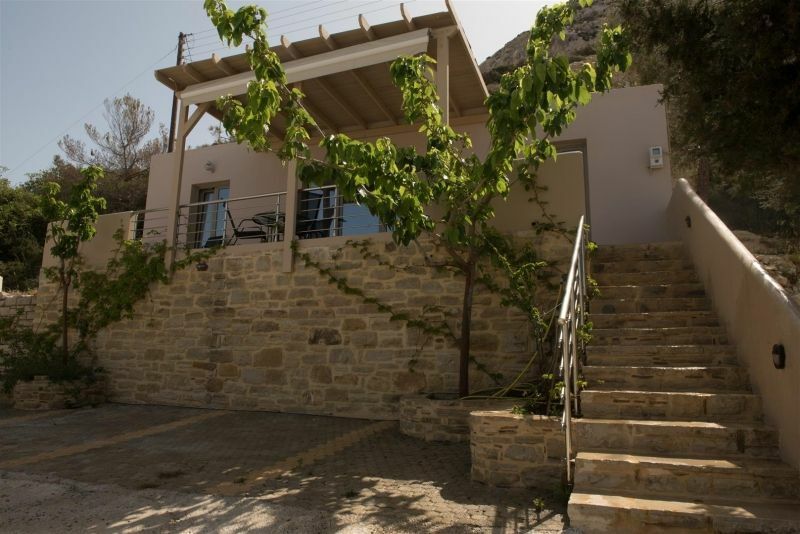 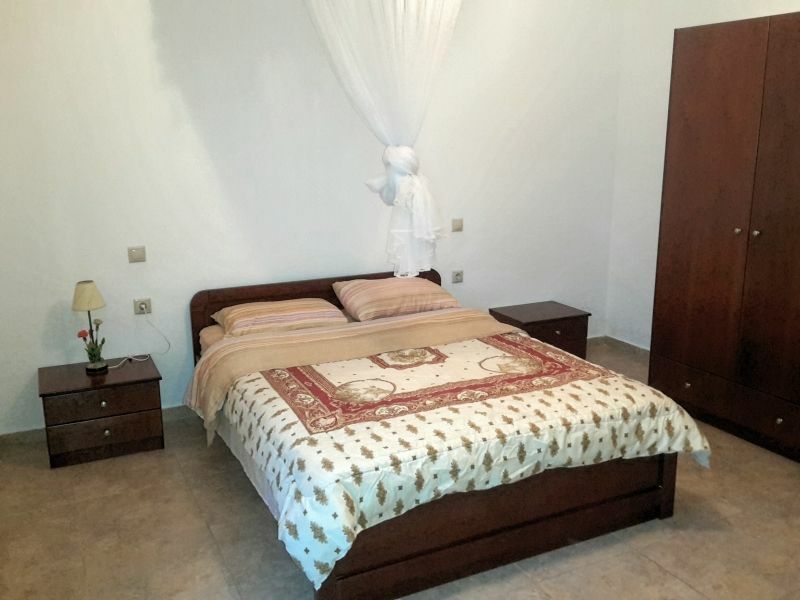 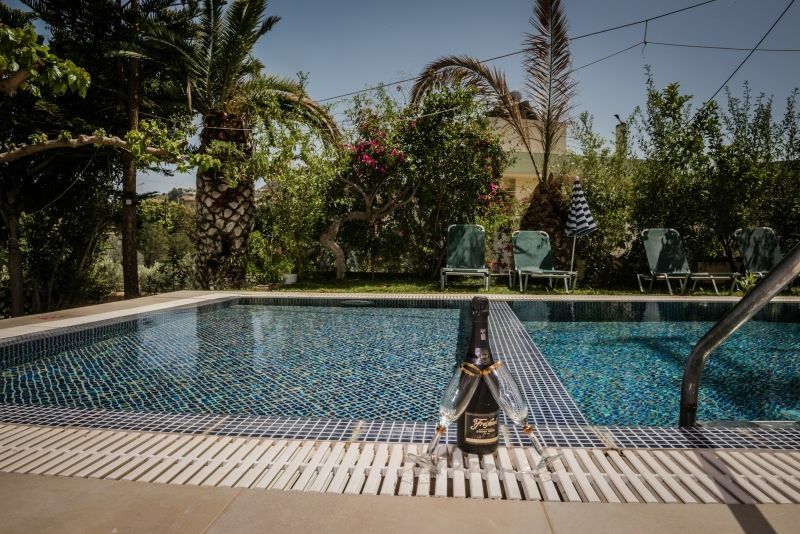 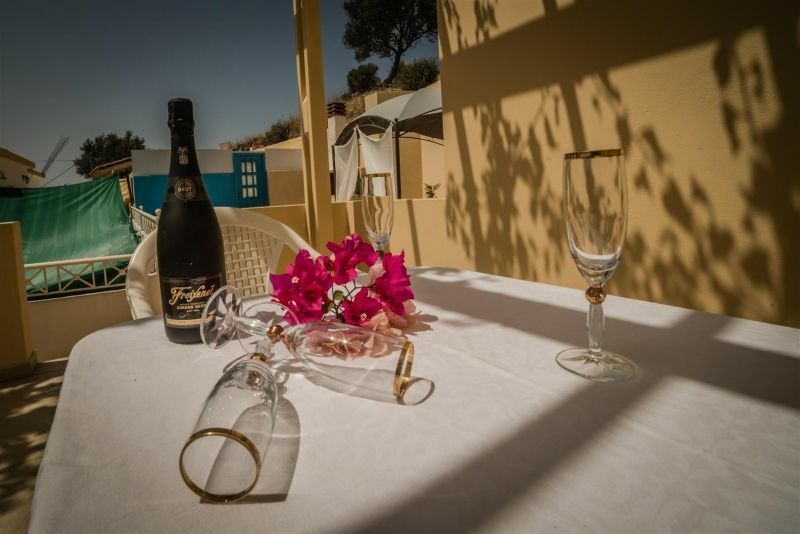 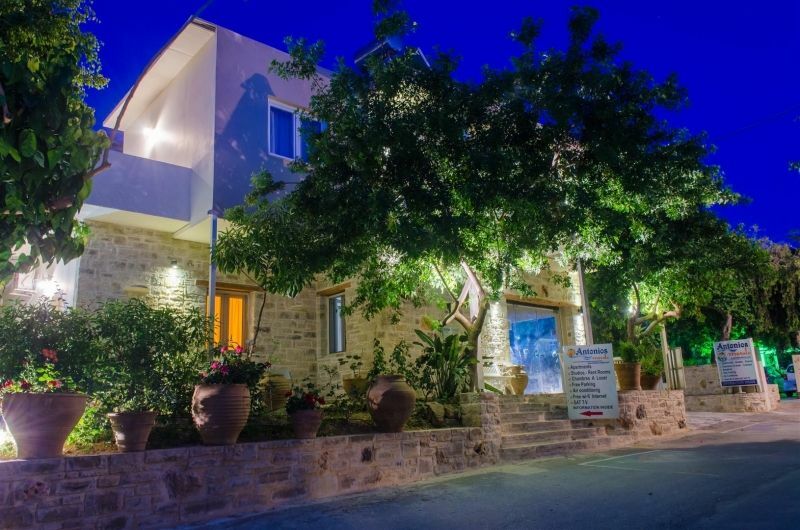 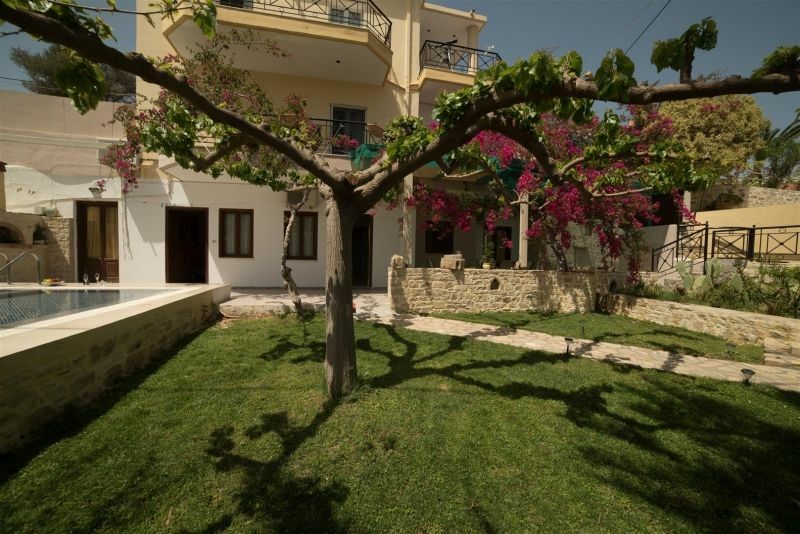 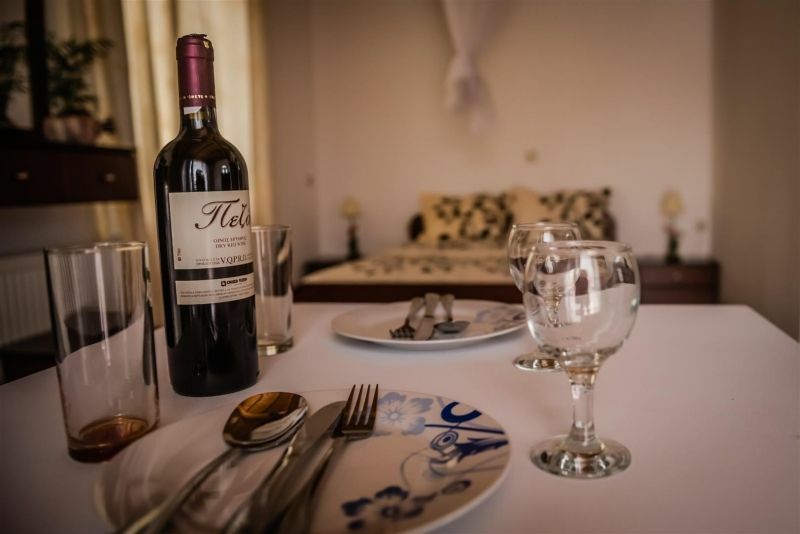 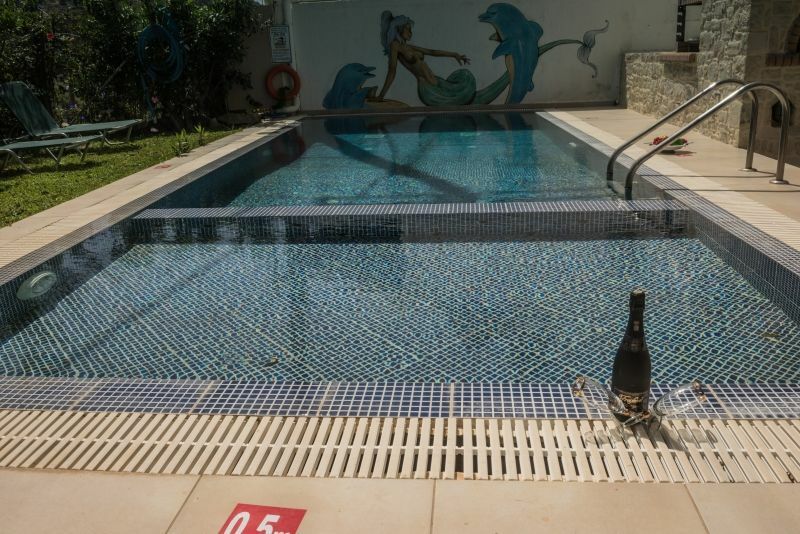 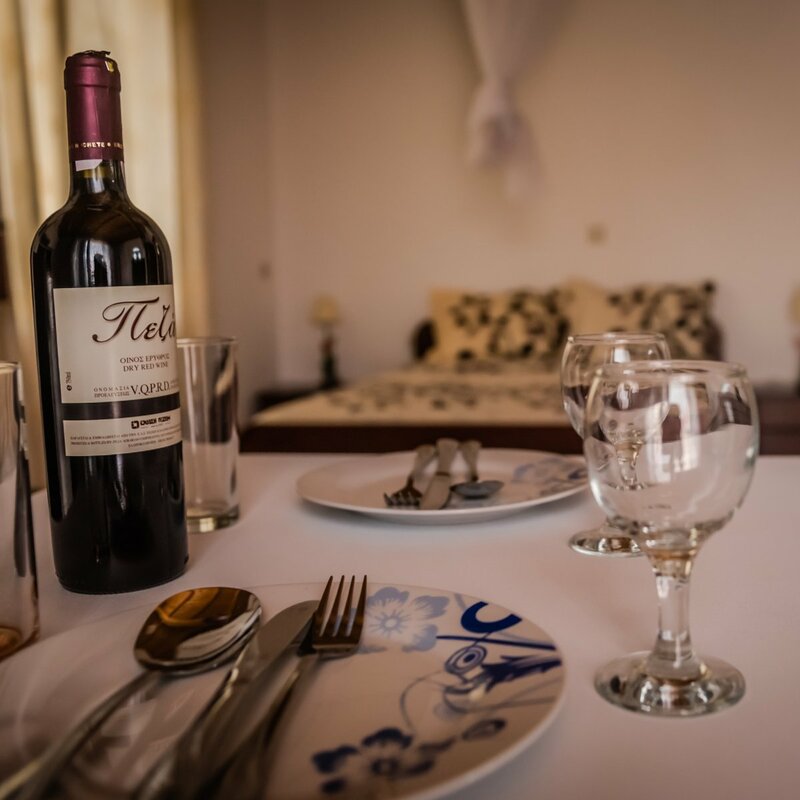 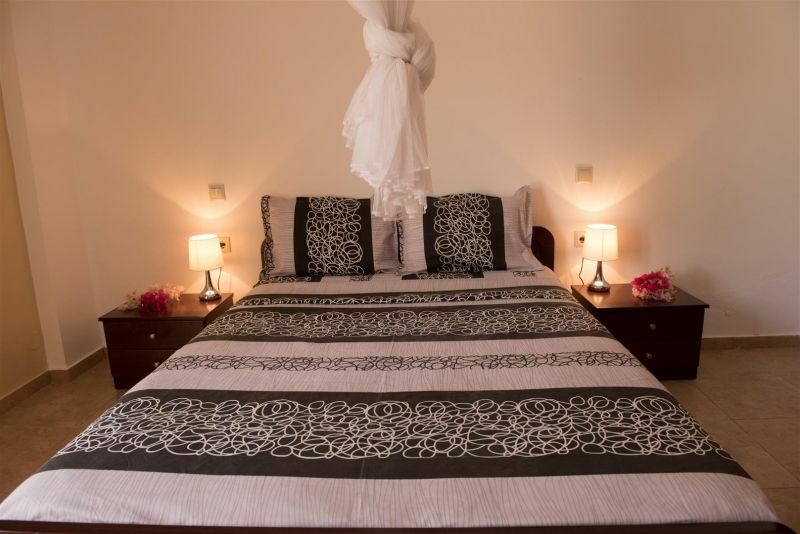 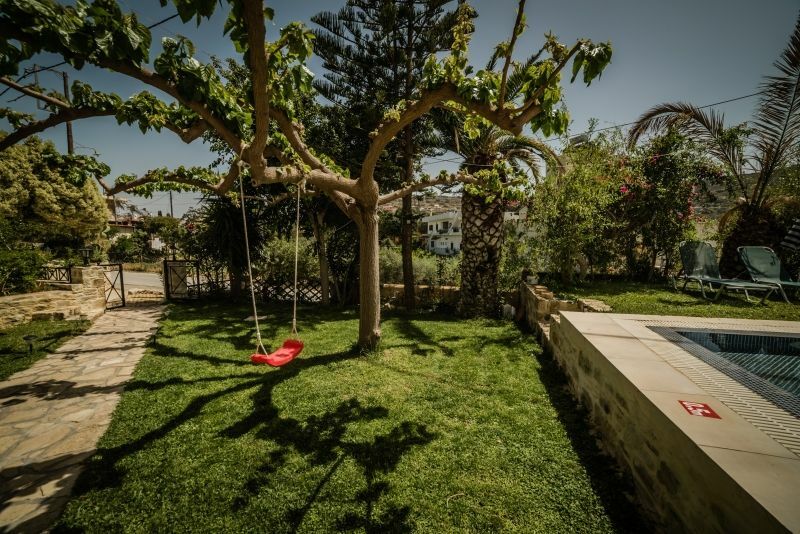 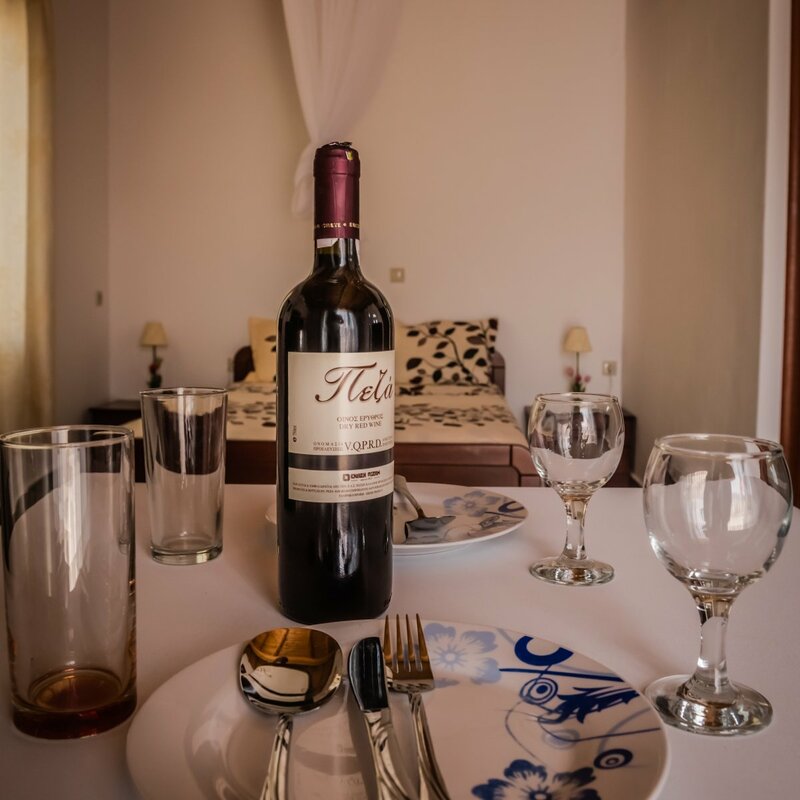 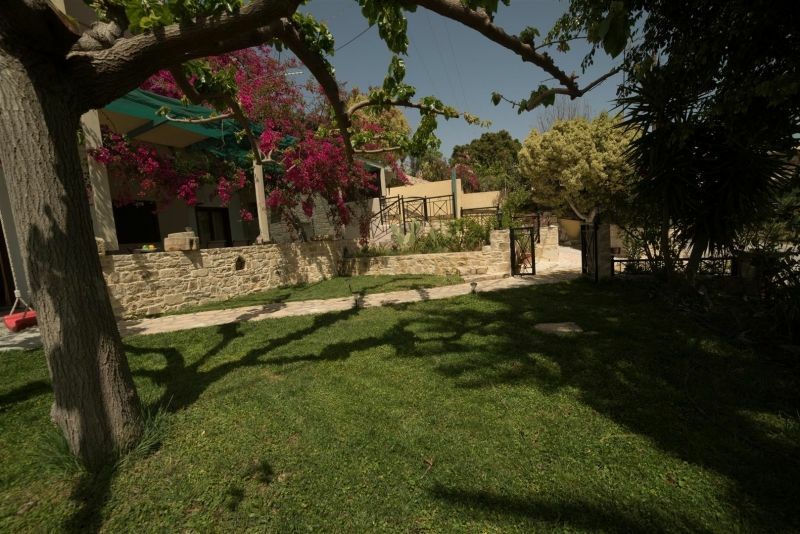 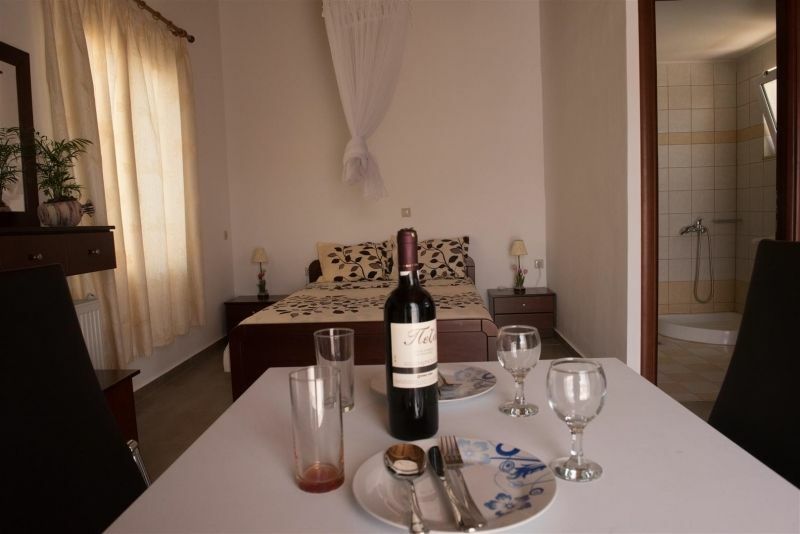 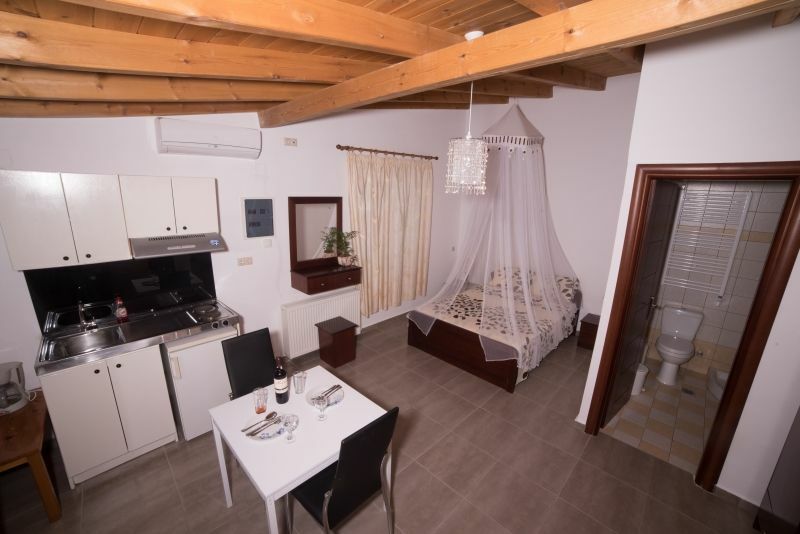 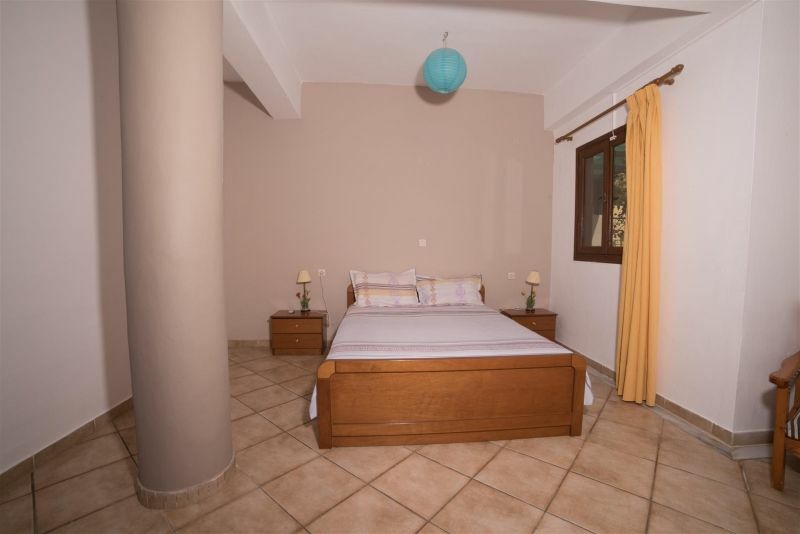 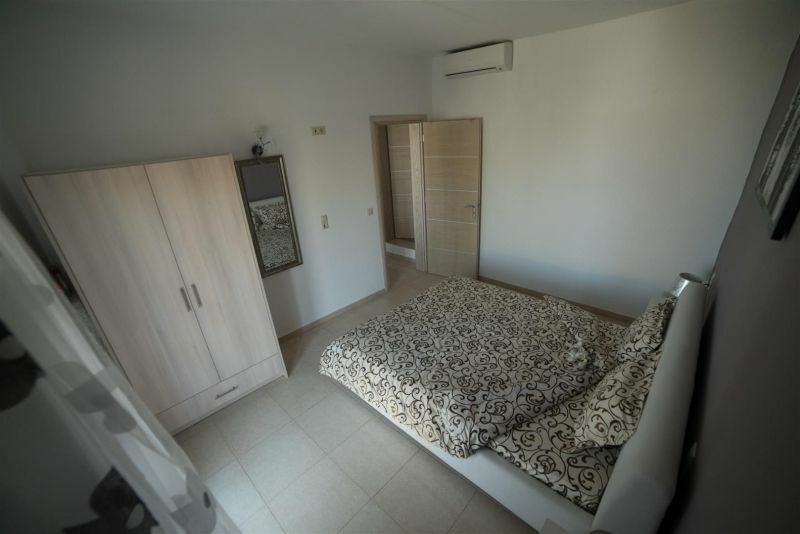 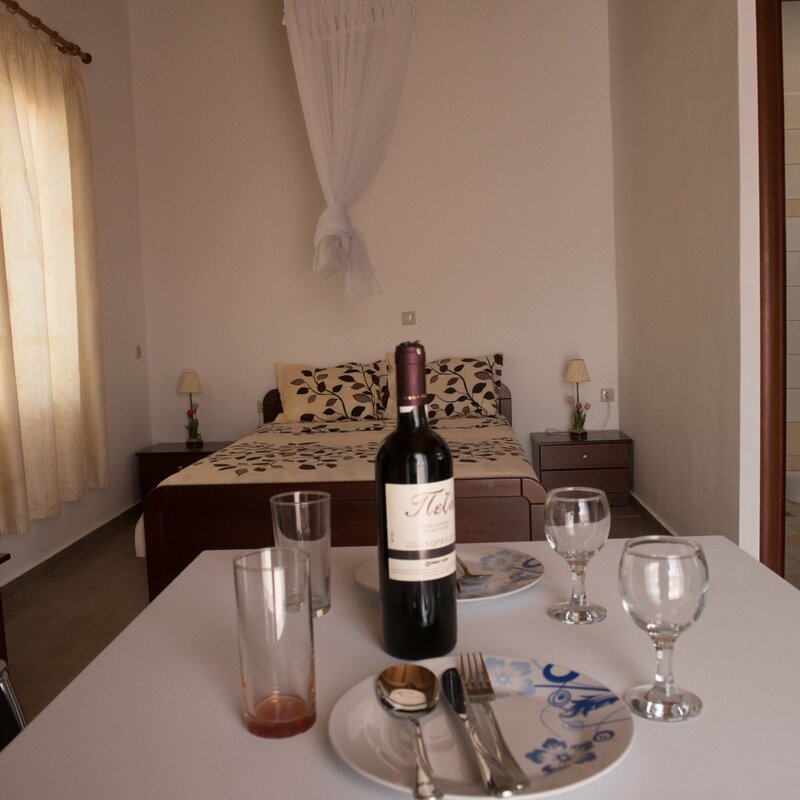 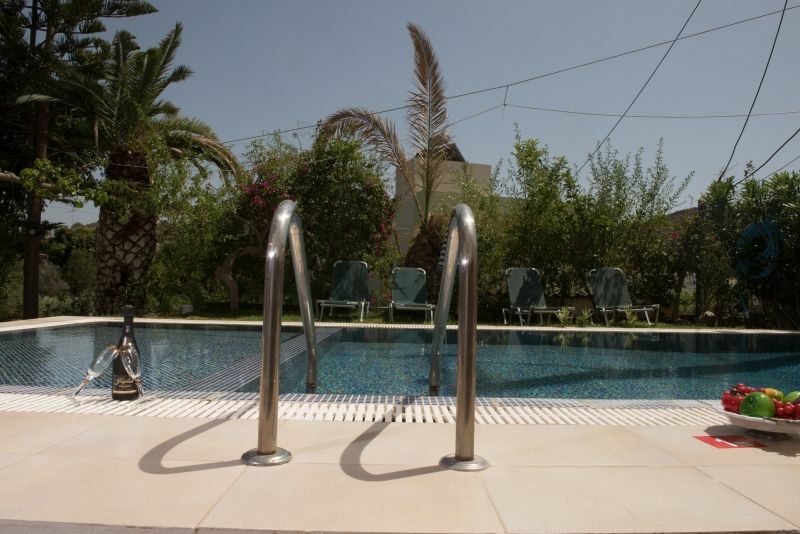 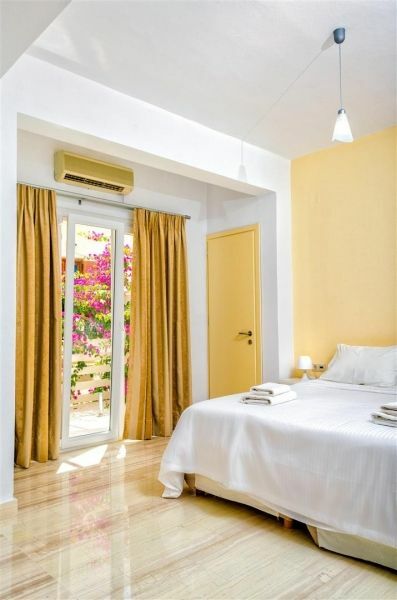 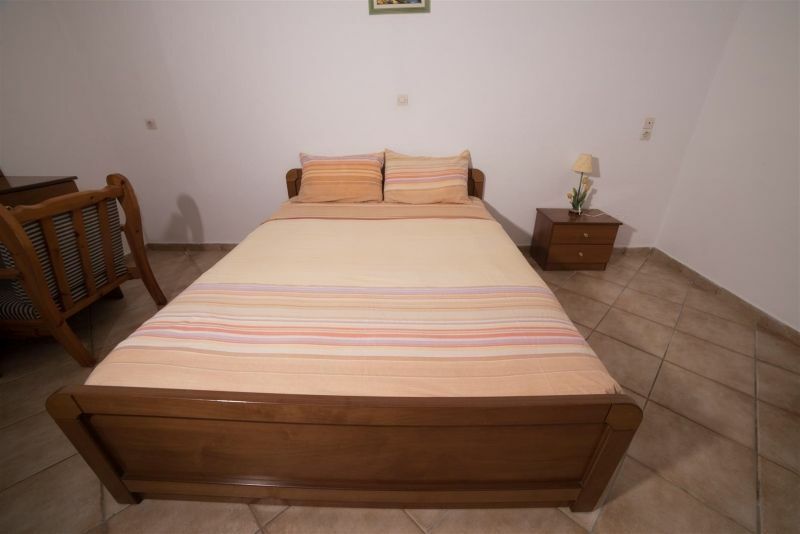 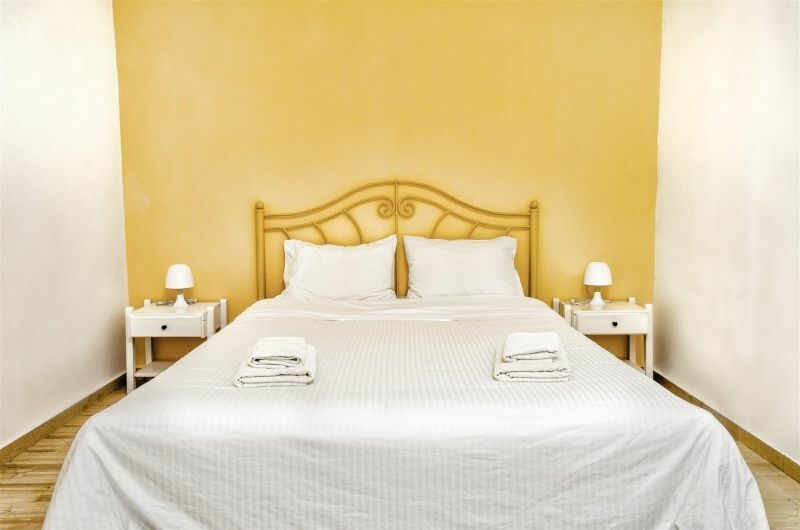 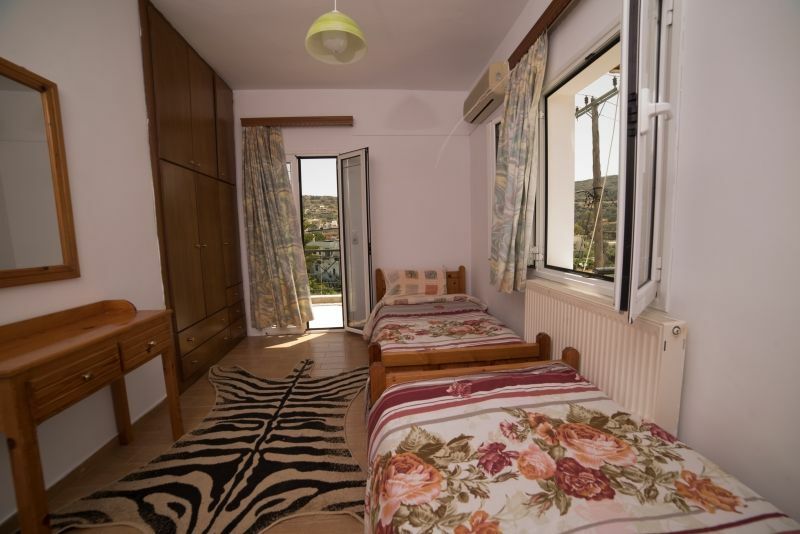 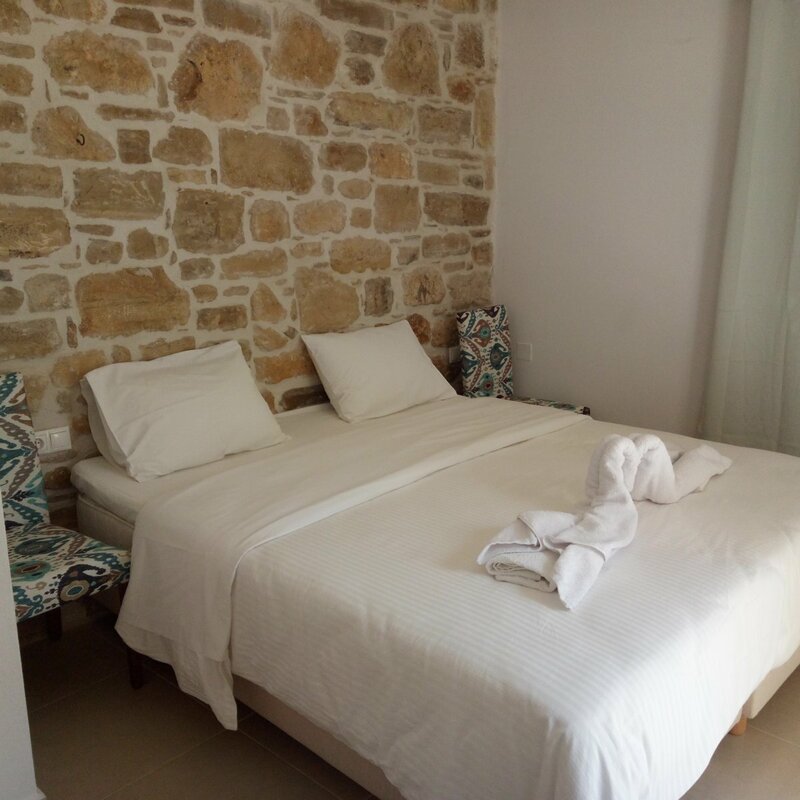 Villa Bodikos also has two bathrooms (with shower/toilet and bath tub/toilet) as well as three bedrooms, equipped with "double bed/cot", "double bed/baby cot" and "double bed/camp bed". 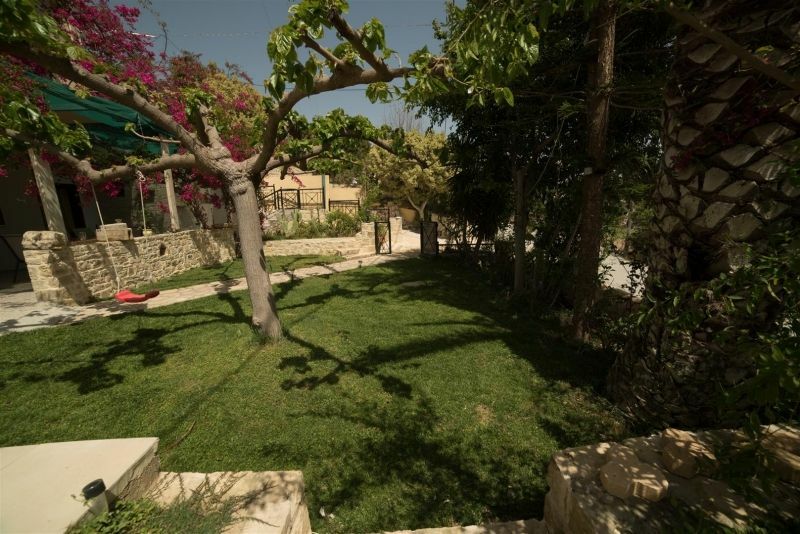 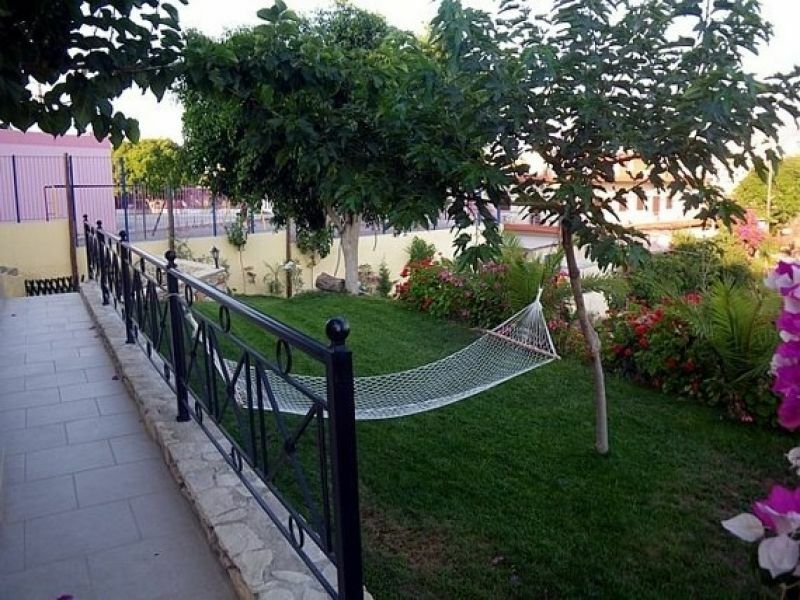 Outside there's a large and beautiful garden with many flowers and a lemon tree, furthermore a terrace with garden furniture, barbecue, swing, hammock and shower. 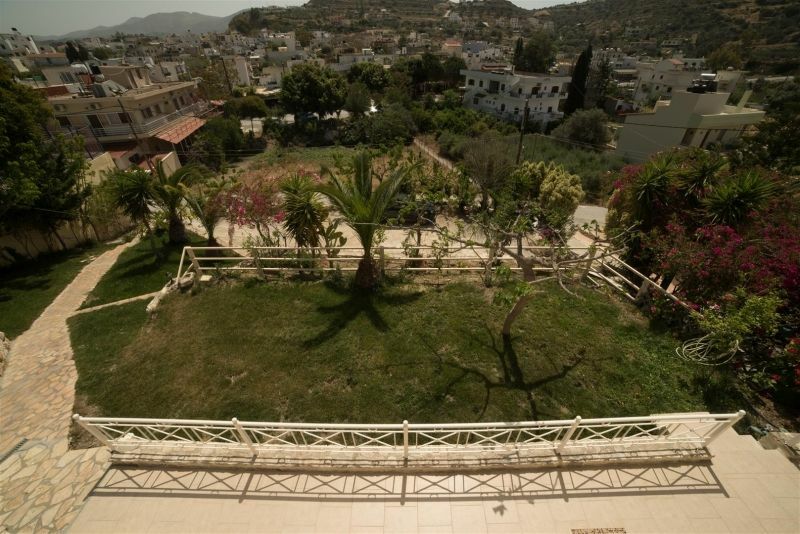 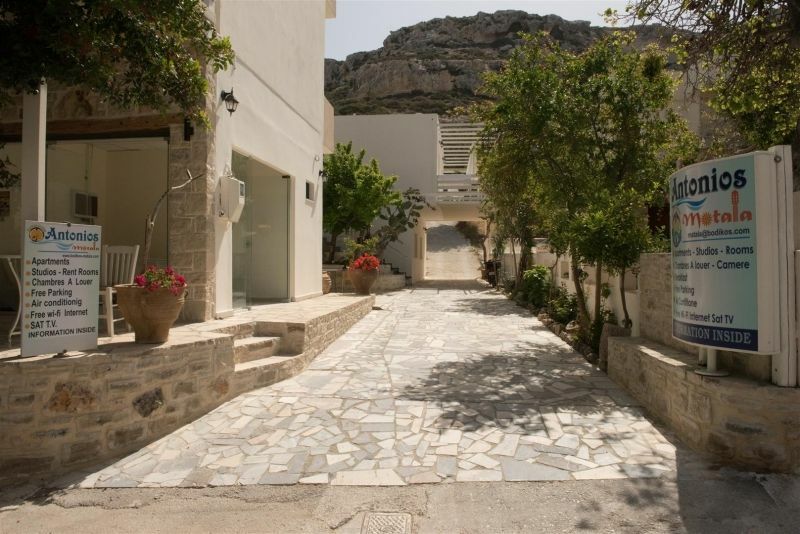 At Villa Bodikos you will also find parking space for two cars. 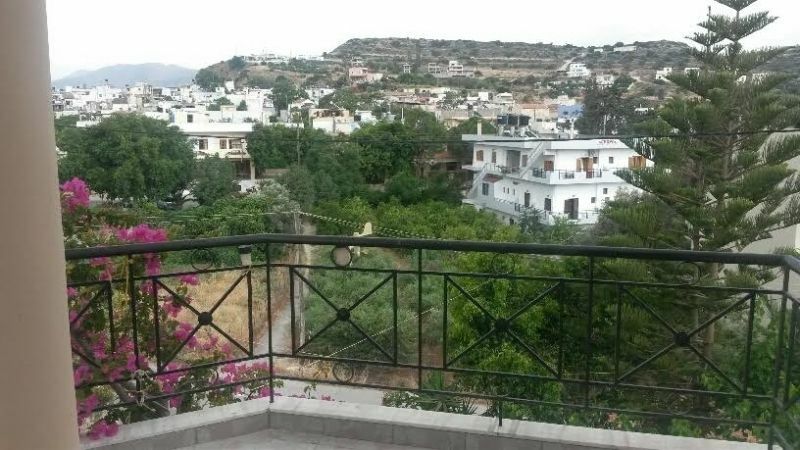 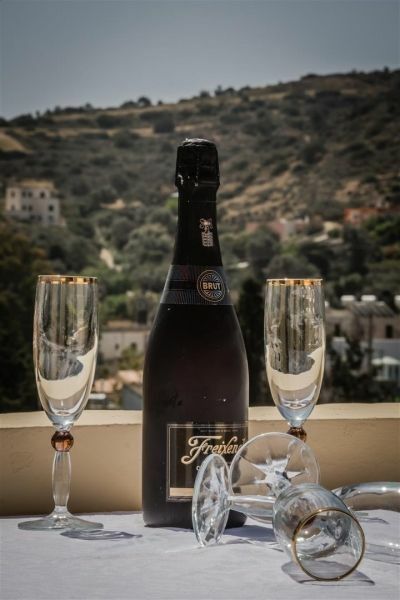 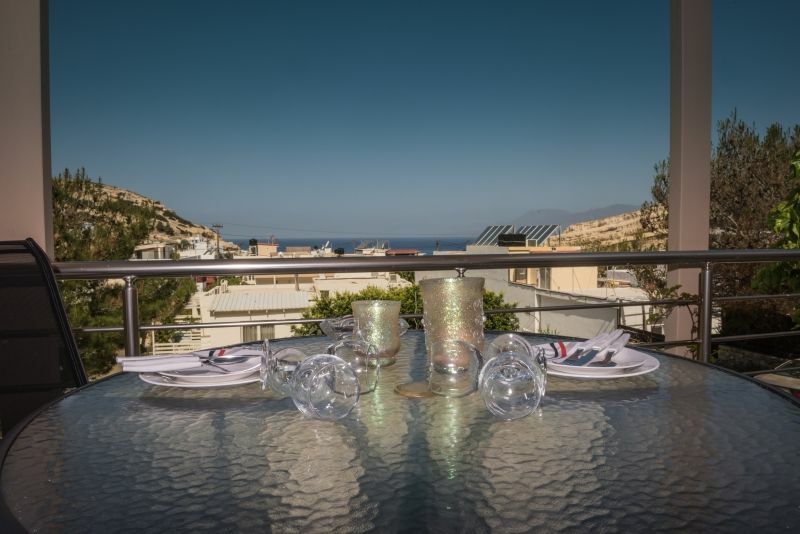 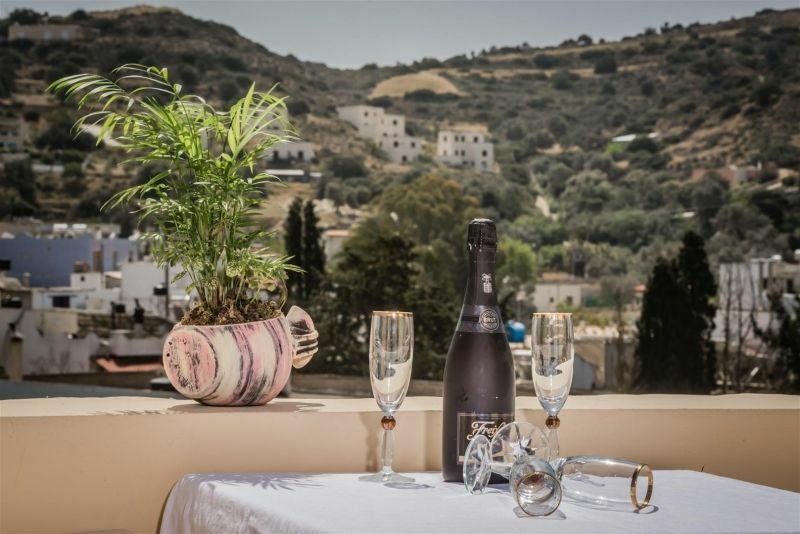 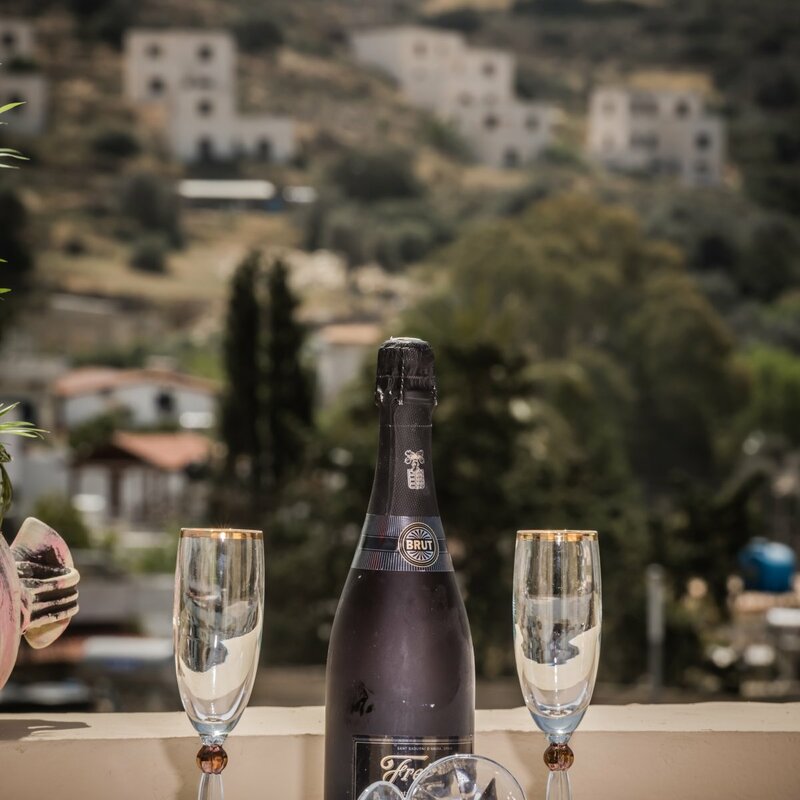 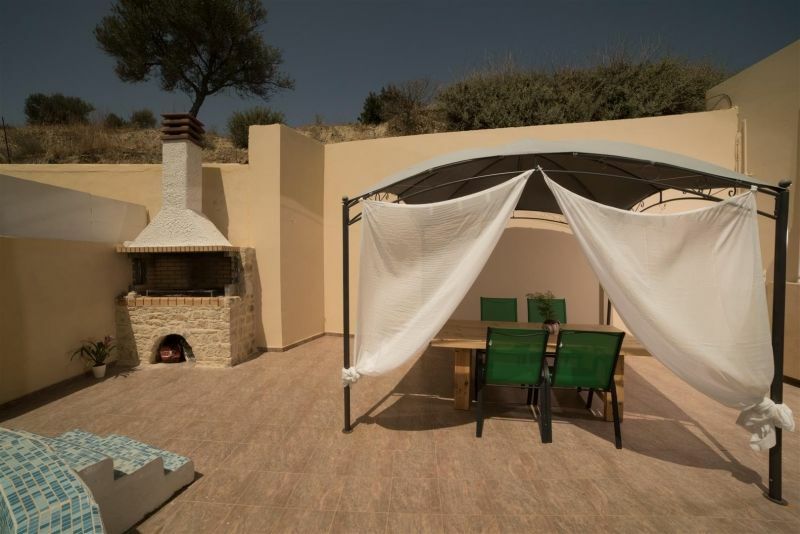 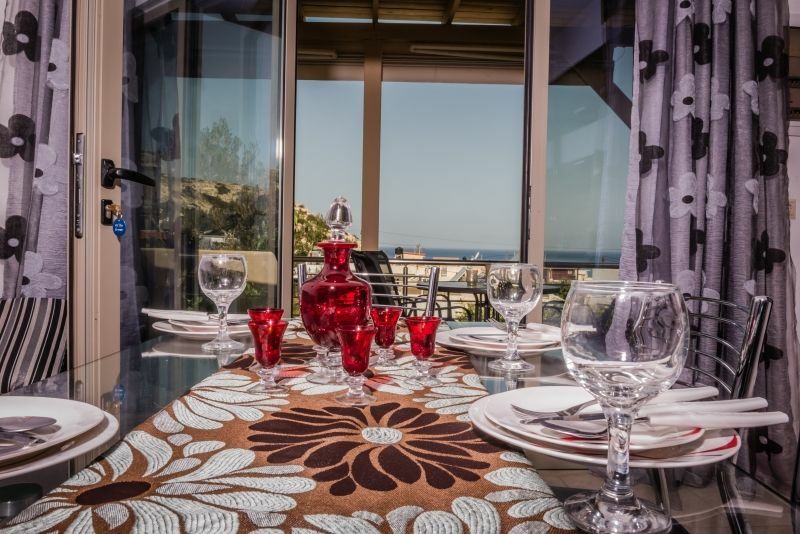 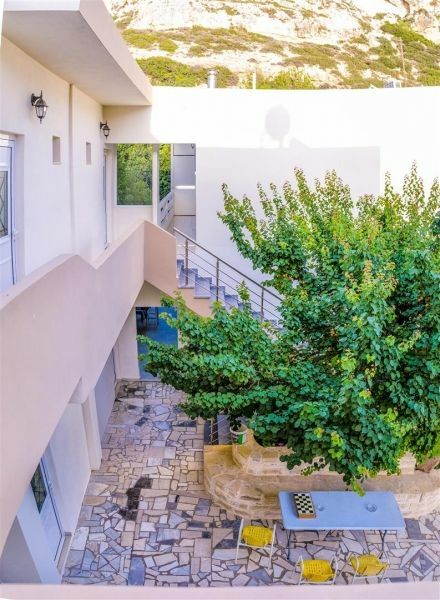 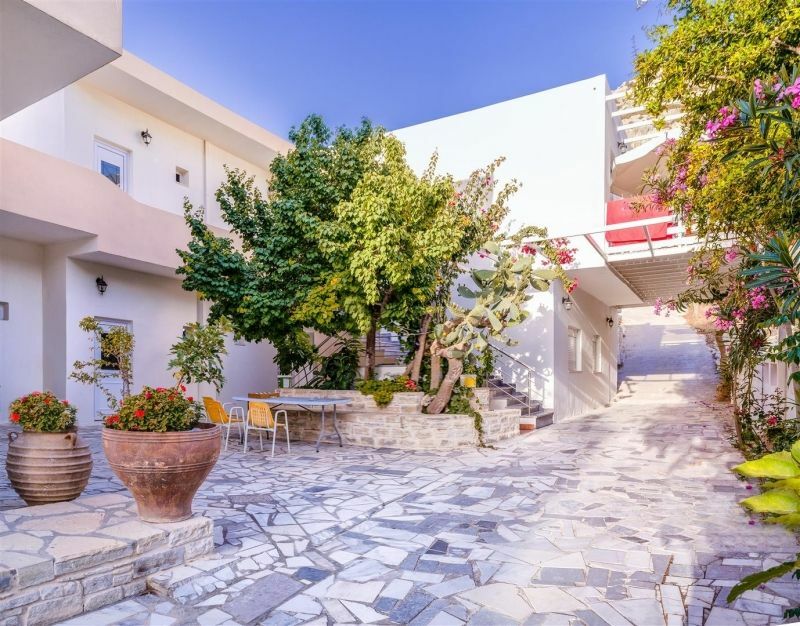 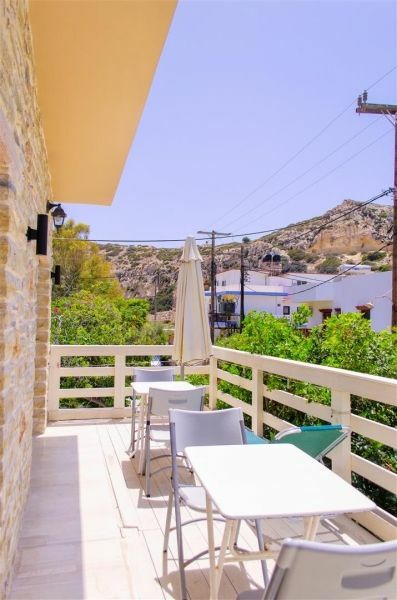 In the heart of Matala, only 50 m away from the beach with its famous caves, Apartments Antonios are situated in a quiet back road - directly at the starting point of the worthwhile hike over to wonderful Red Beach. 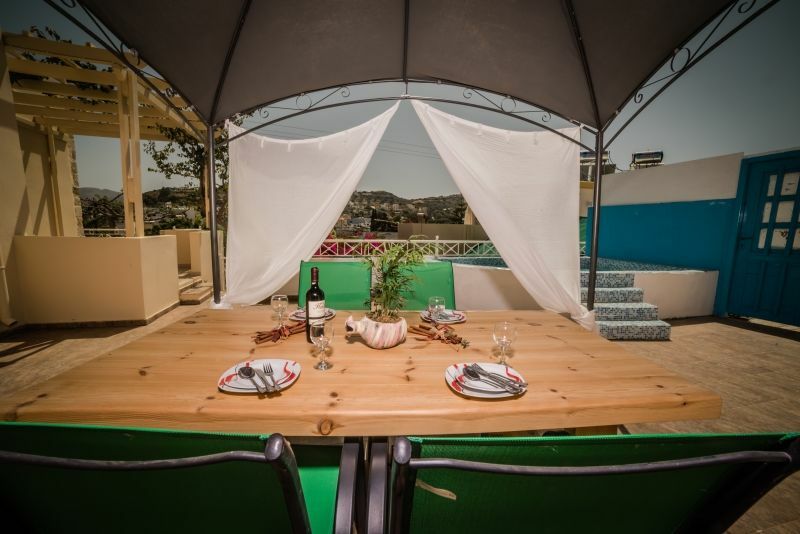 Breakfast can be booked optional by extra cost. 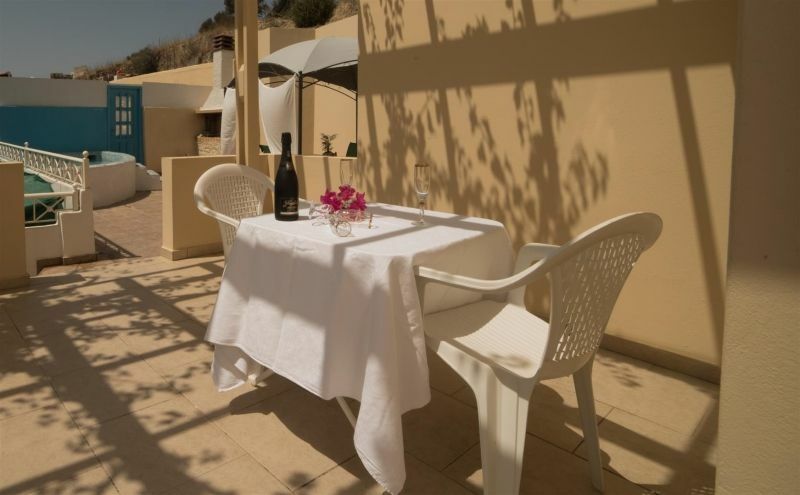 You can take it in the friendly common room or under superb bougainvillaea trees in the patio. 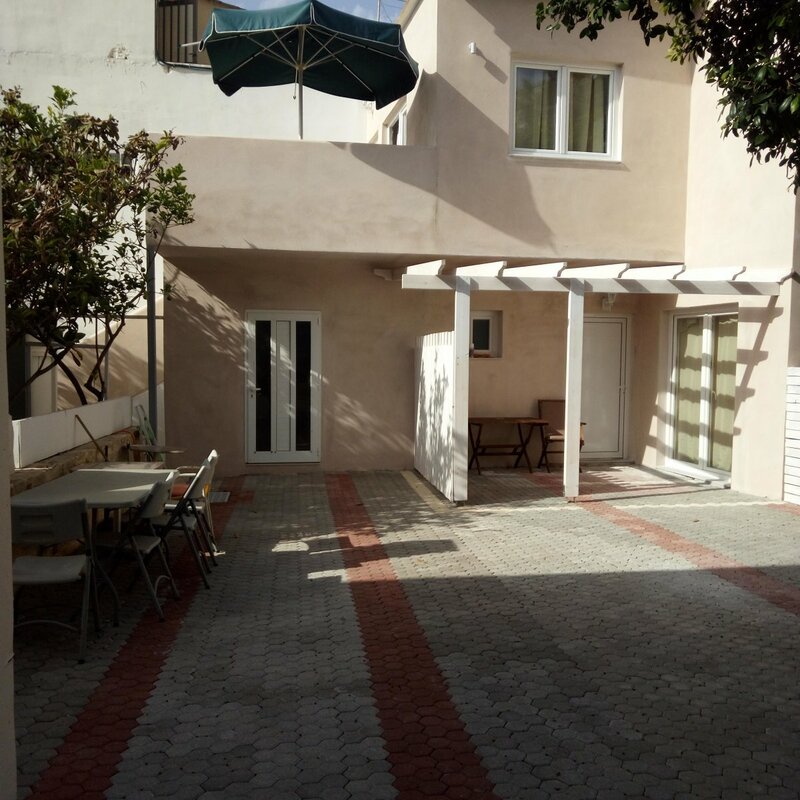 Parking place is put as guests disposal right behind the apartments. 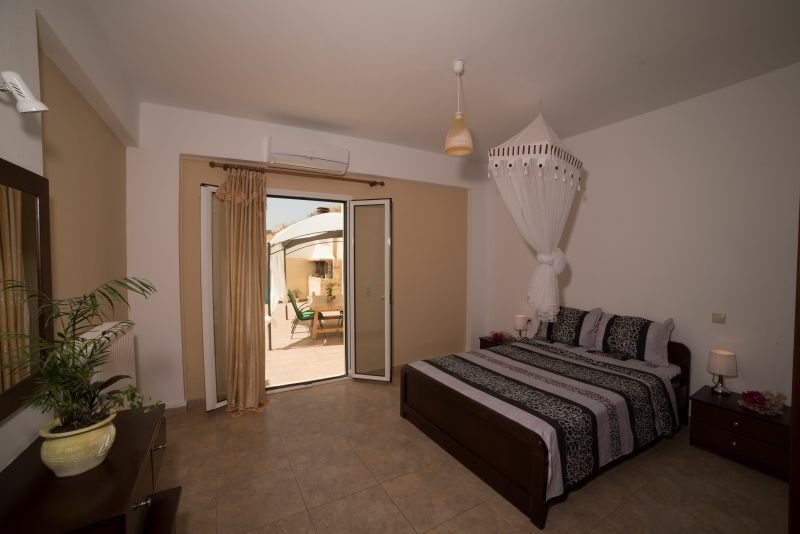 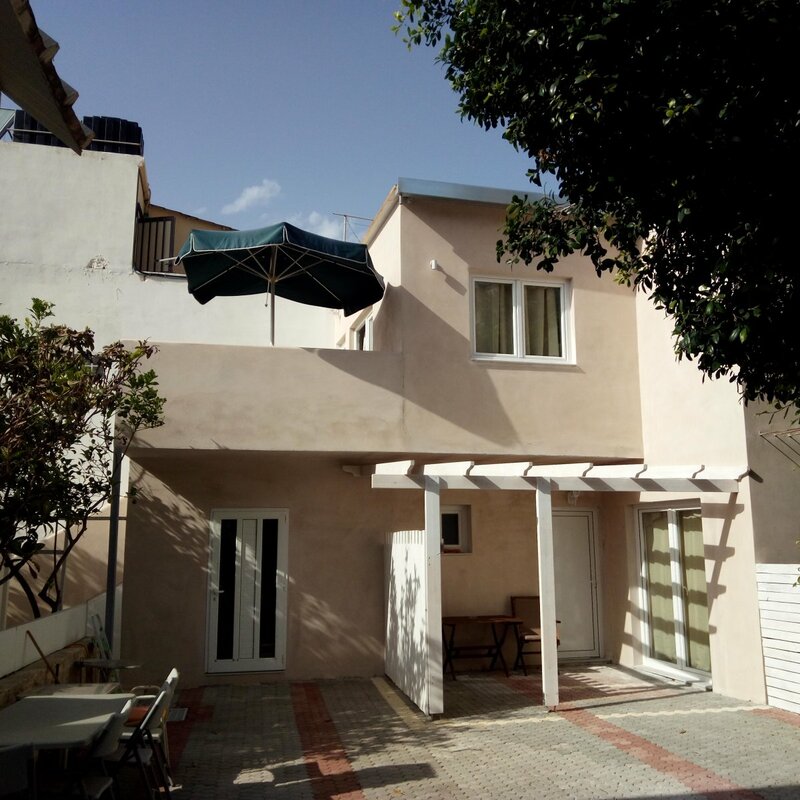 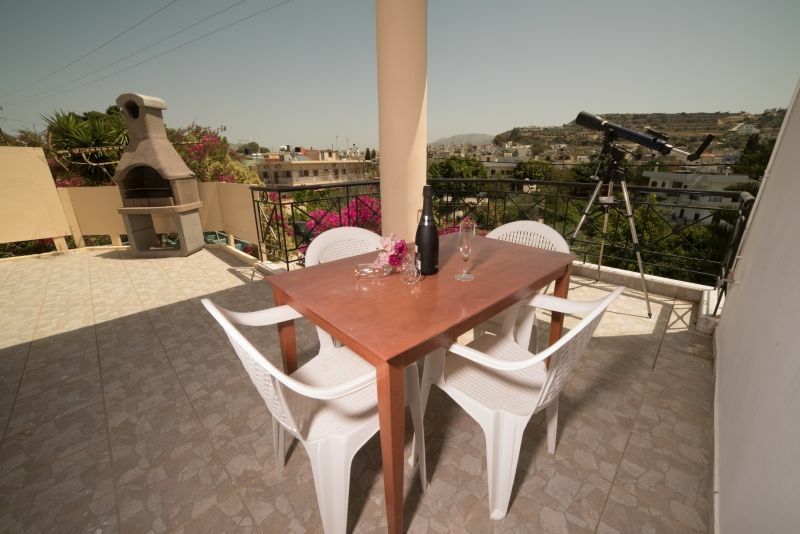 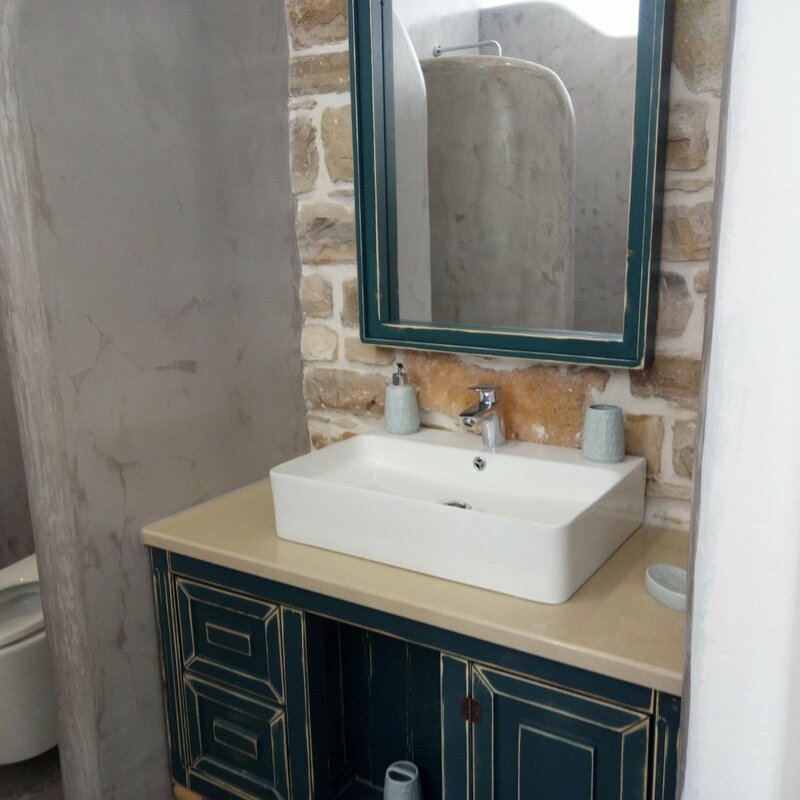 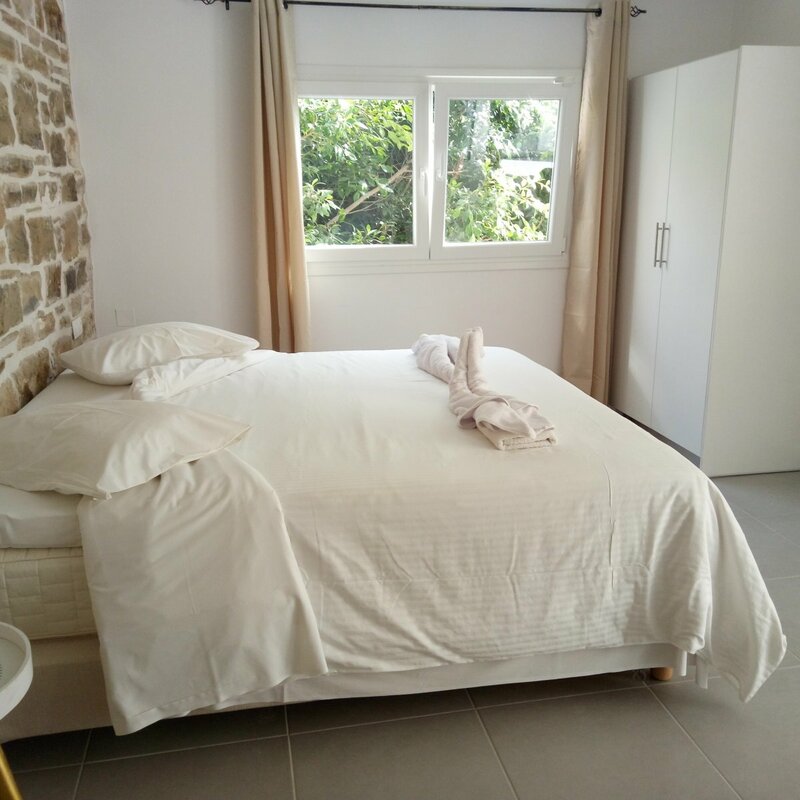 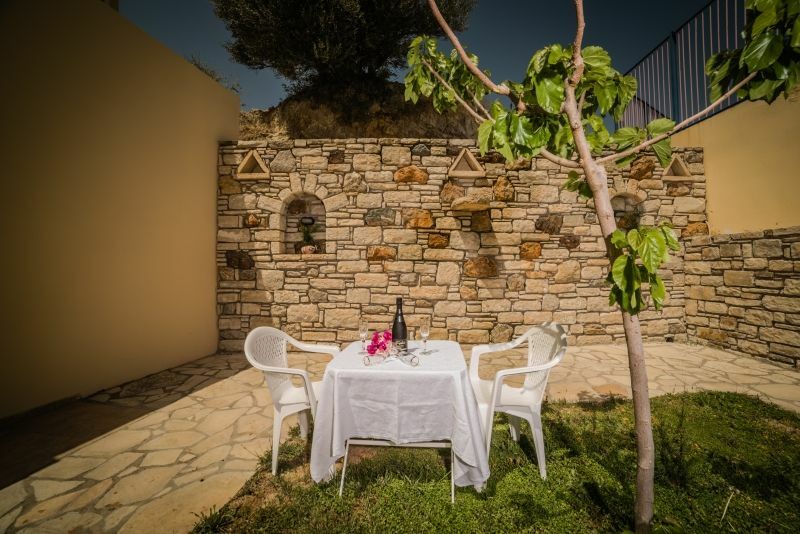 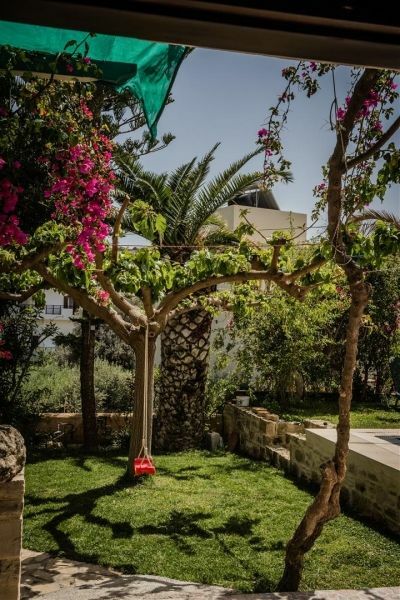 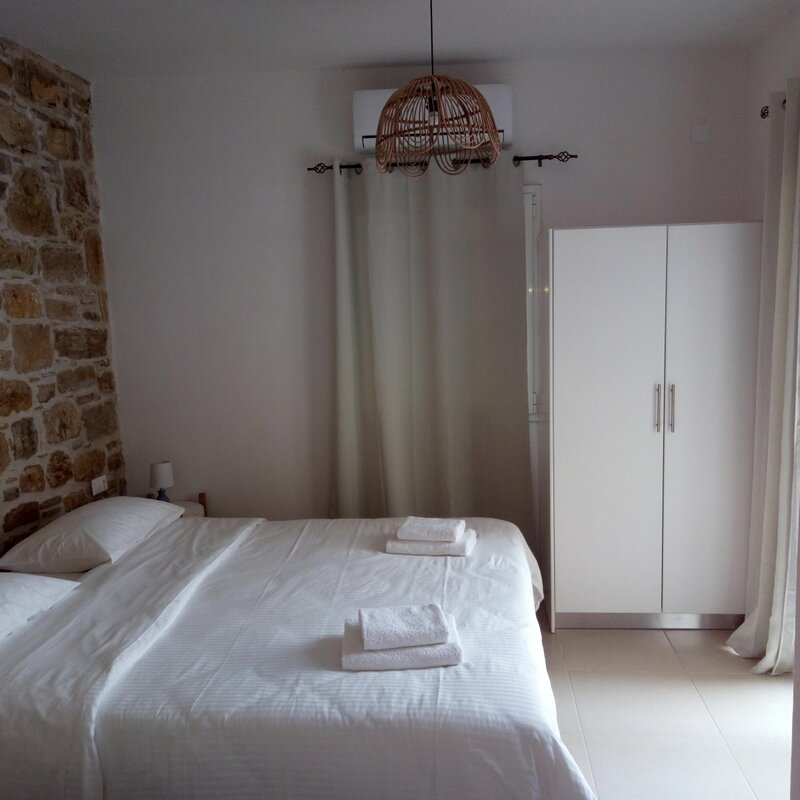 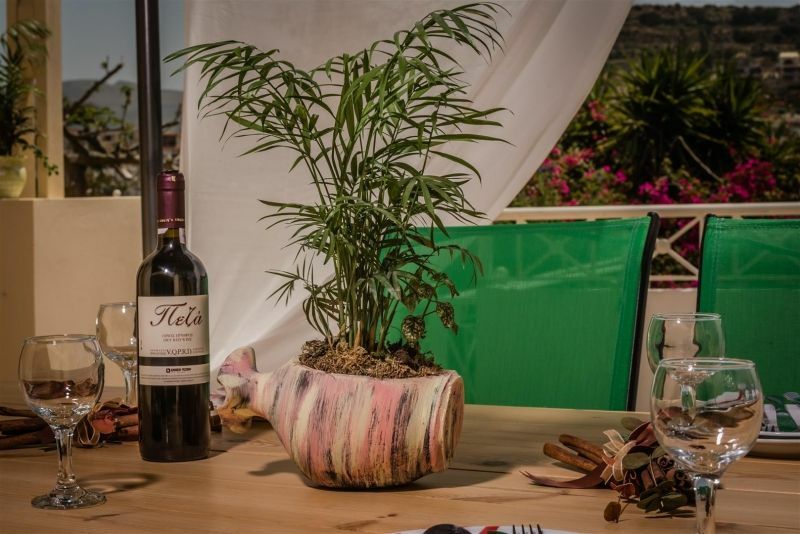 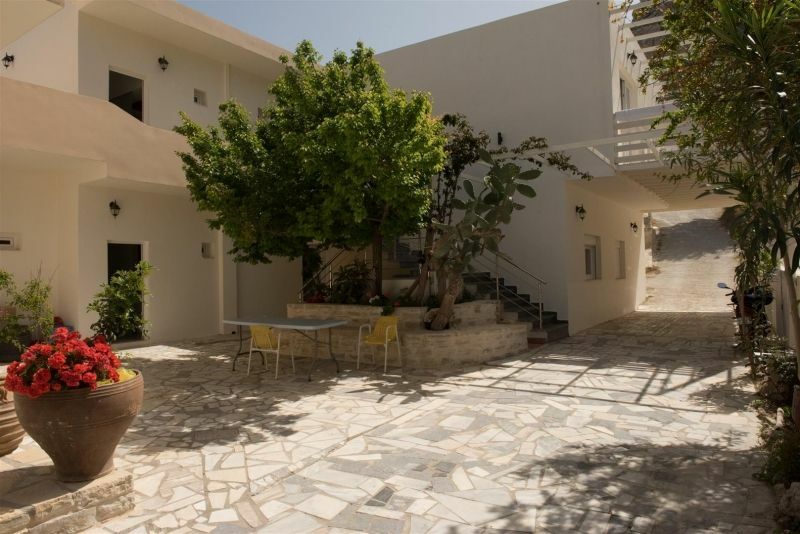 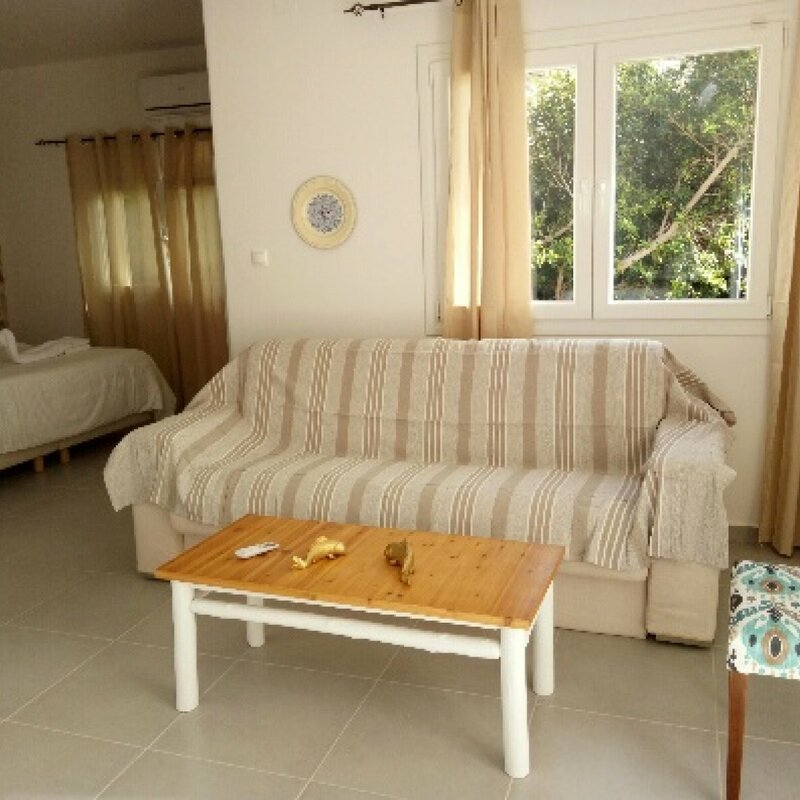 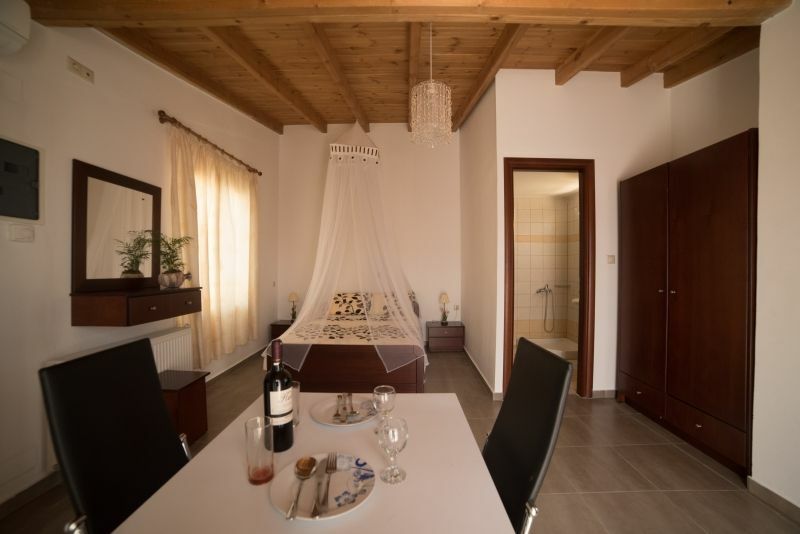 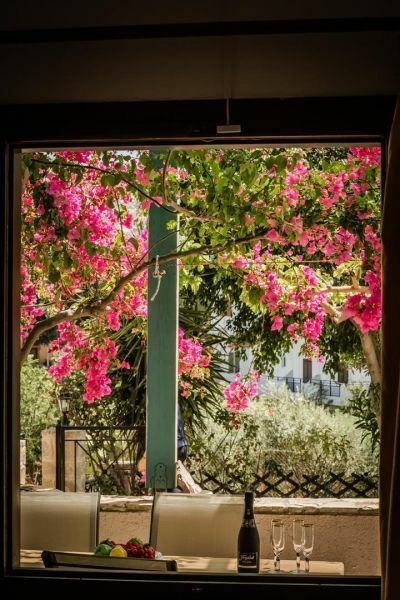 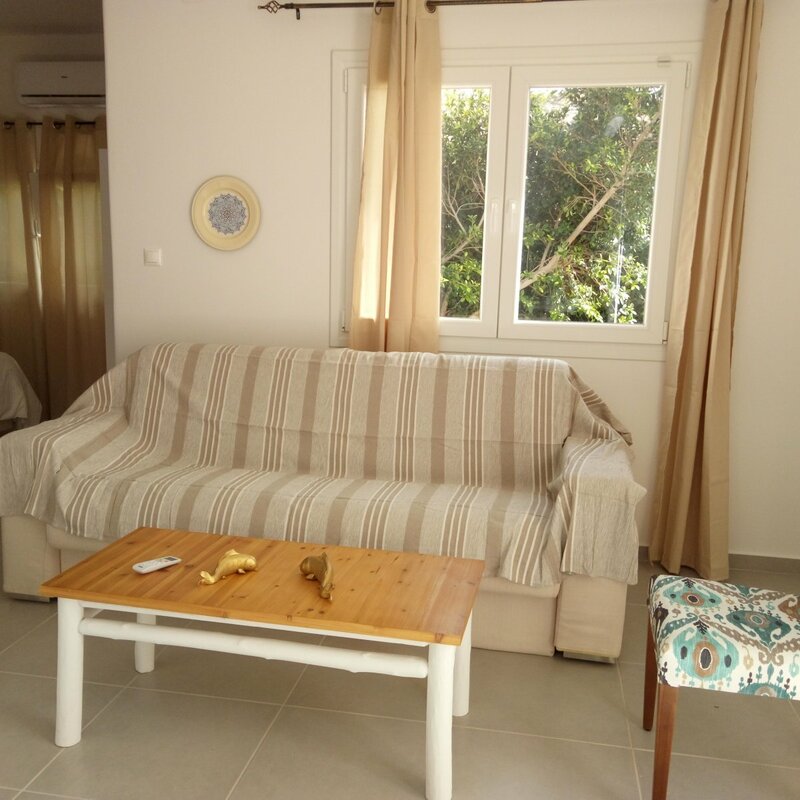 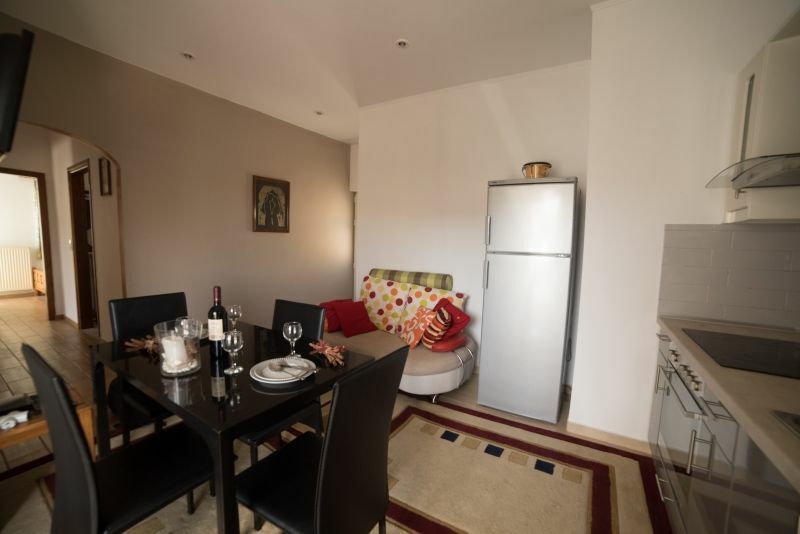 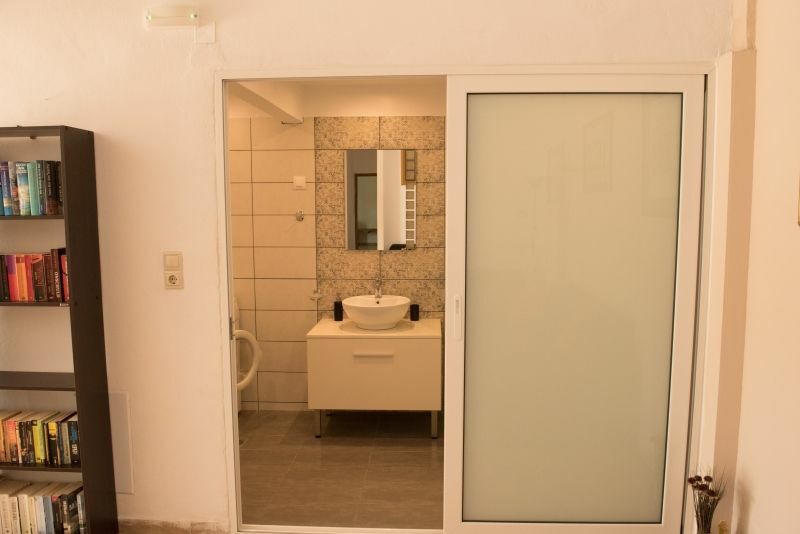 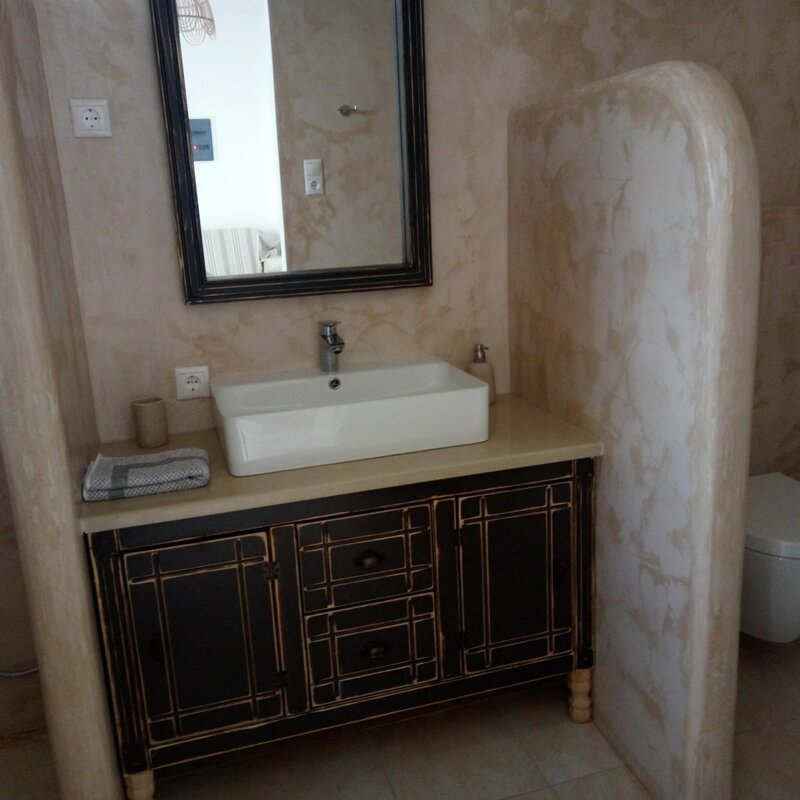 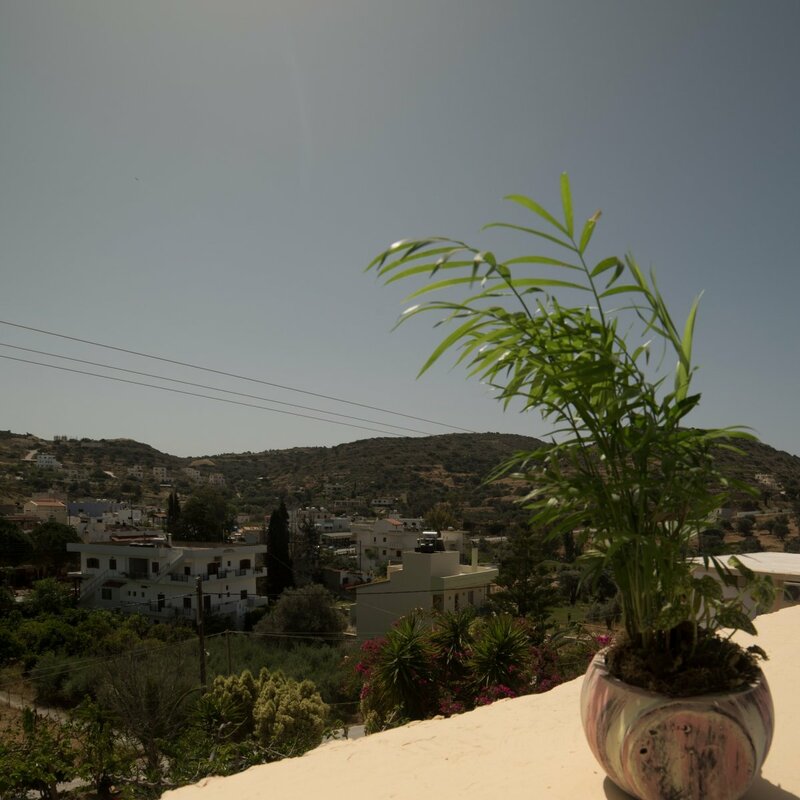 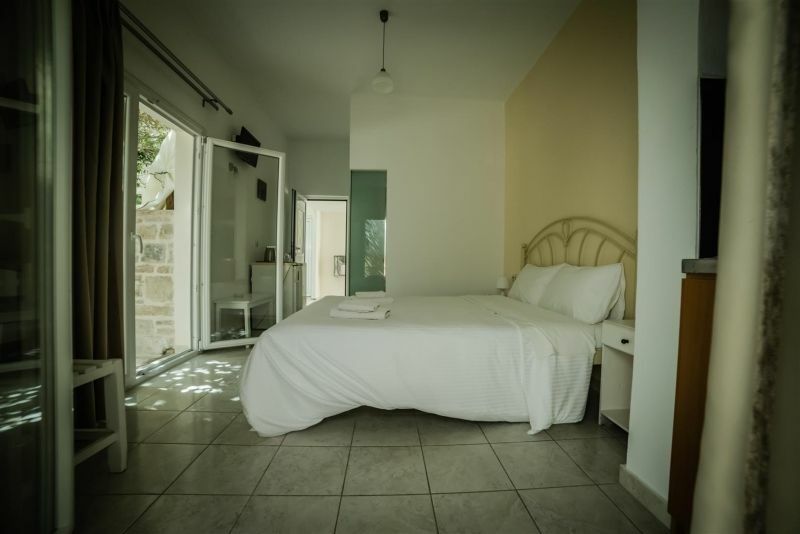 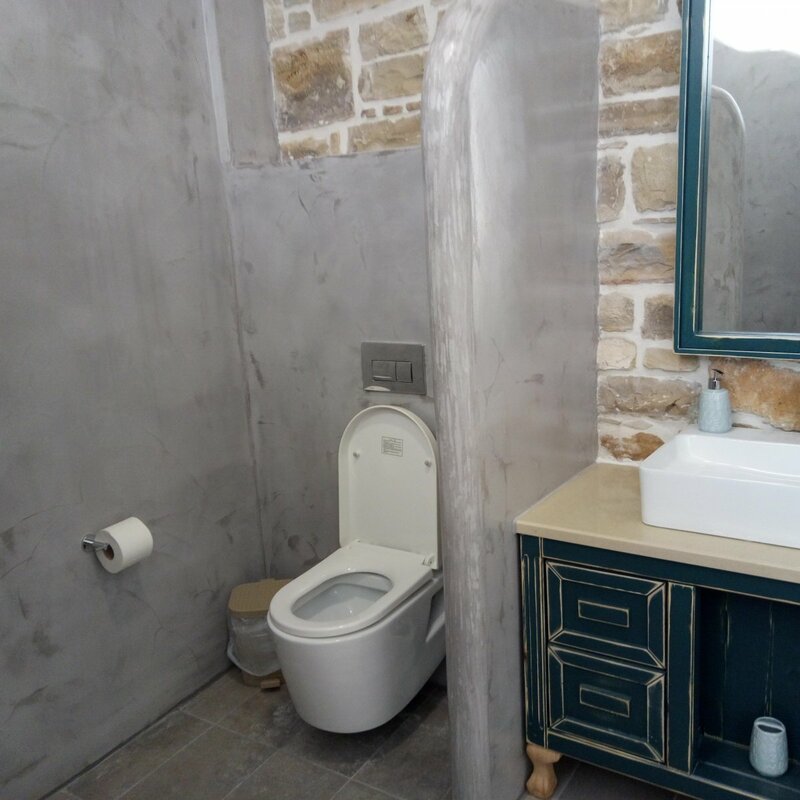 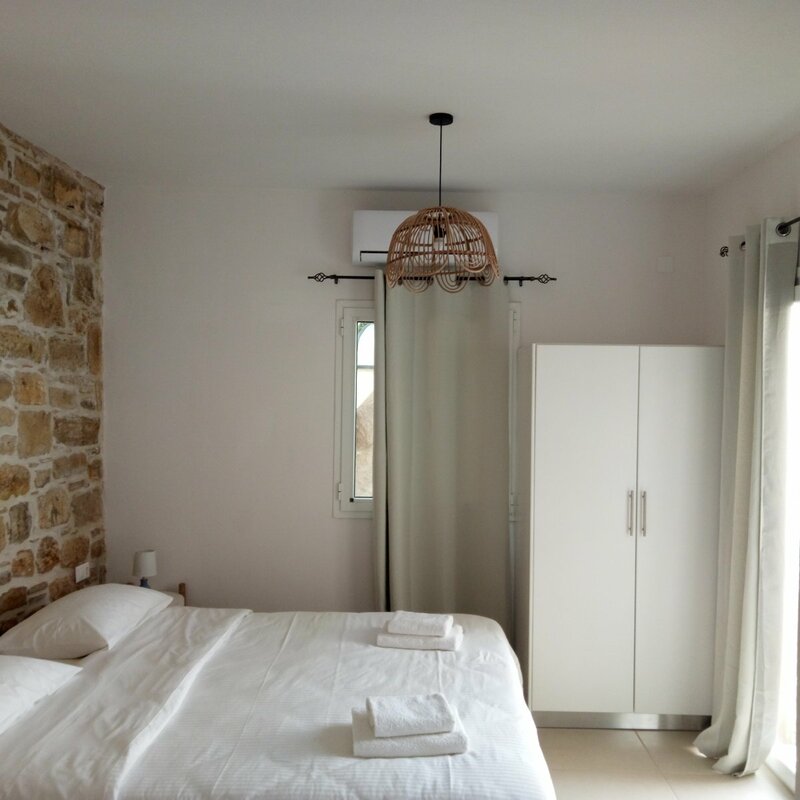 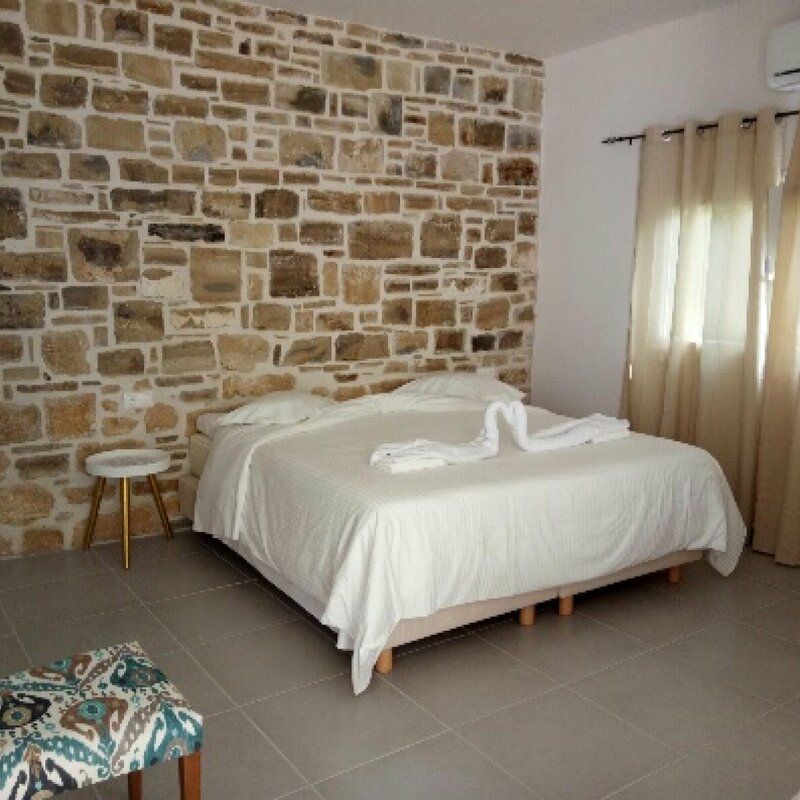 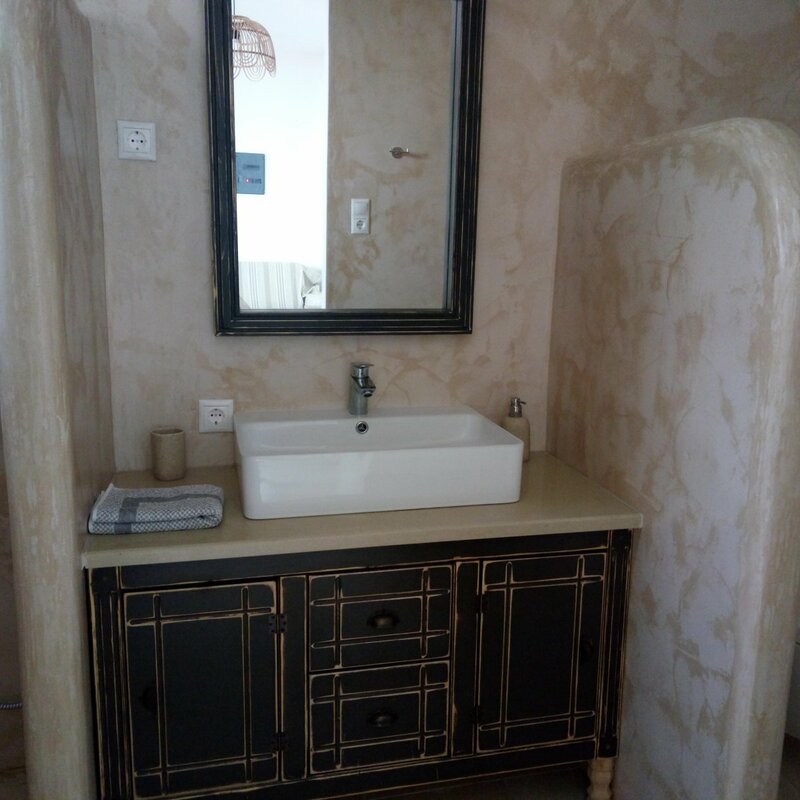 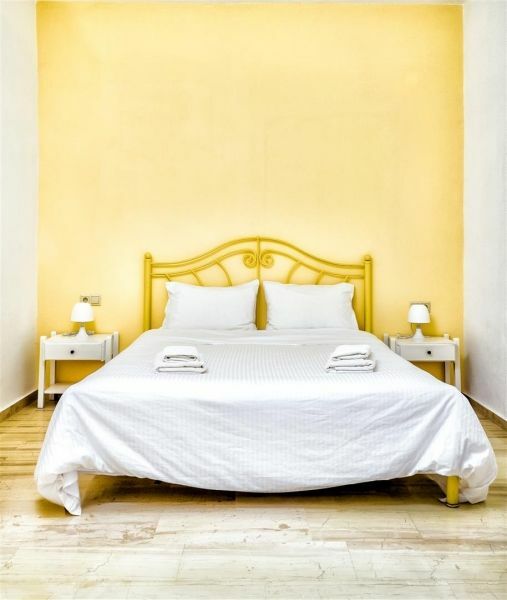 All apartments are furnished in traditional Cretan style and equipped with bathroom (shower/WC), fridge and phone each (extra baby cot possible). 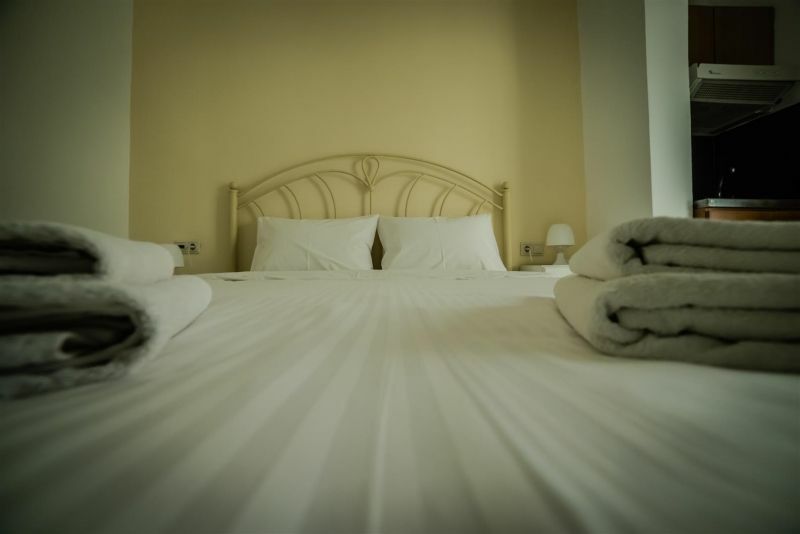 Room cleaning is provided daily, air condition is available without any extra fee. 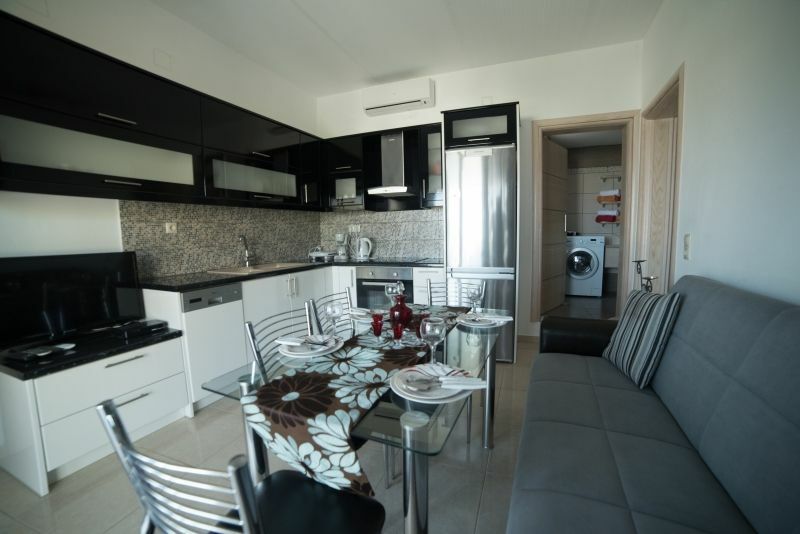 Apts. 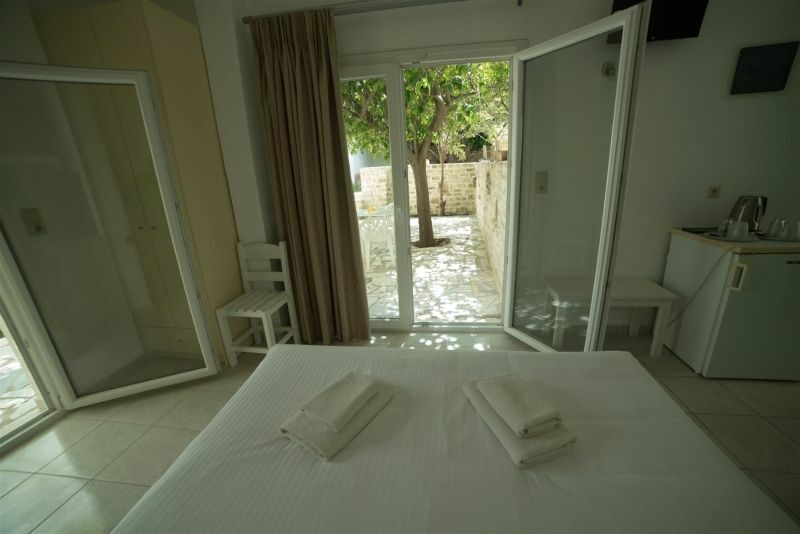 Mike are situated in Pitsidia, just a 900M from Komo Beach, which is one of the most beautiful beaches of Crete. 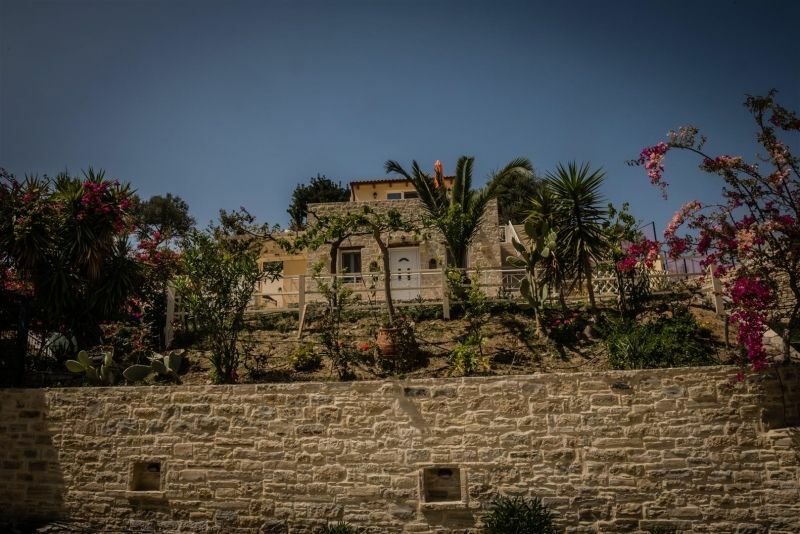 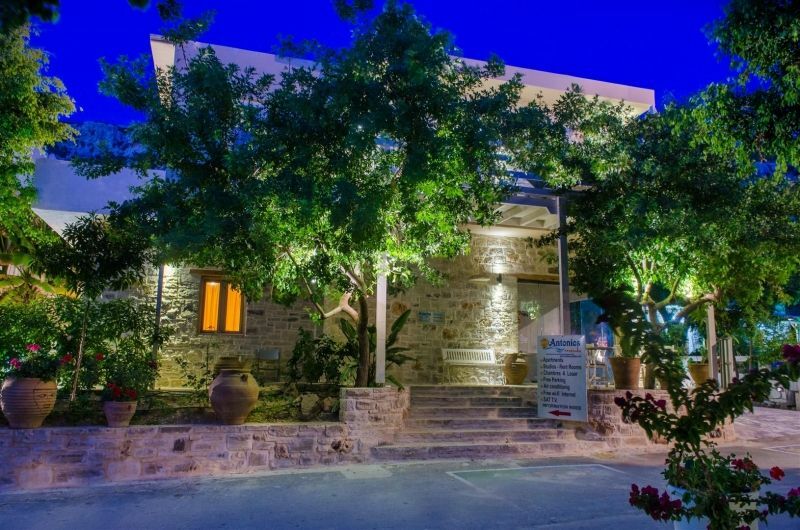 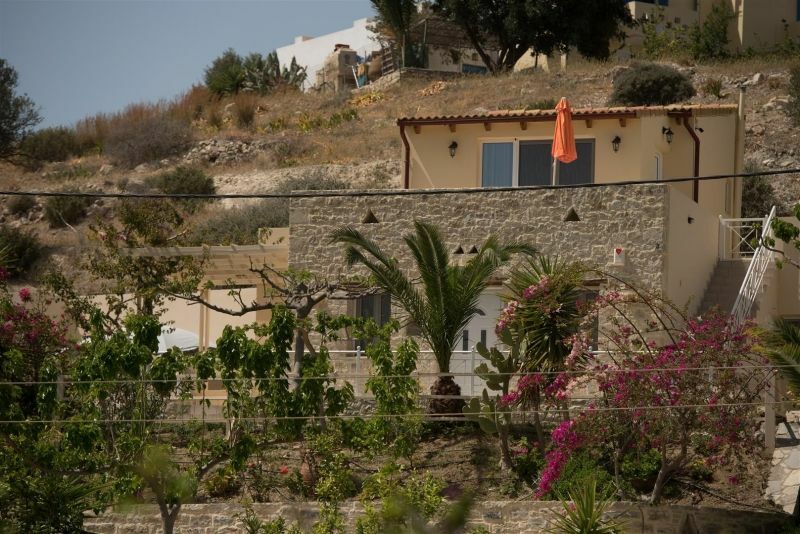 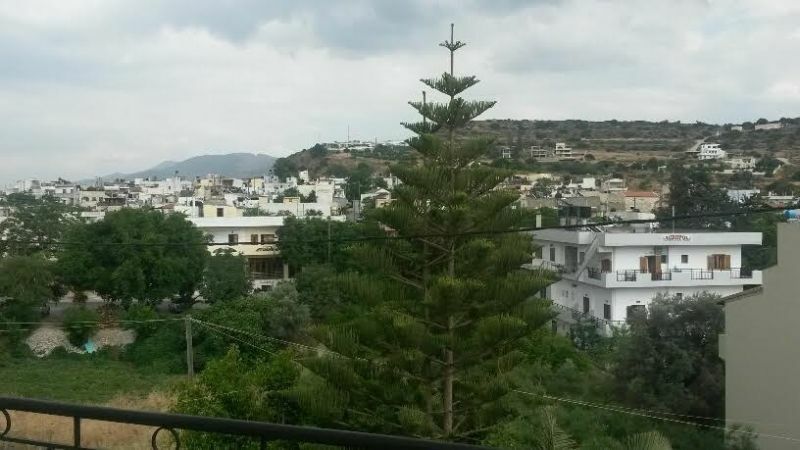 They are only a stone's throw away from the centre of the typical Cretan village. 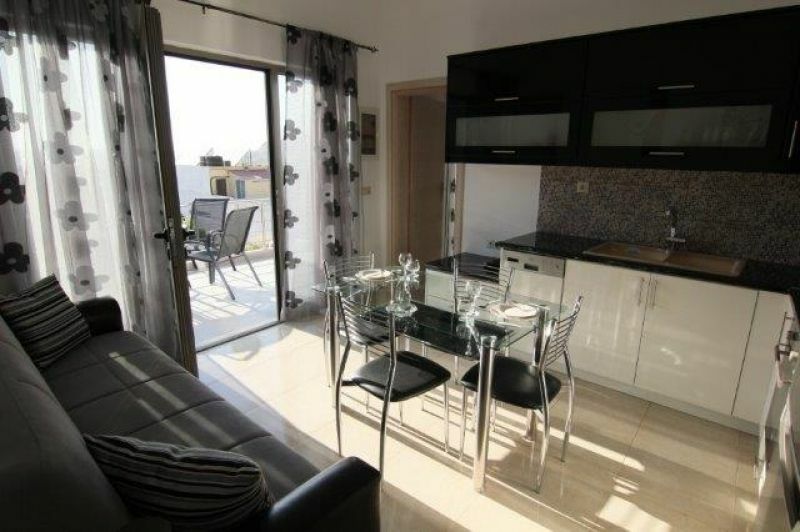 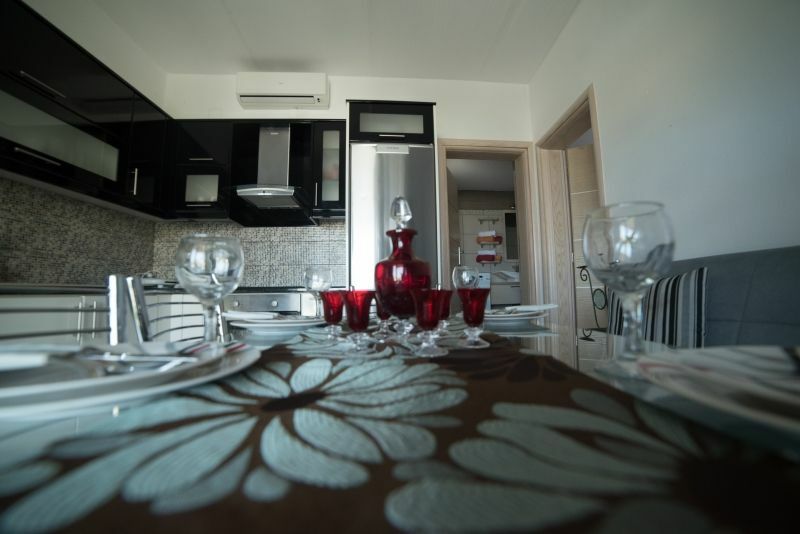 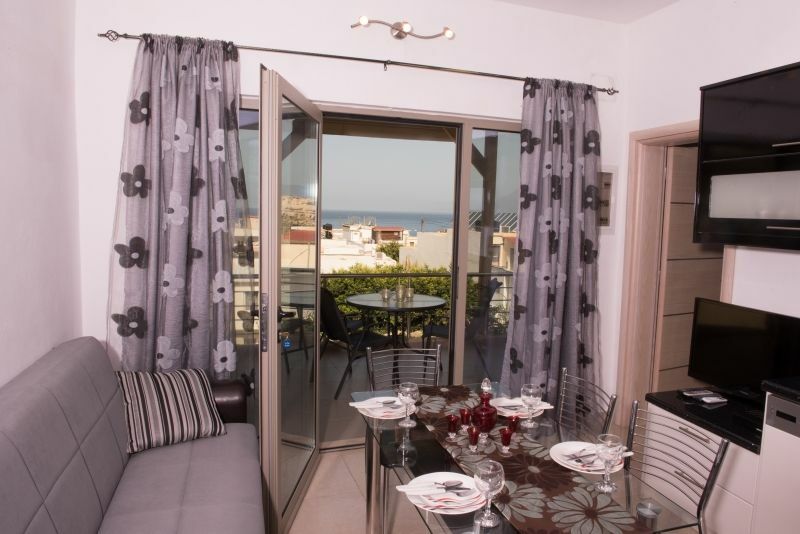 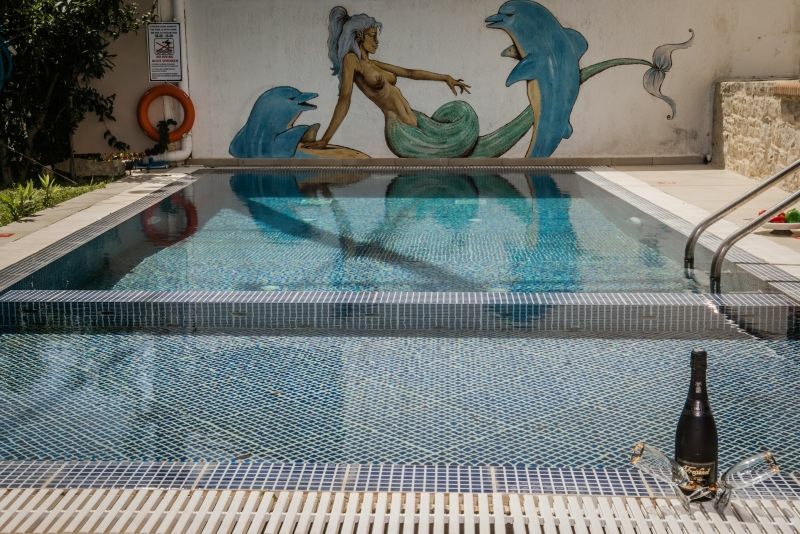 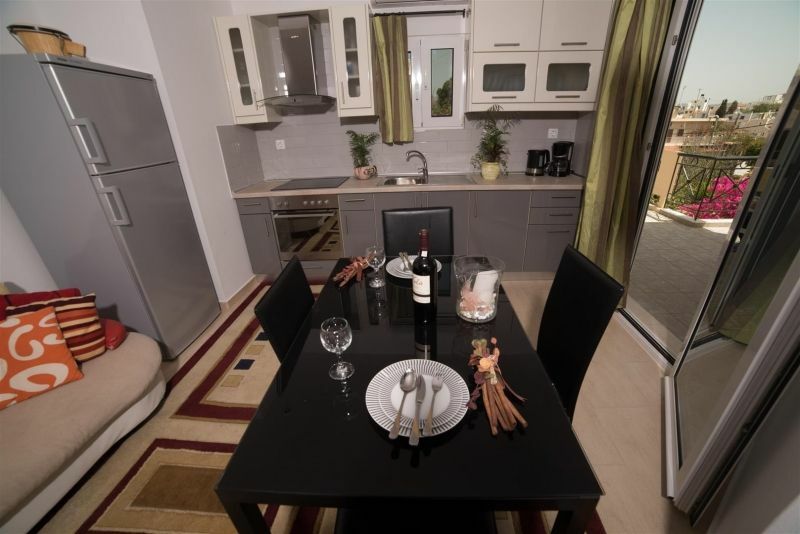 Its spacious first floor holiday homes of 100 sqm size accommodate up to SIX persons. 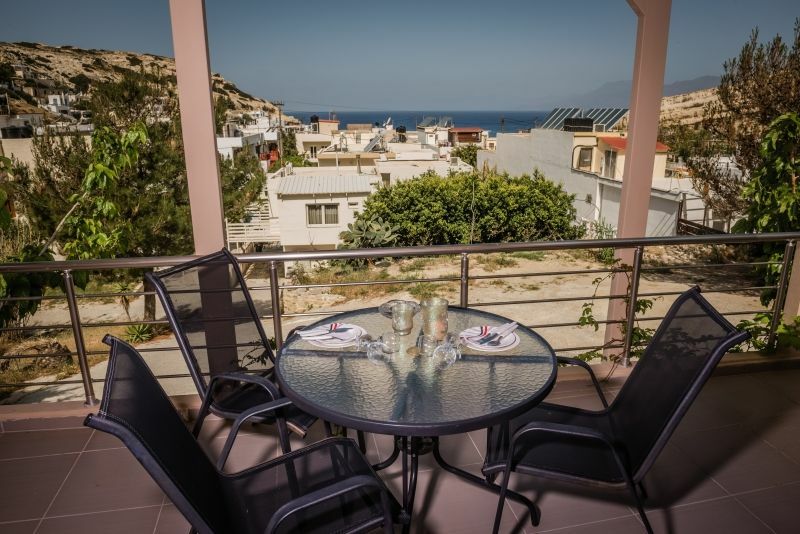 From the all around balcony you have a panoramic view to the village and also towards Komo Beach with the famous archaeological excavation site, just to the offshore Paximadia Islands. 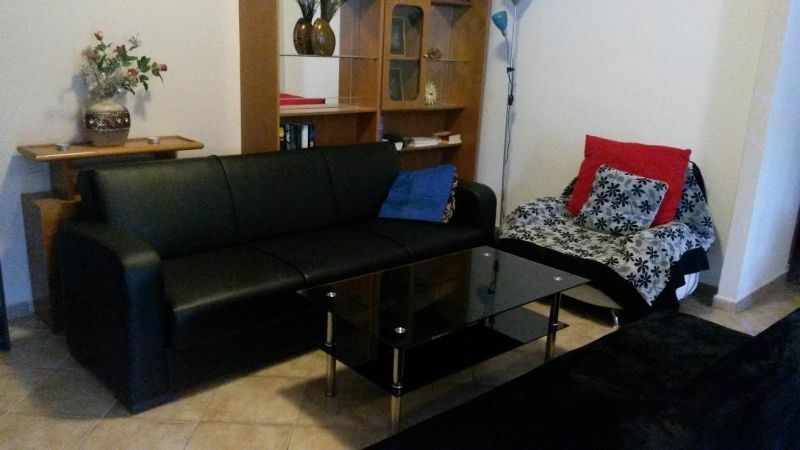 Inside the modern styled living room there are two sofas . 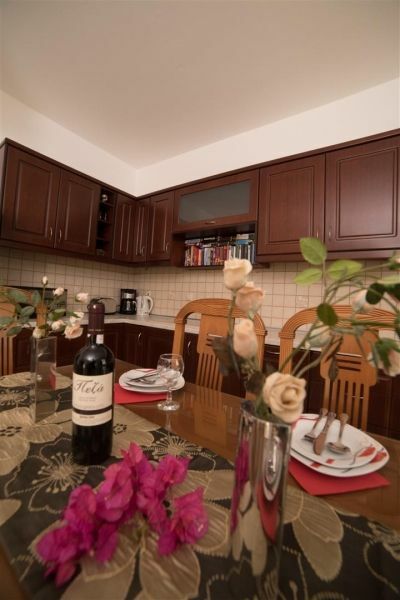 Off course Apts. 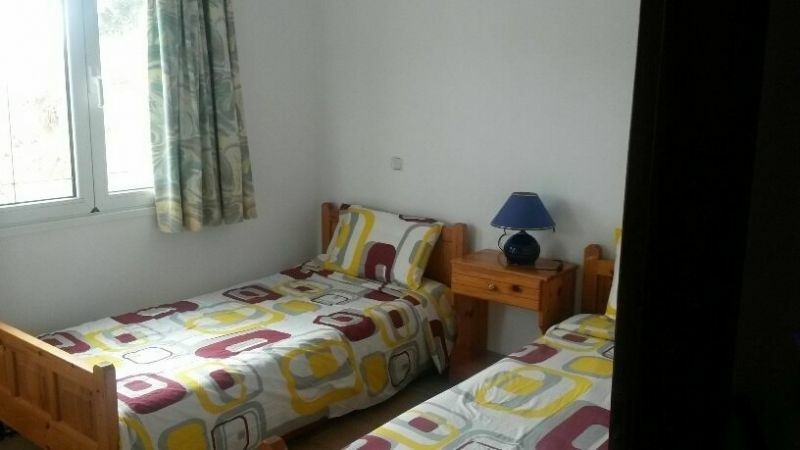 Mike are equipped with heating and air condition, furthermore a washing machine is provided. 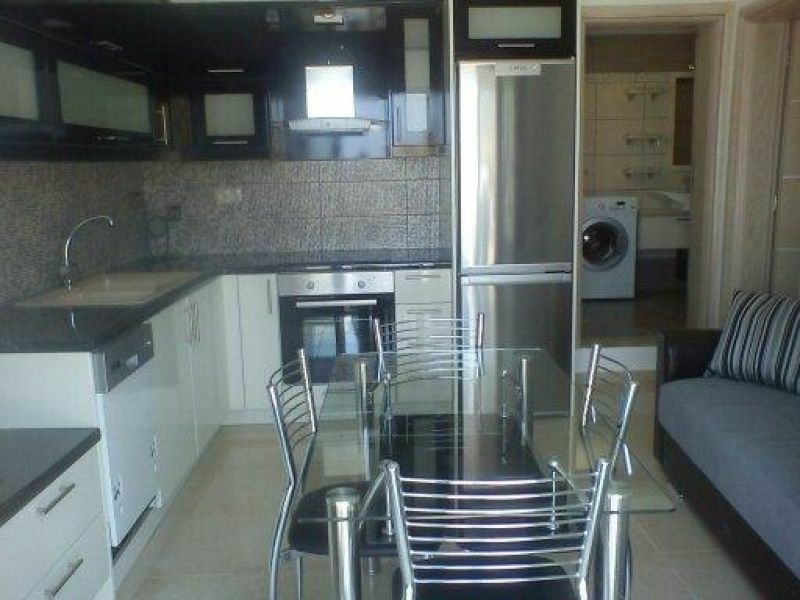 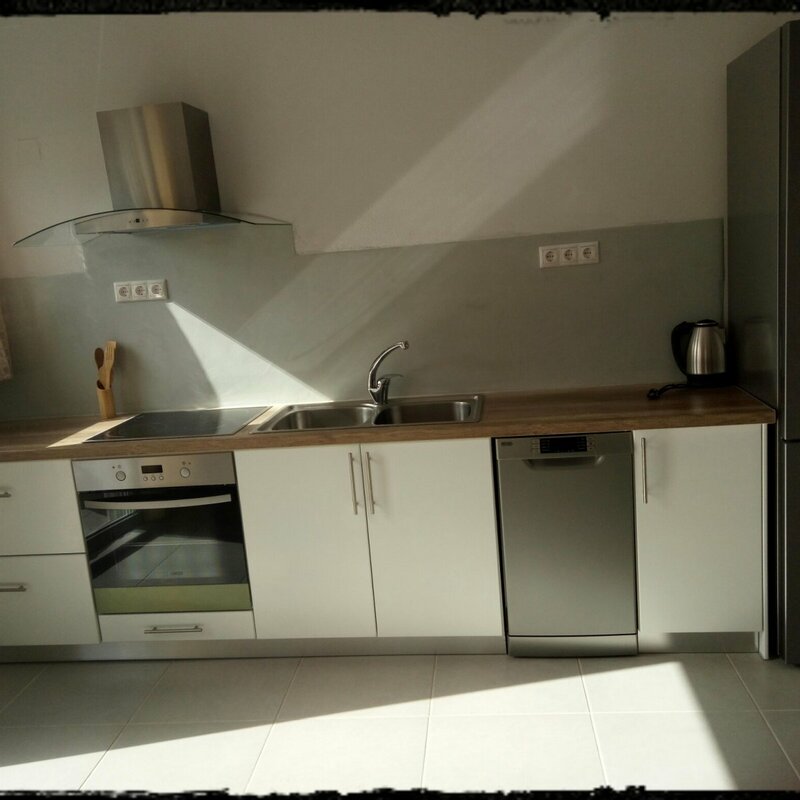 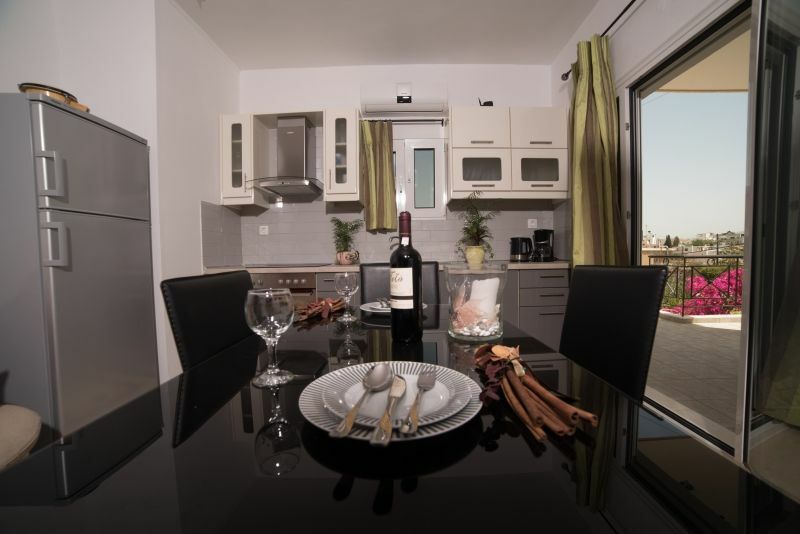 The open kitchen is fully equipped with electric range and oven, fridge, coffee maker, electric kettle and toaster. 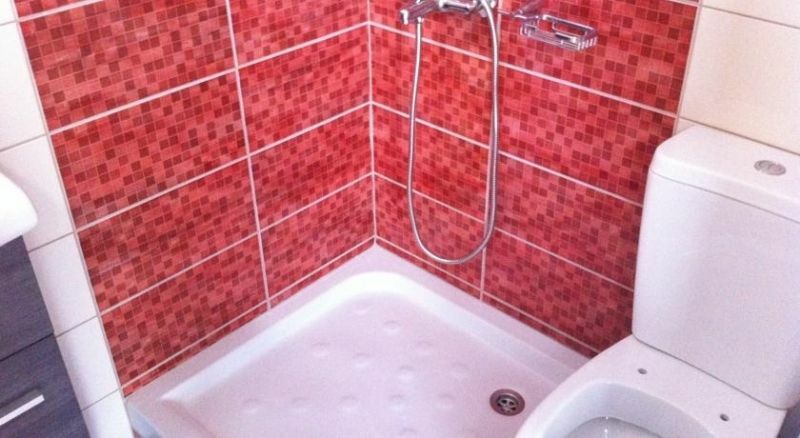 Apts. 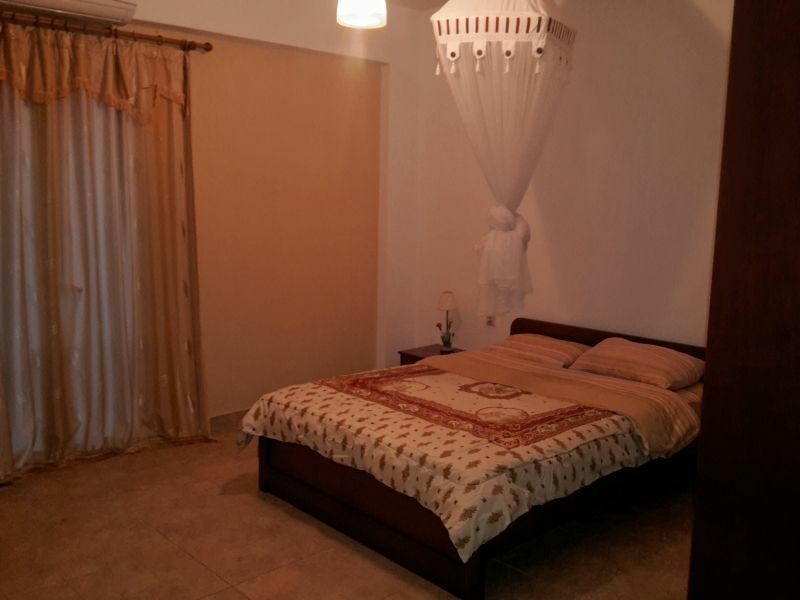 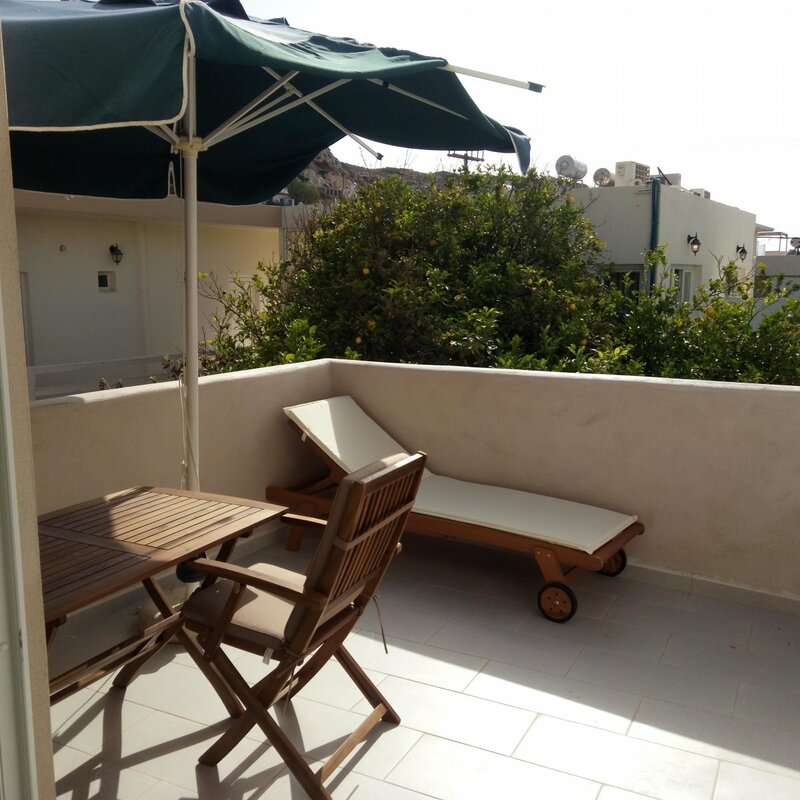 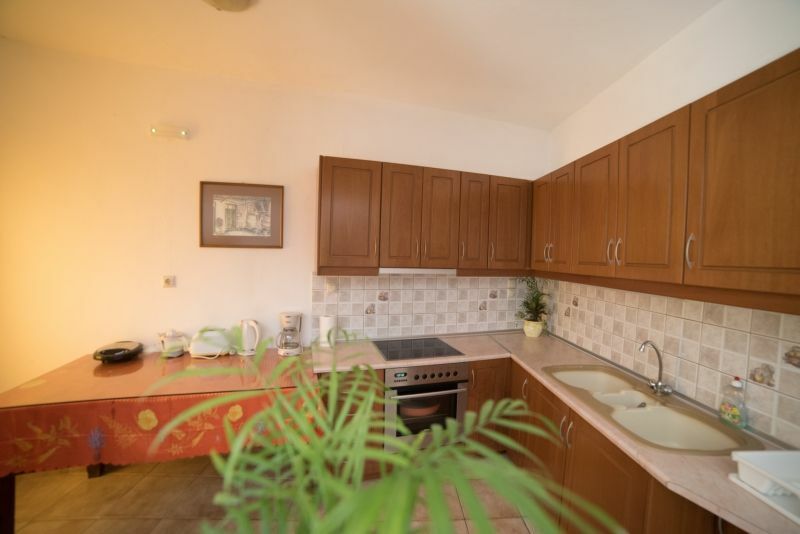 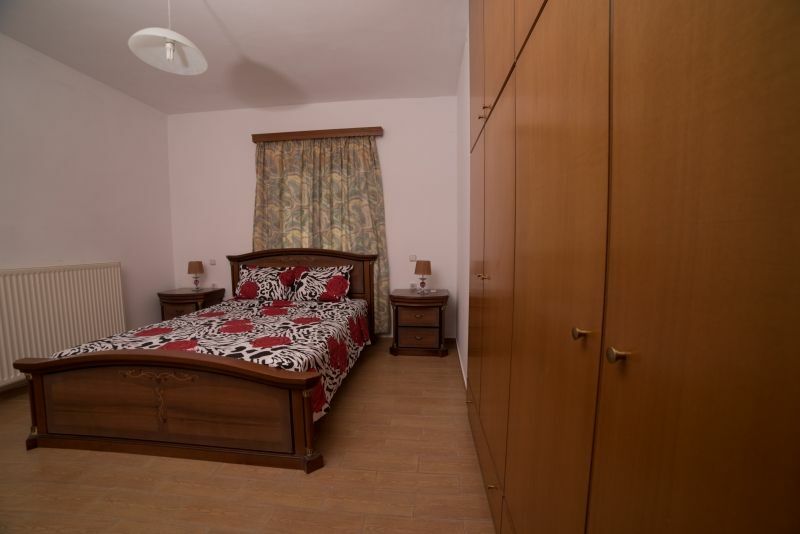 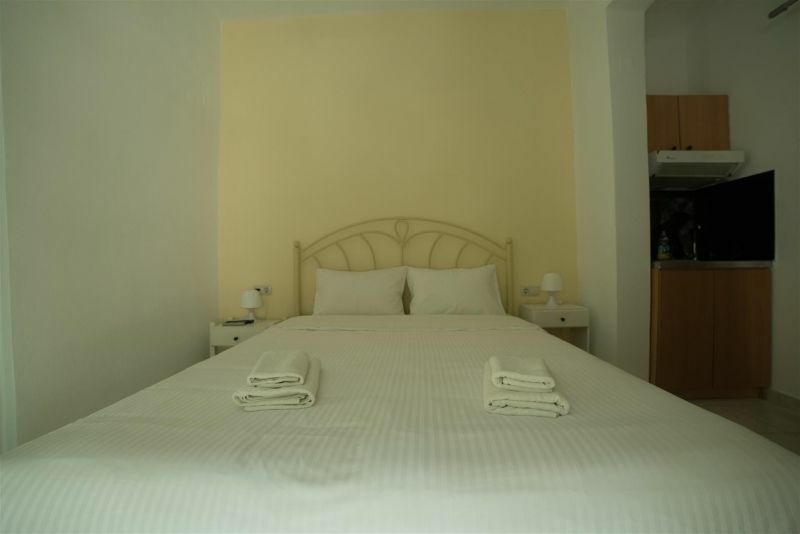 Mike have three bedrooms, equipped with a double bed and four single beds. 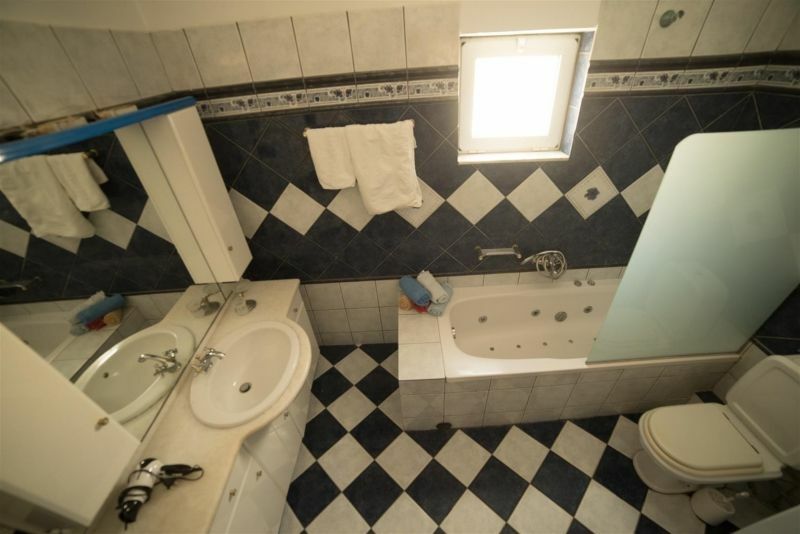 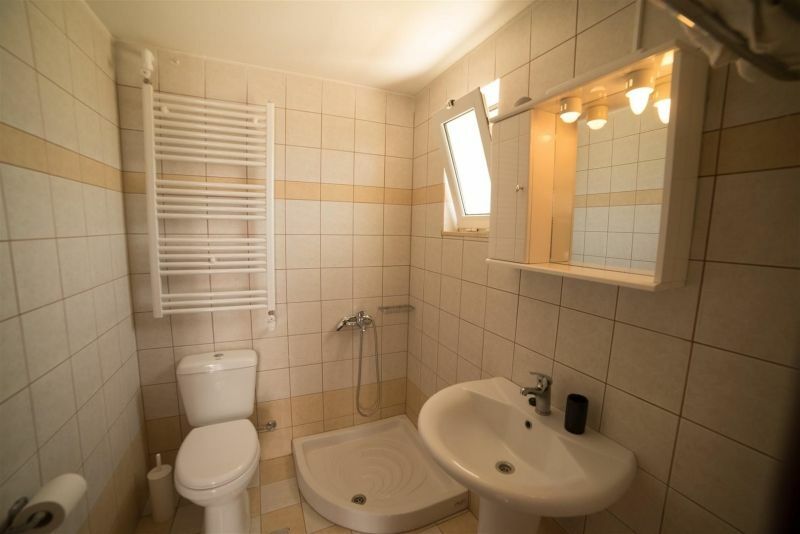 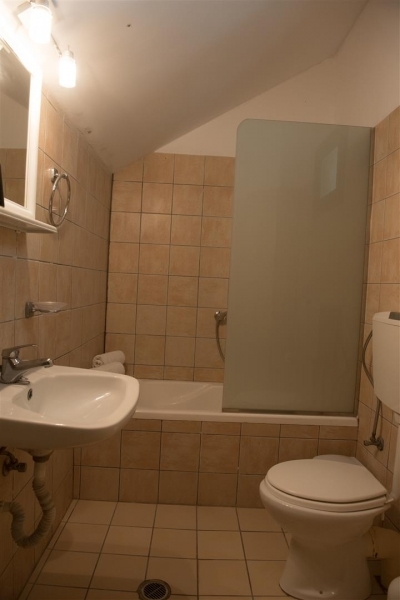 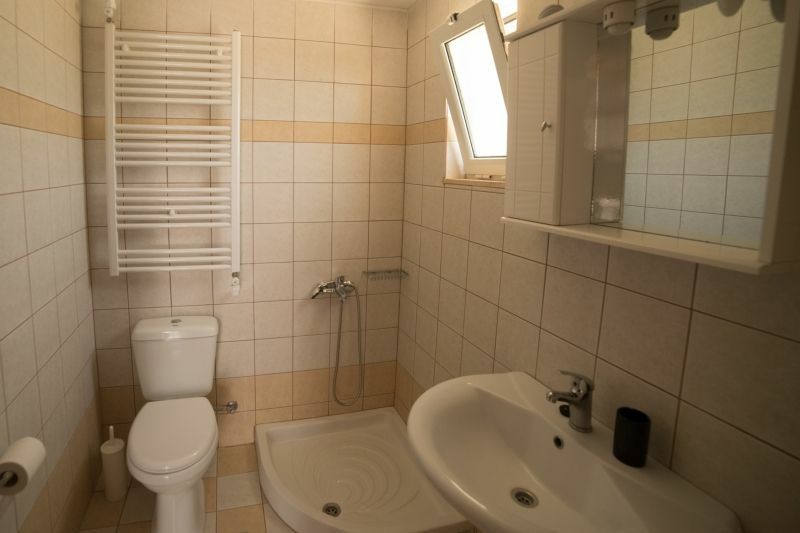 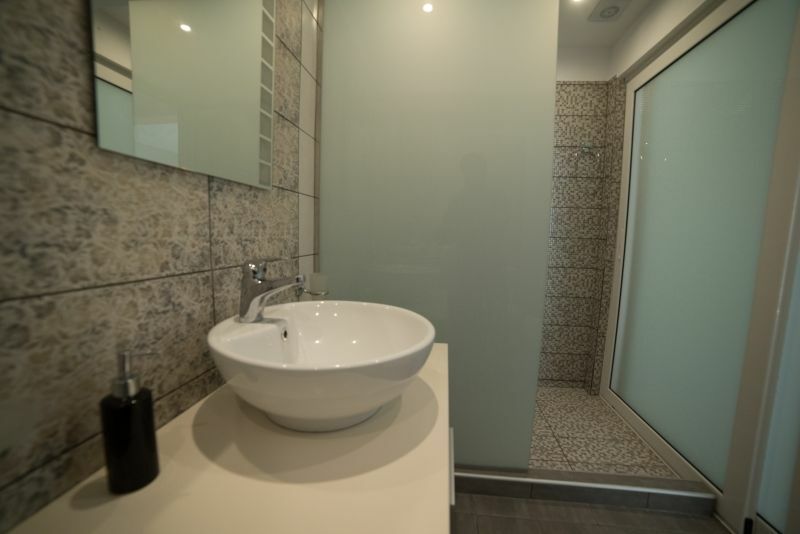 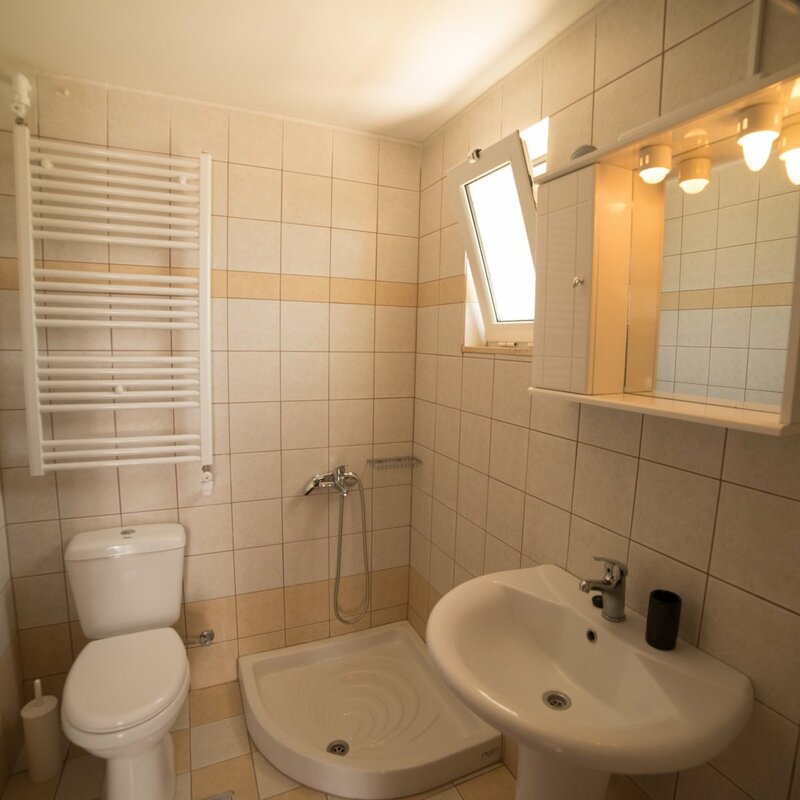 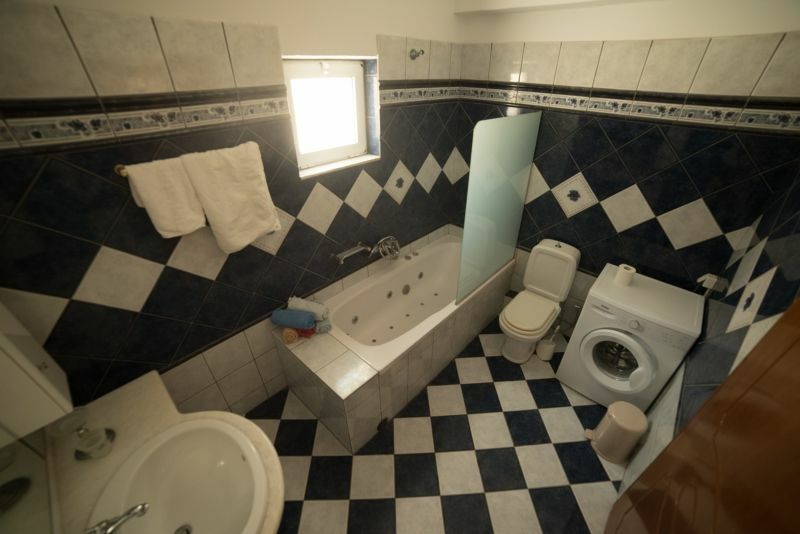 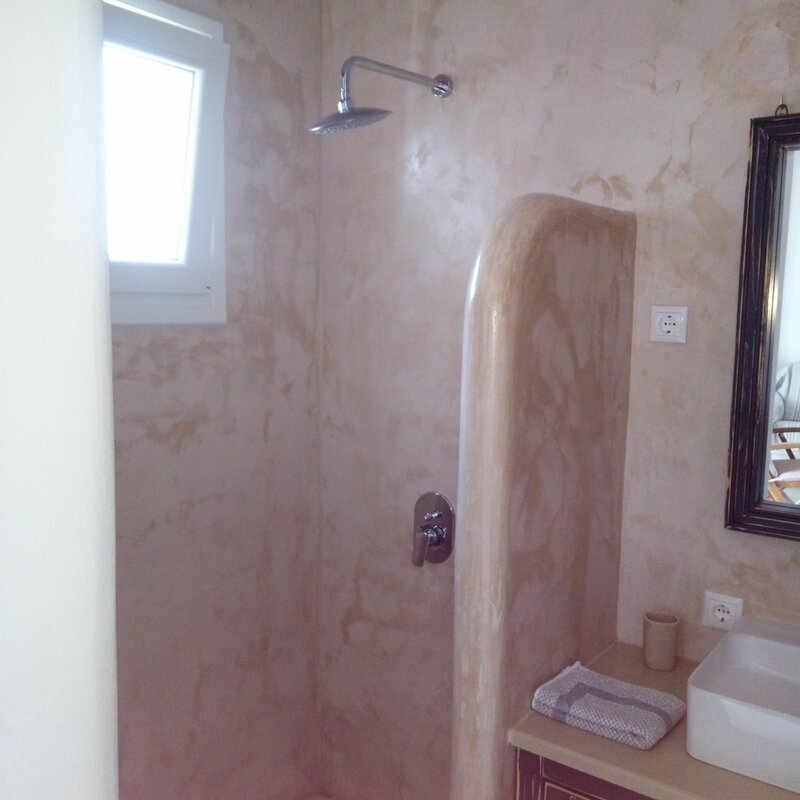 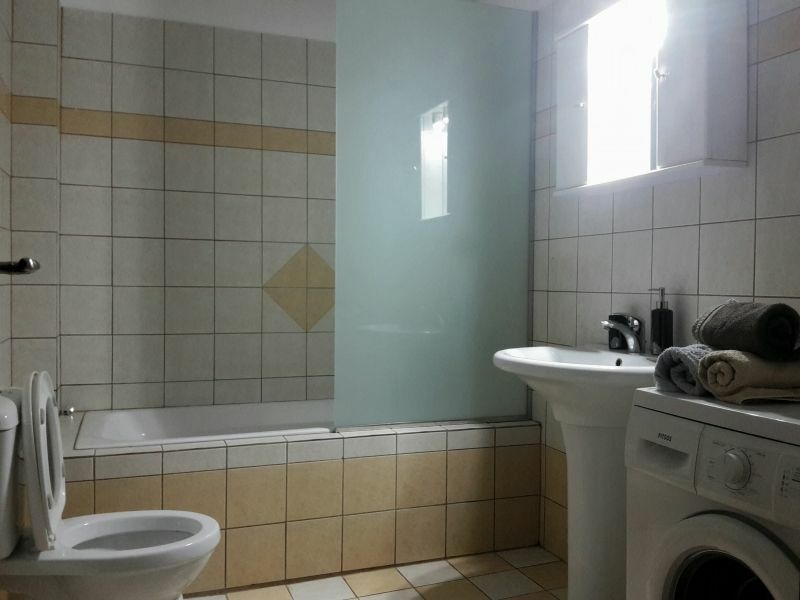 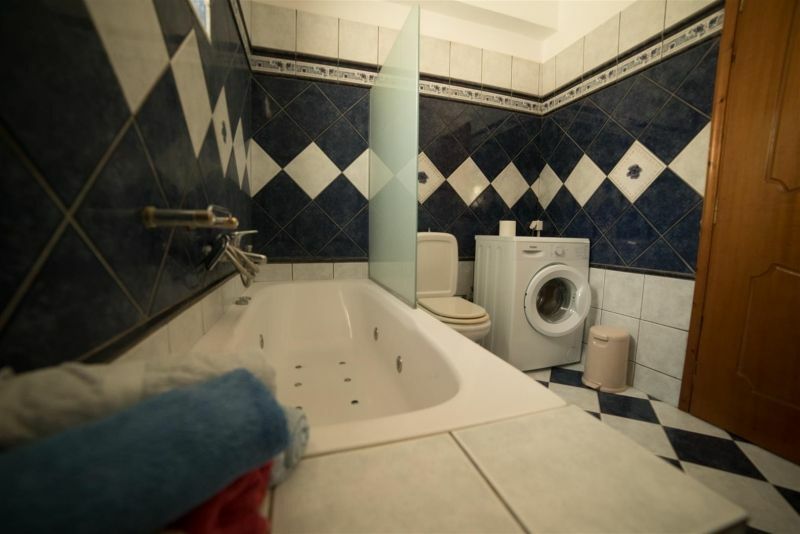 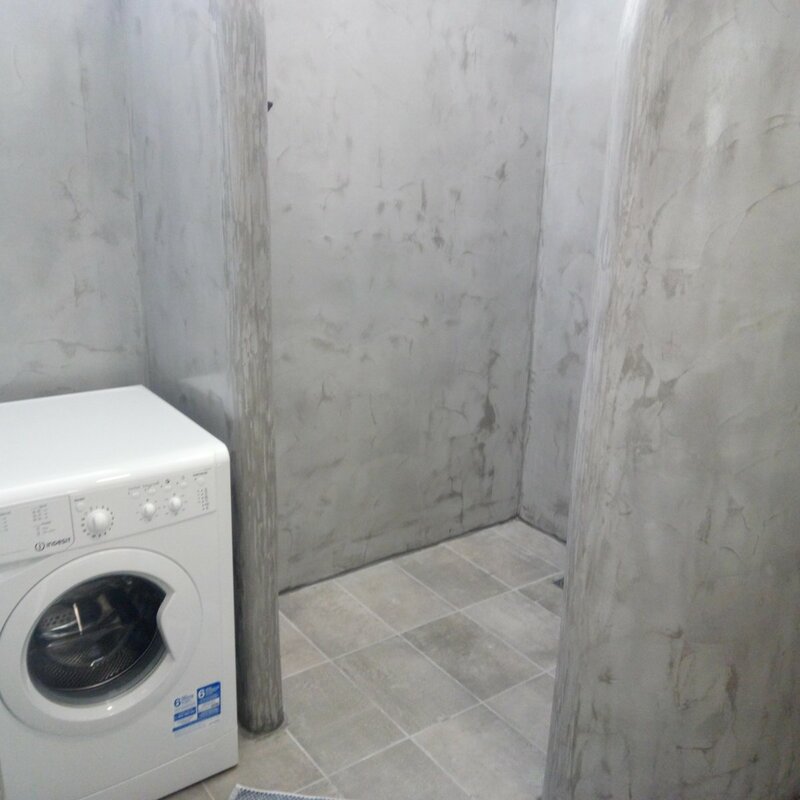 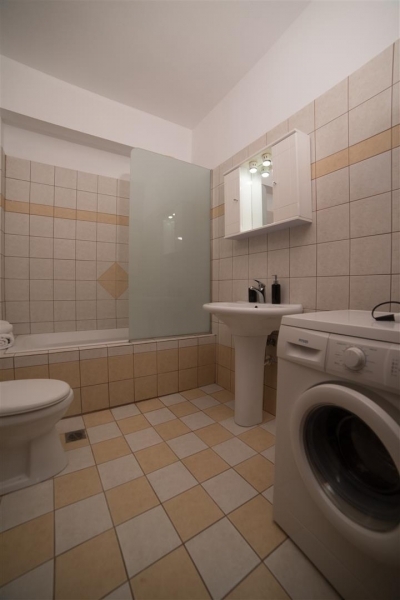 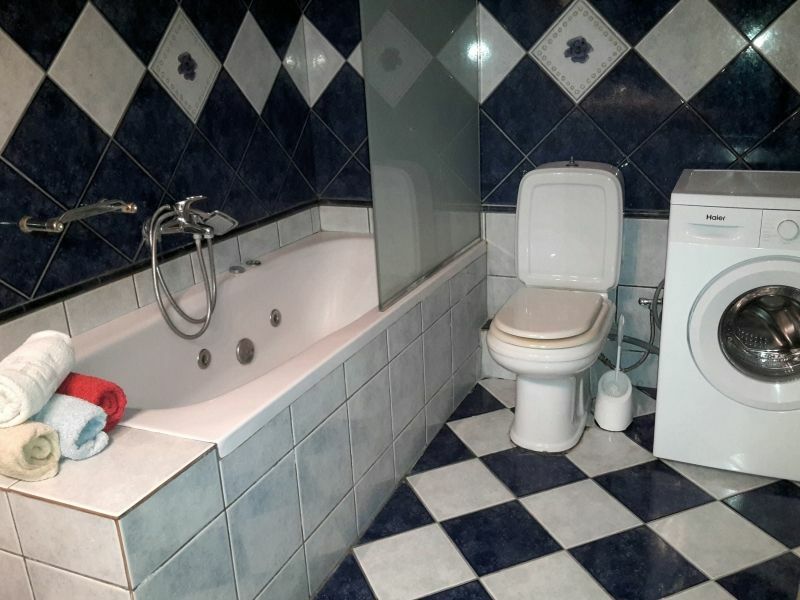 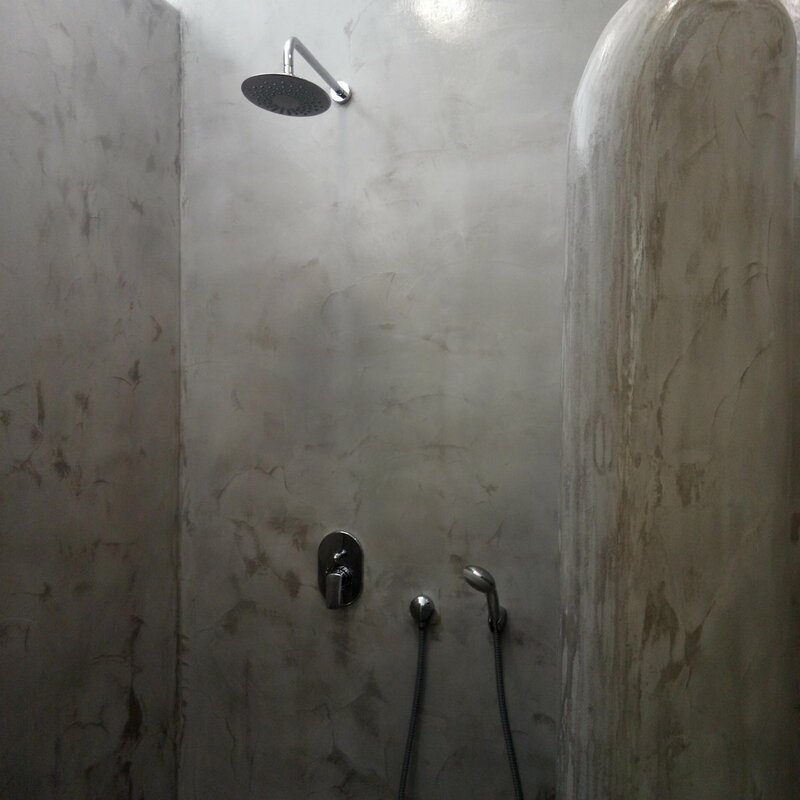 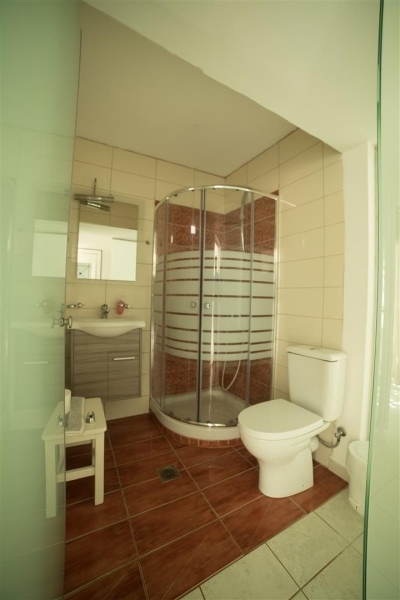 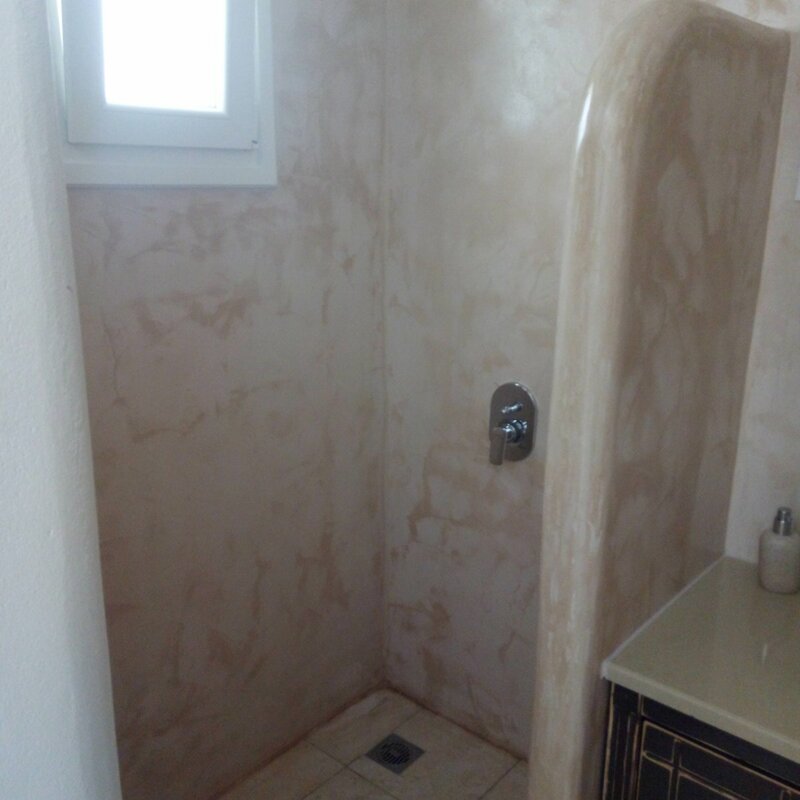 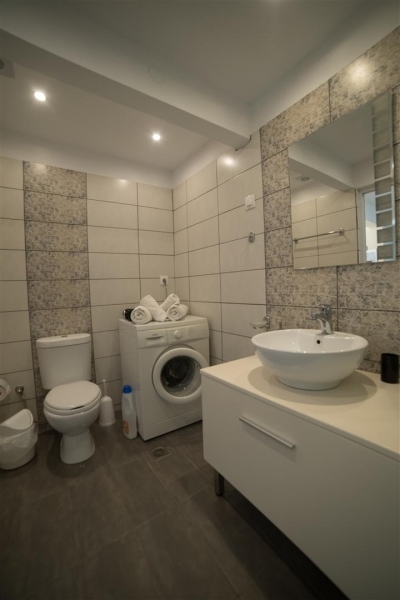 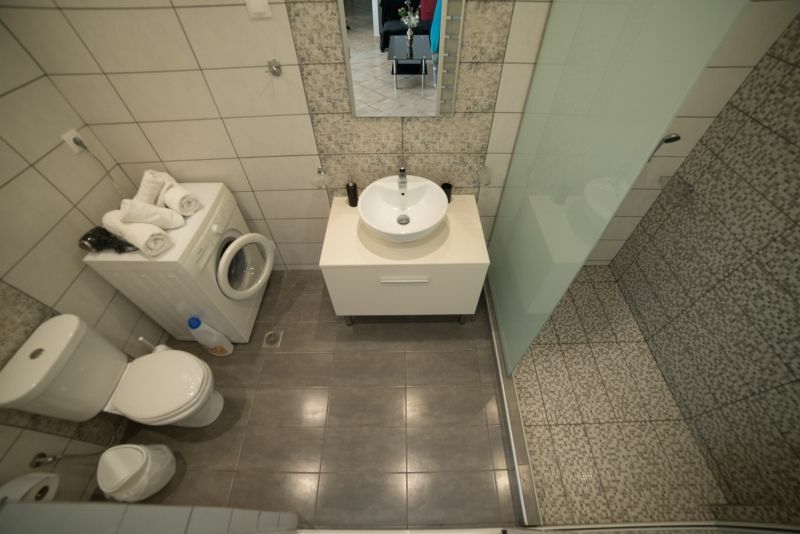 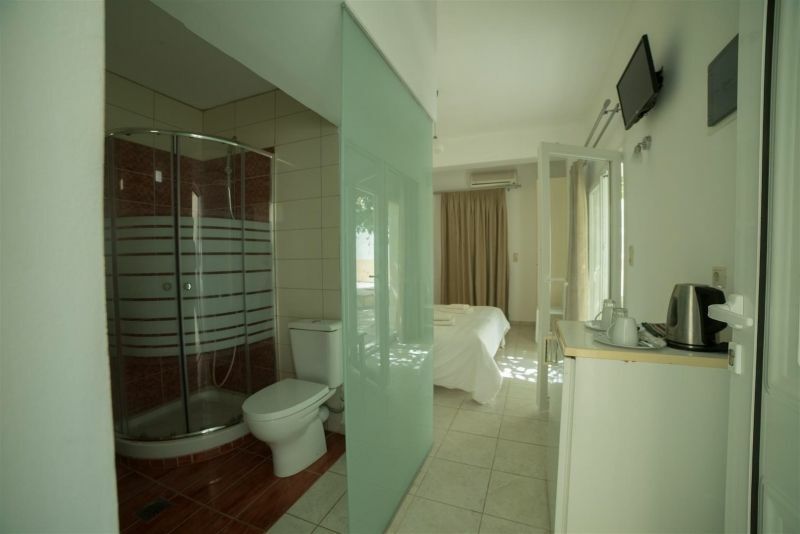 one bathrooms (with shower/toilet and bath tub/toilet) complete space provided in . 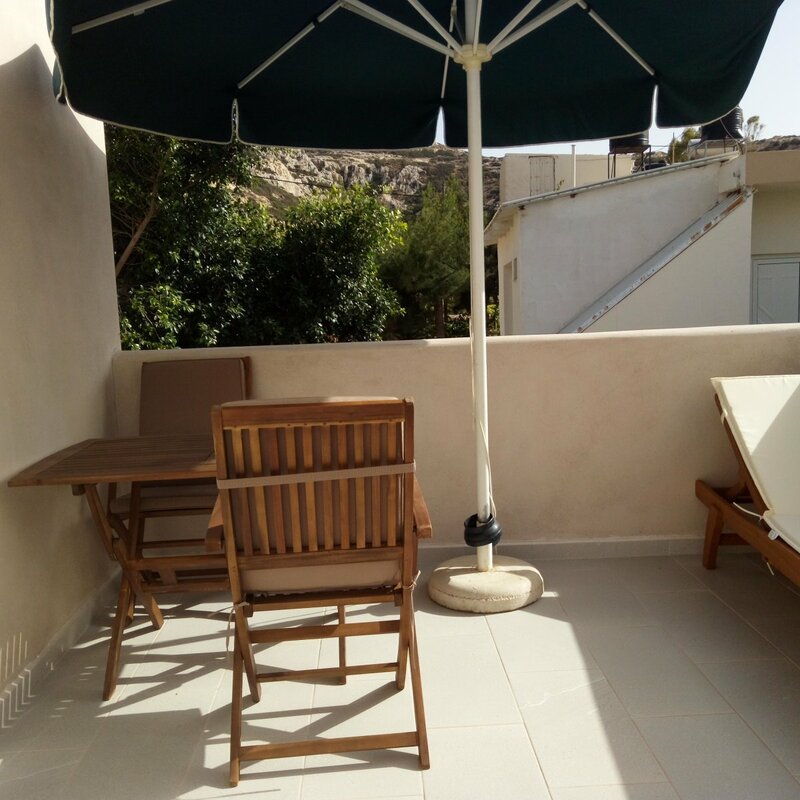 Outside there's a large terrace with barbecue. 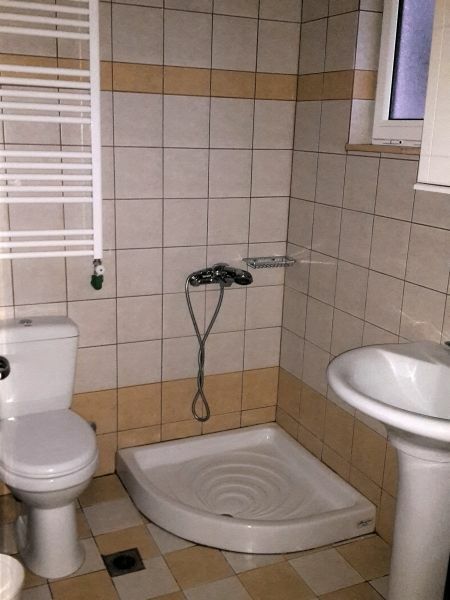 At Apts. 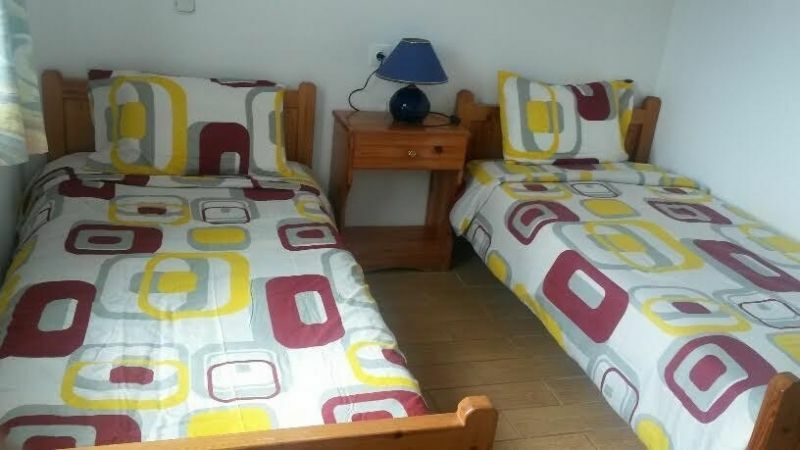 Mike you will also find parking space for two cars. 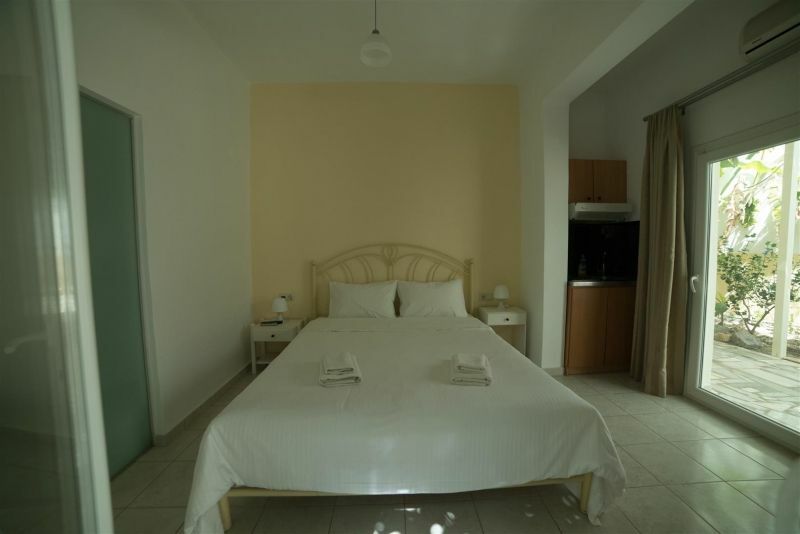 Air conditioning and Wi-Fi are included in the rate. 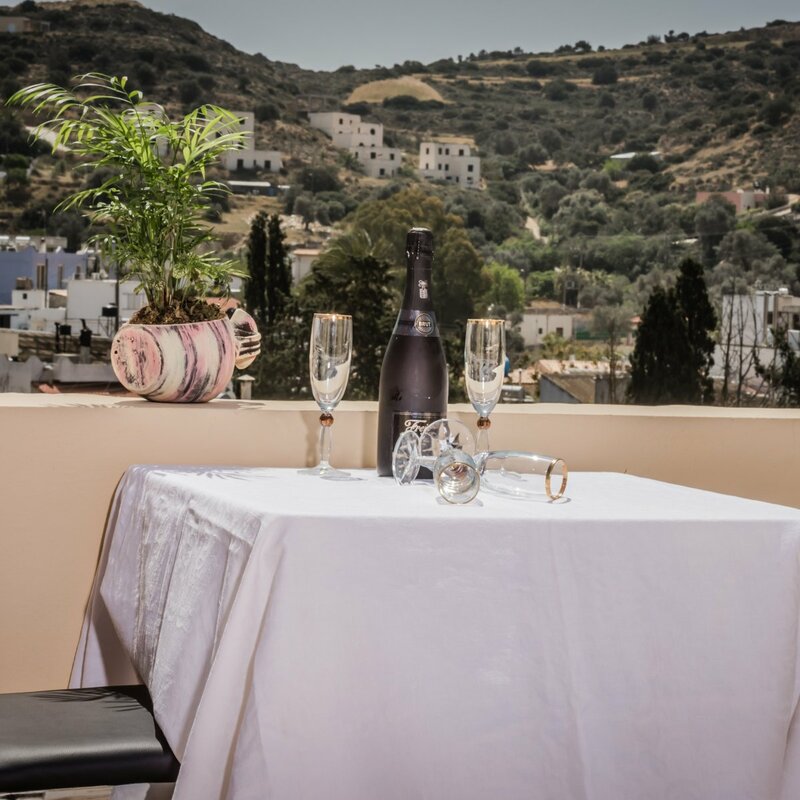 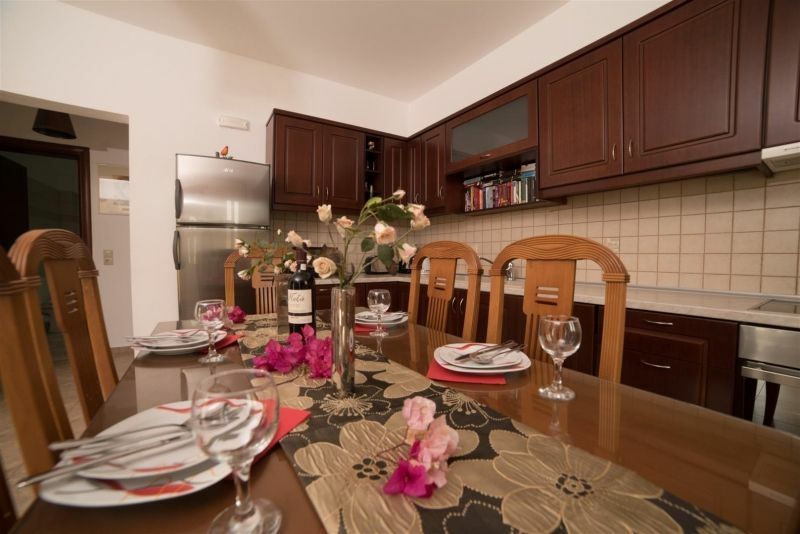 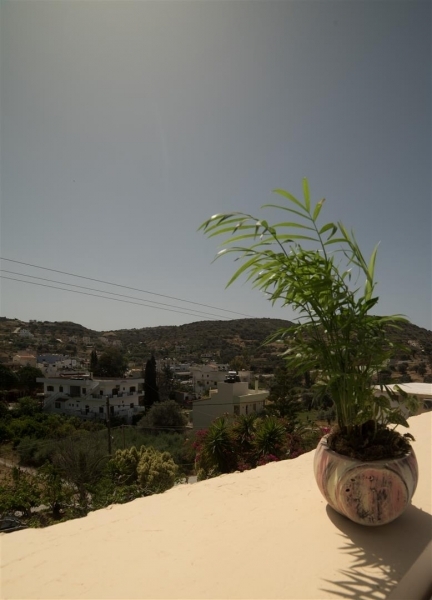 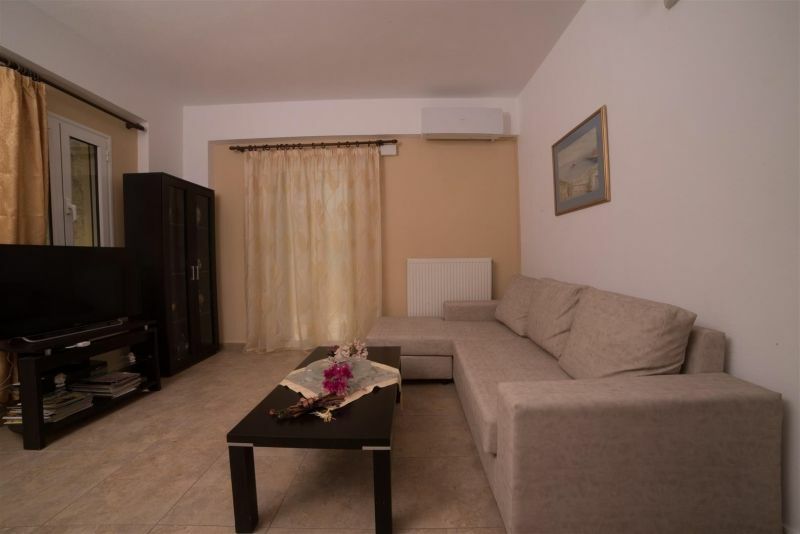 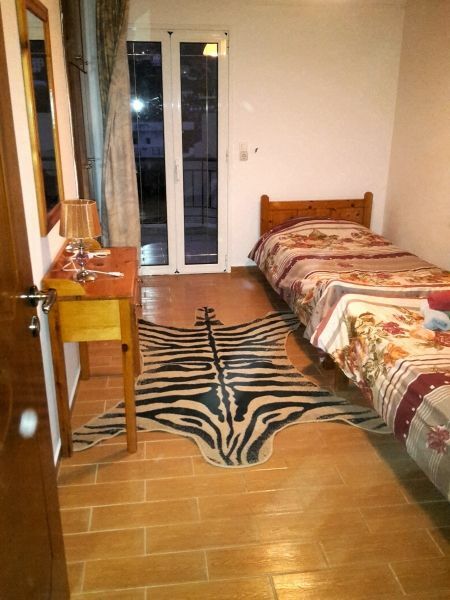 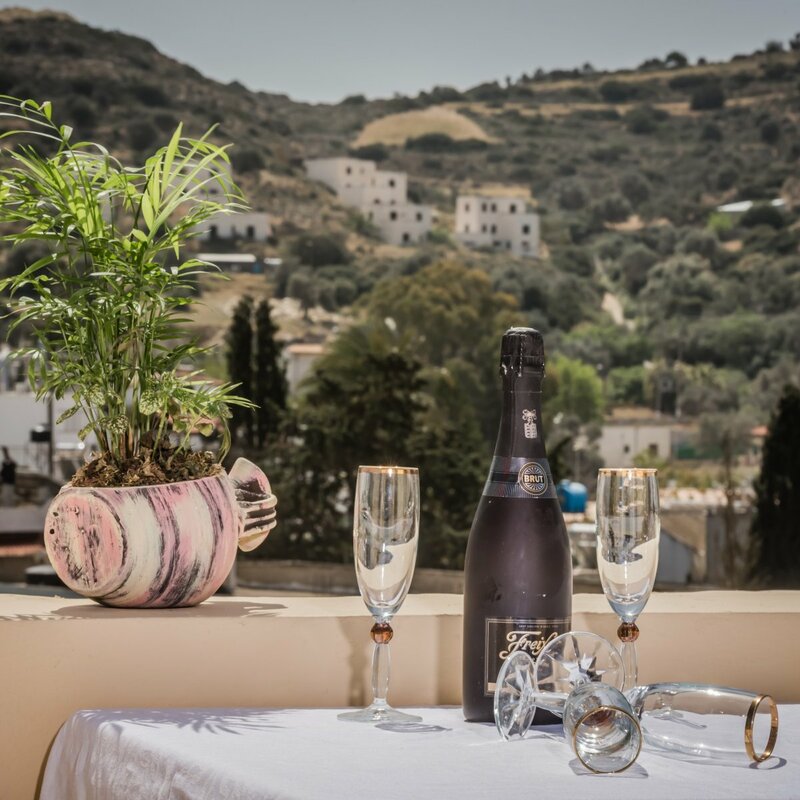 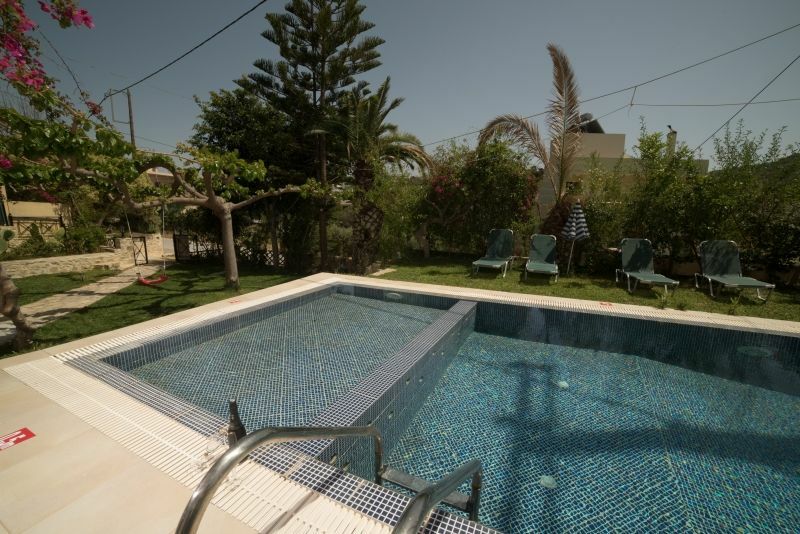 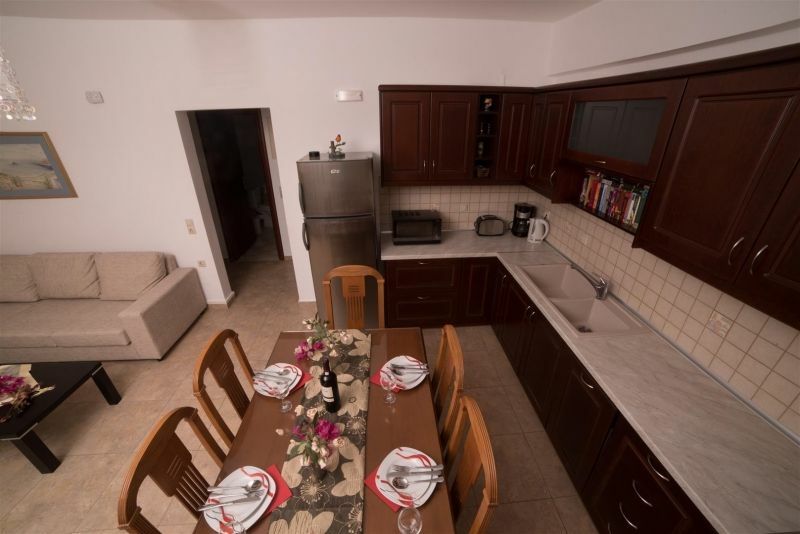 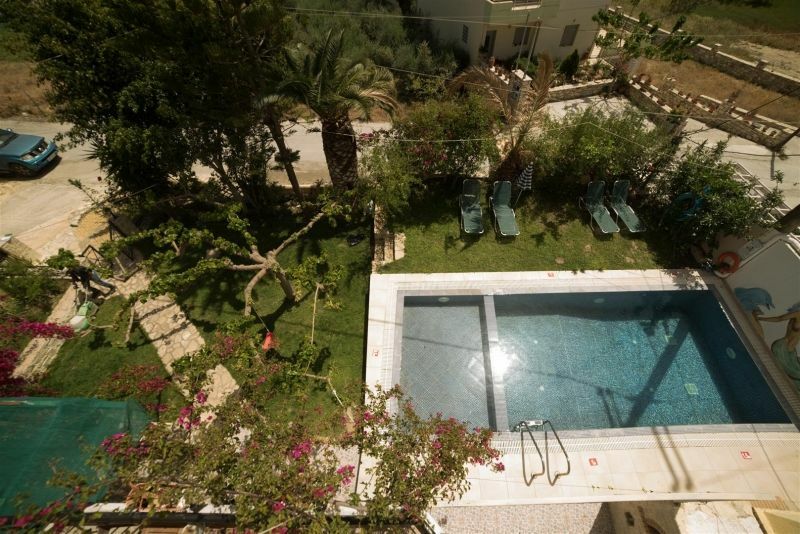 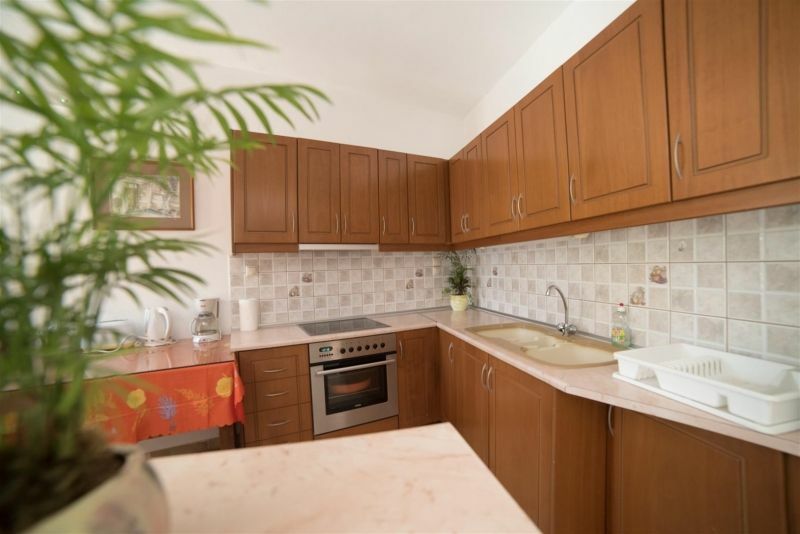 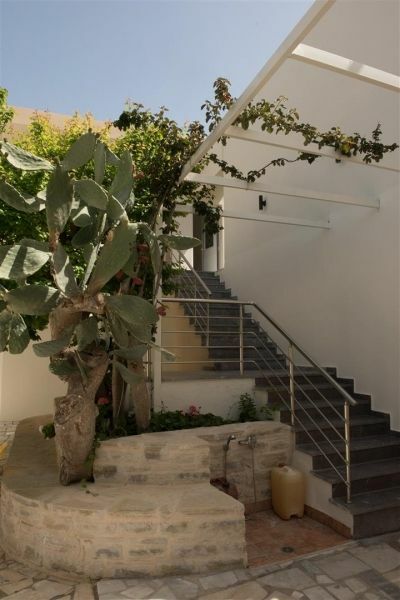 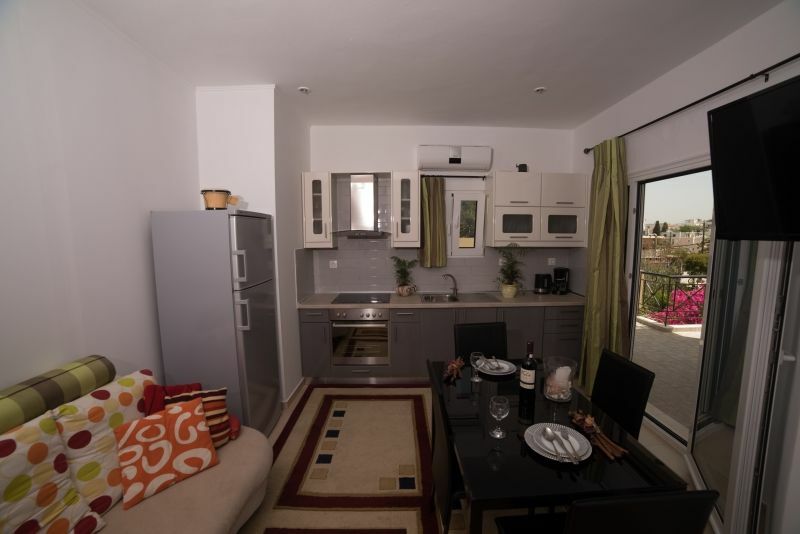 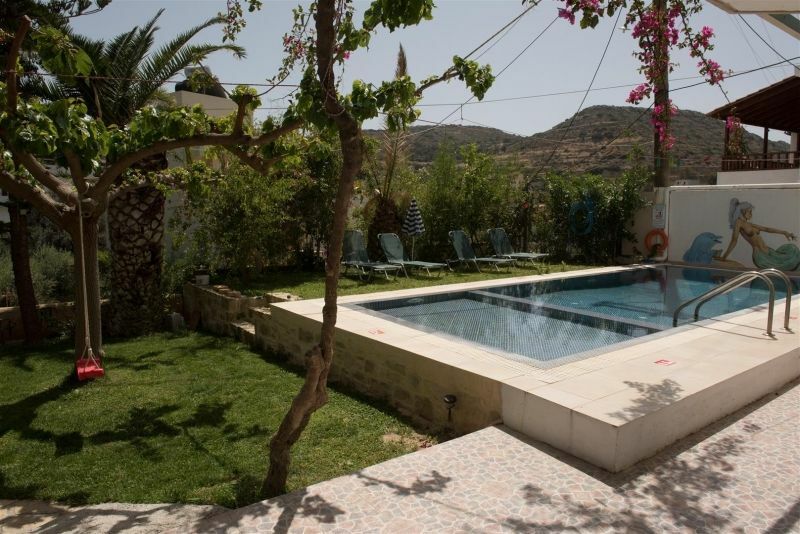 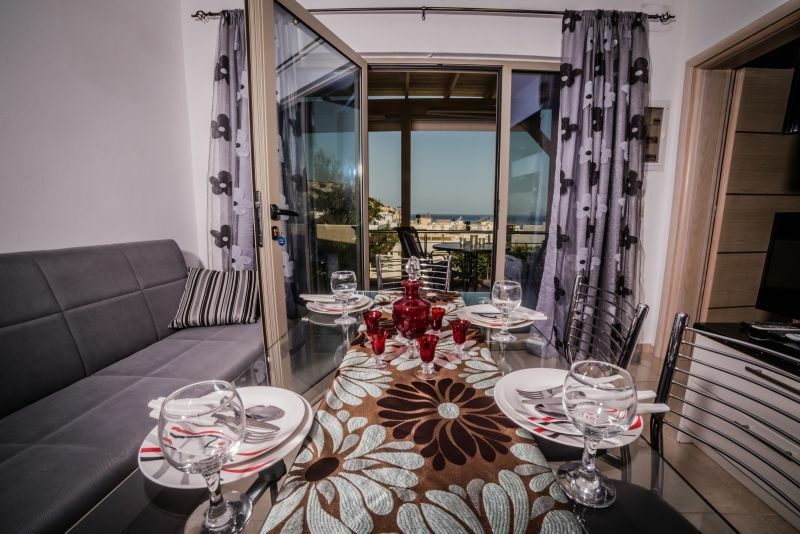 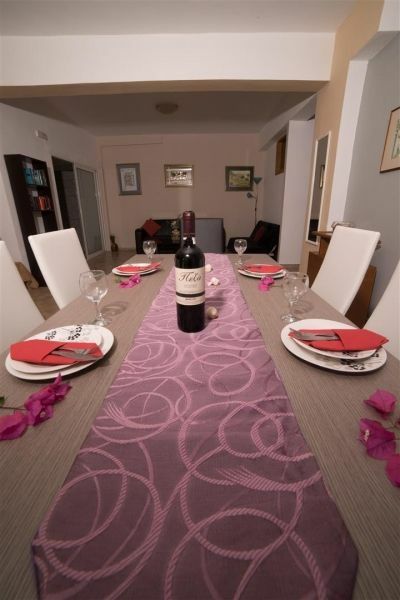 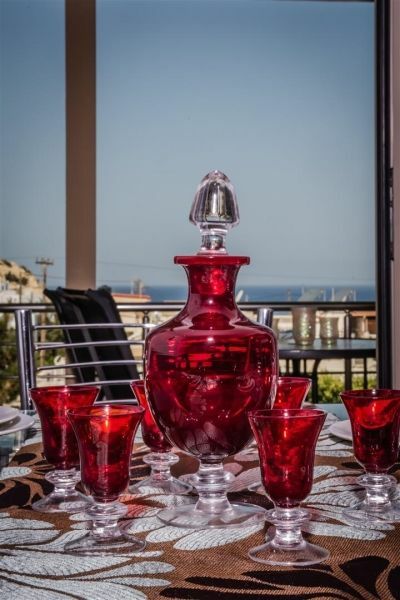 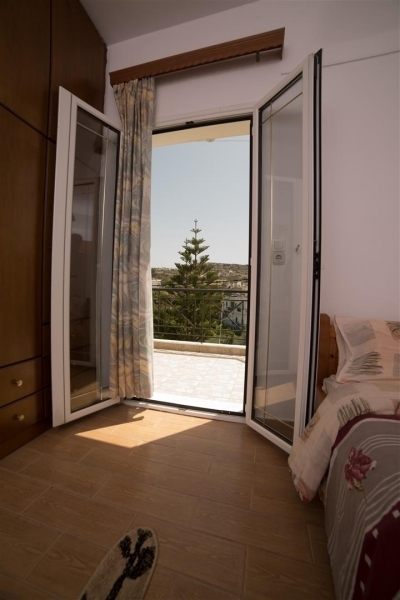 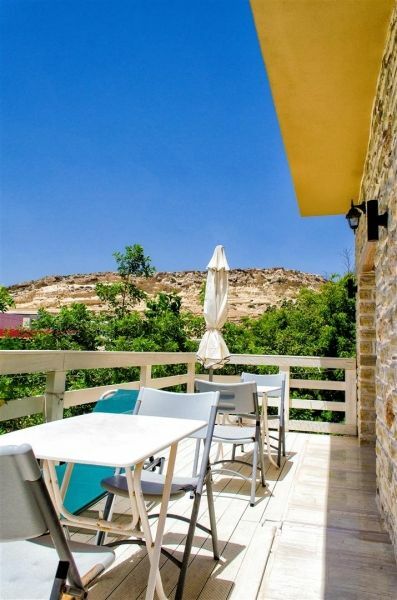 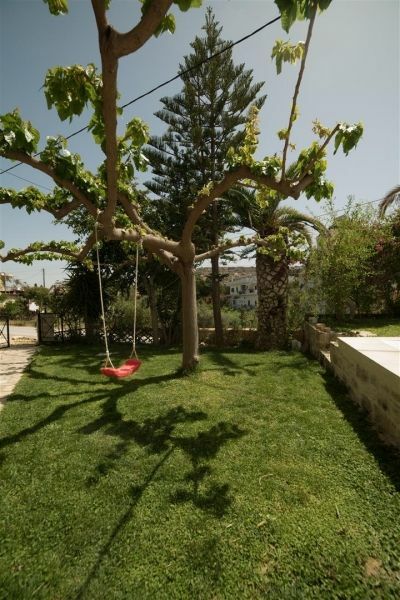 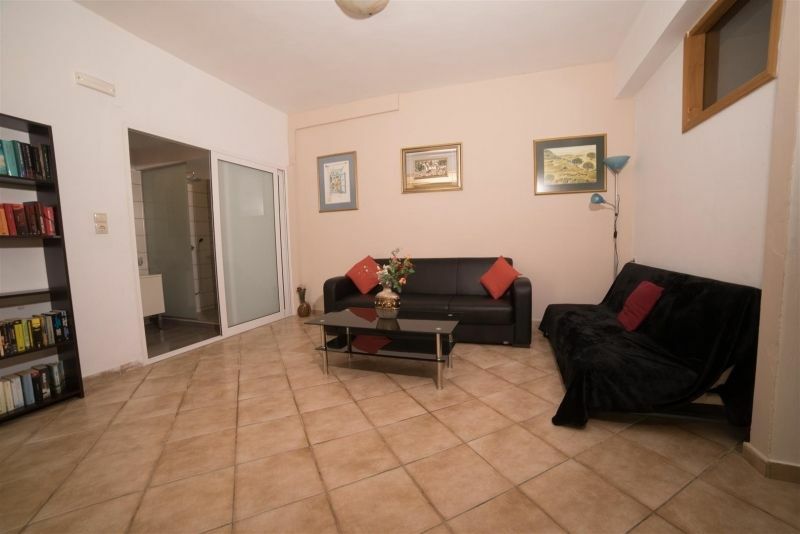 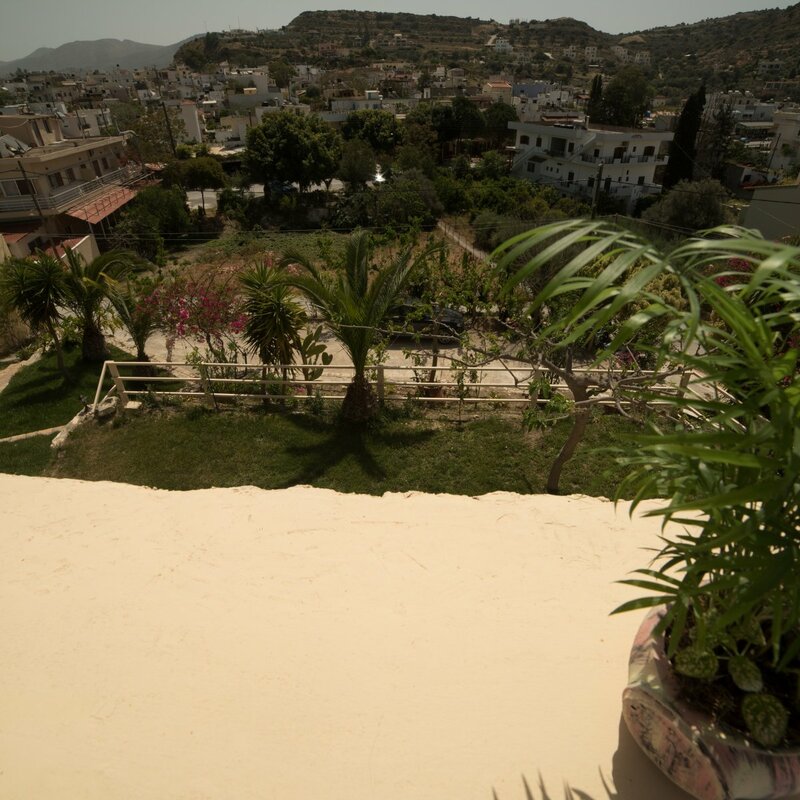 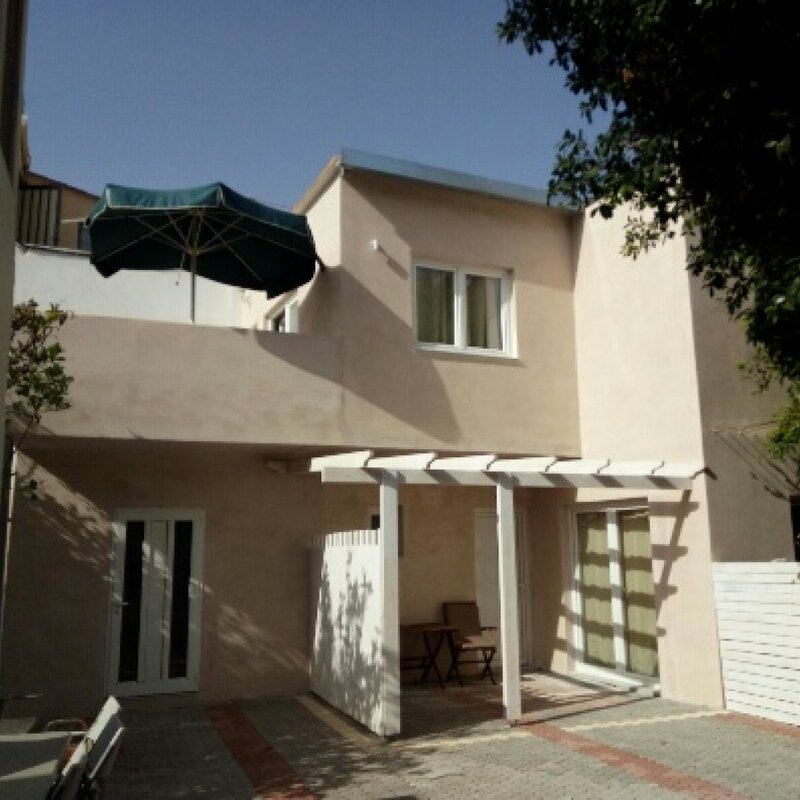 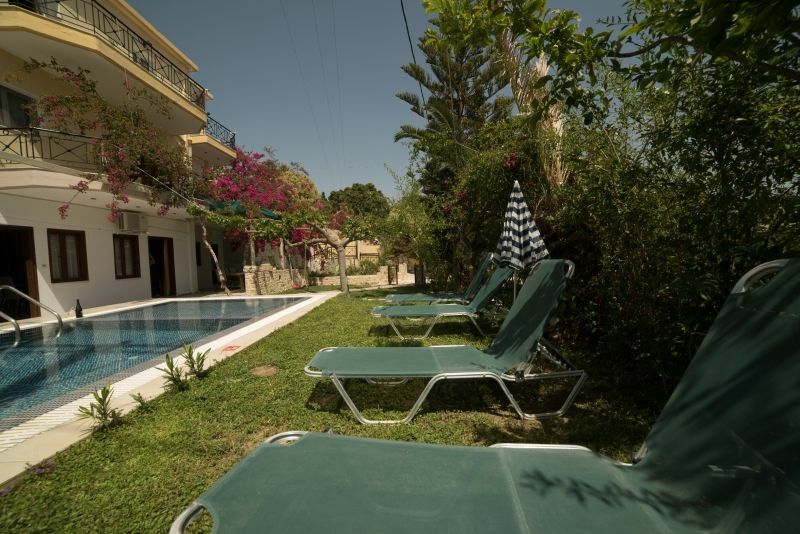 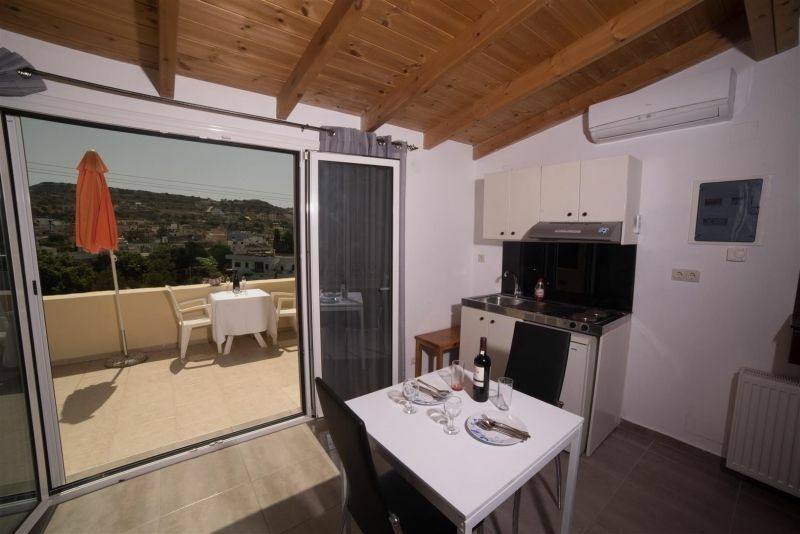 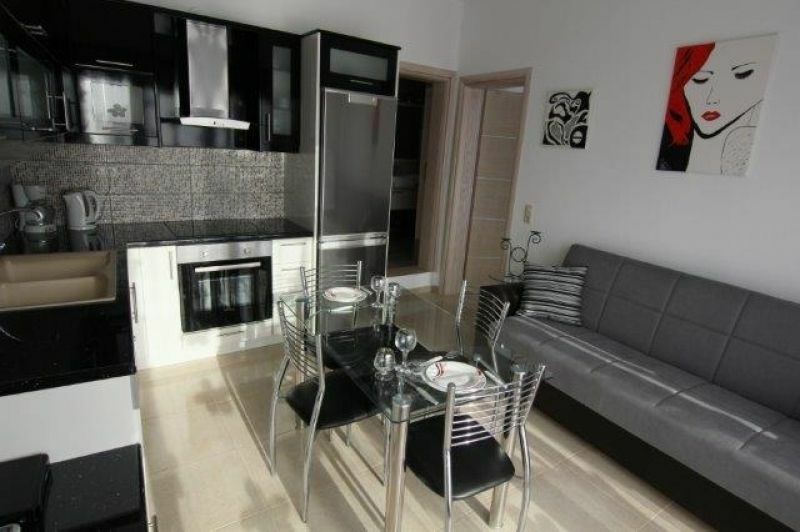 In the heart of Matala, 50m from the beach and the famous caves are the apartments Antonios 2. 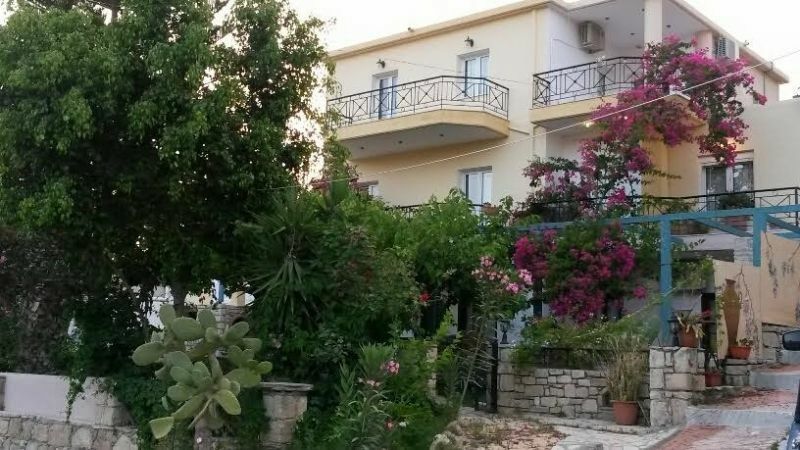 The apartments are located in a quiet road. 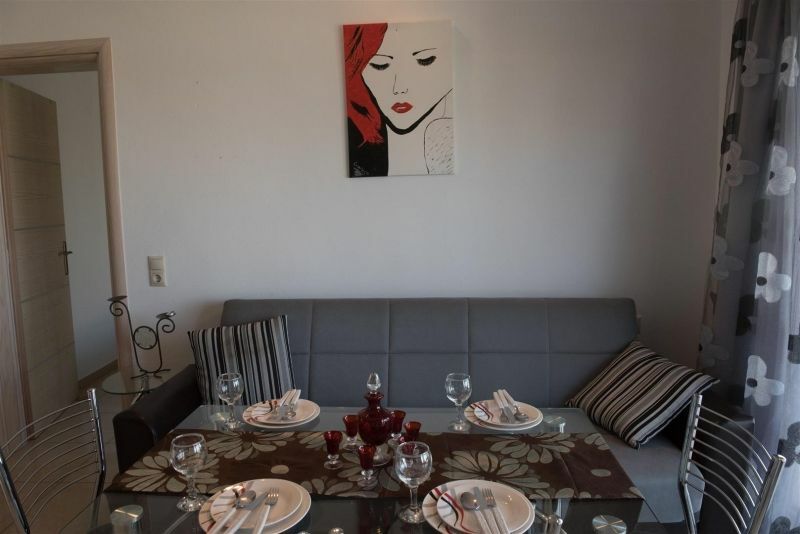 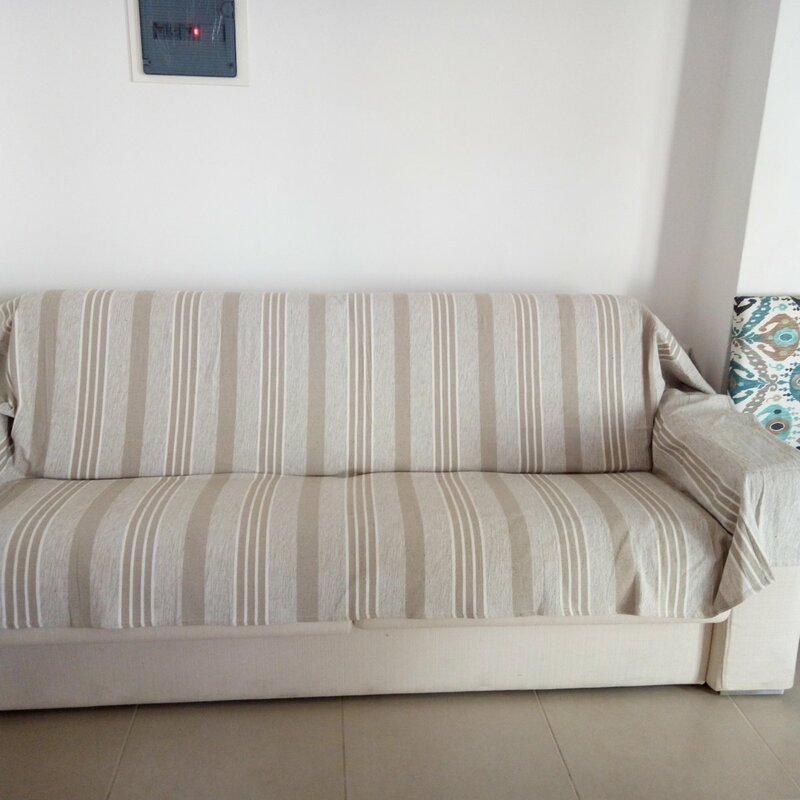 They have modern furniture and they are suitable for up to 2 people. 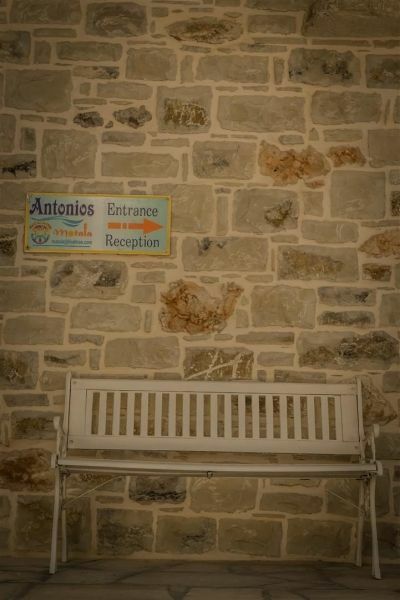 0.00 €Reception function 12 hours.